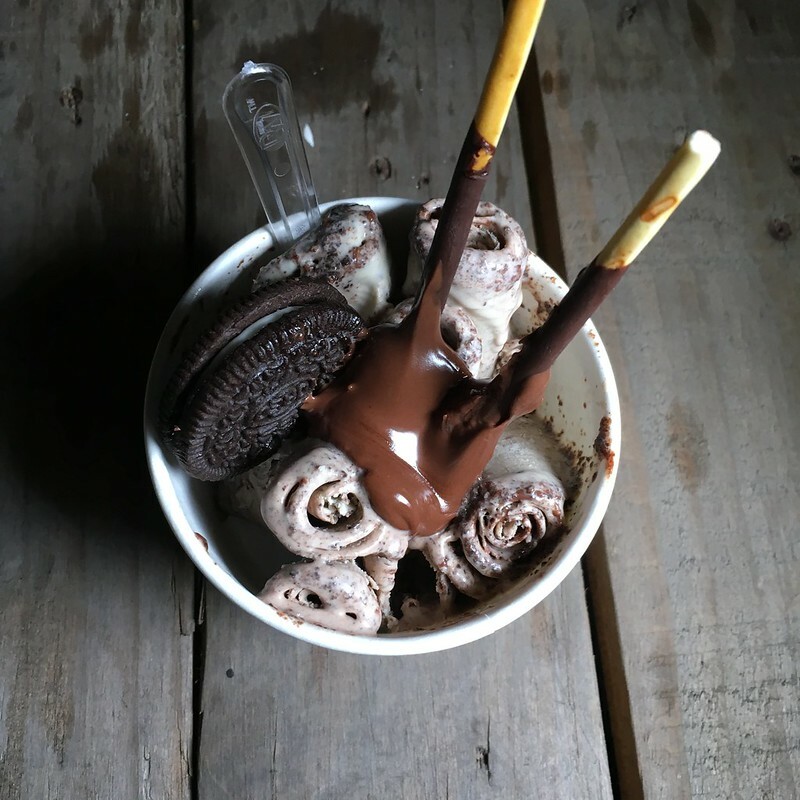 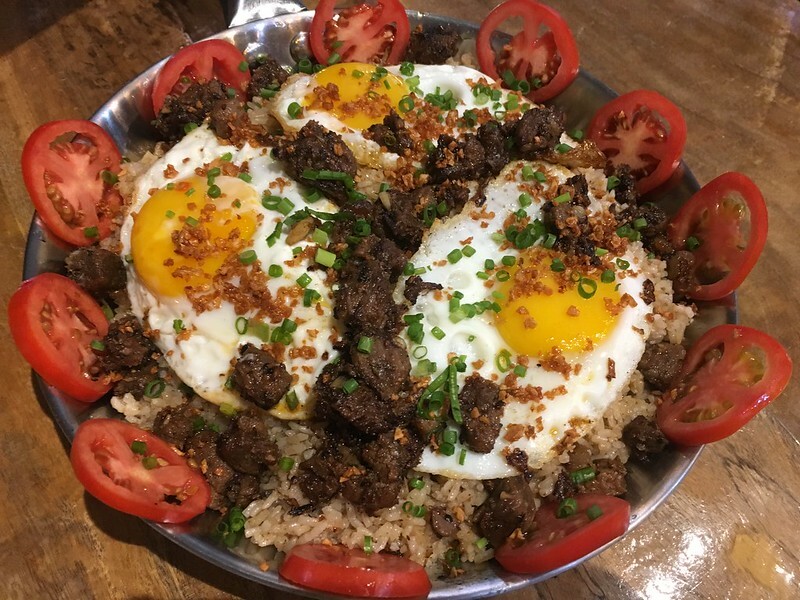 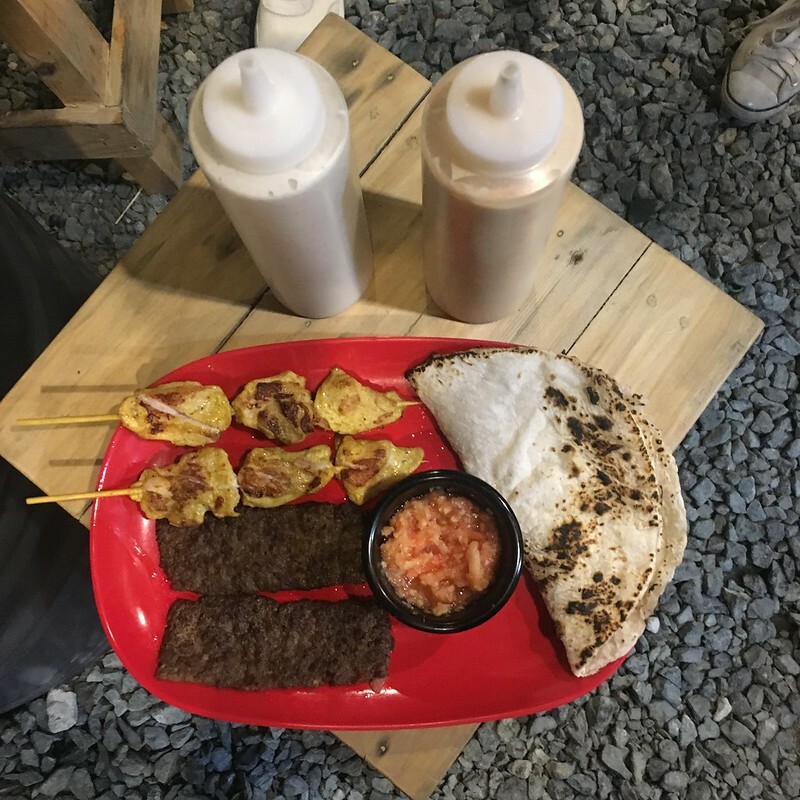 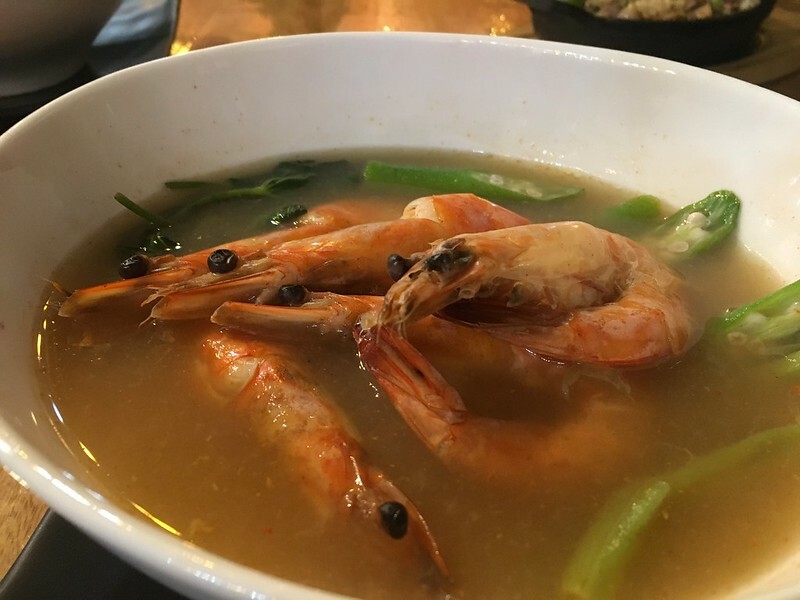 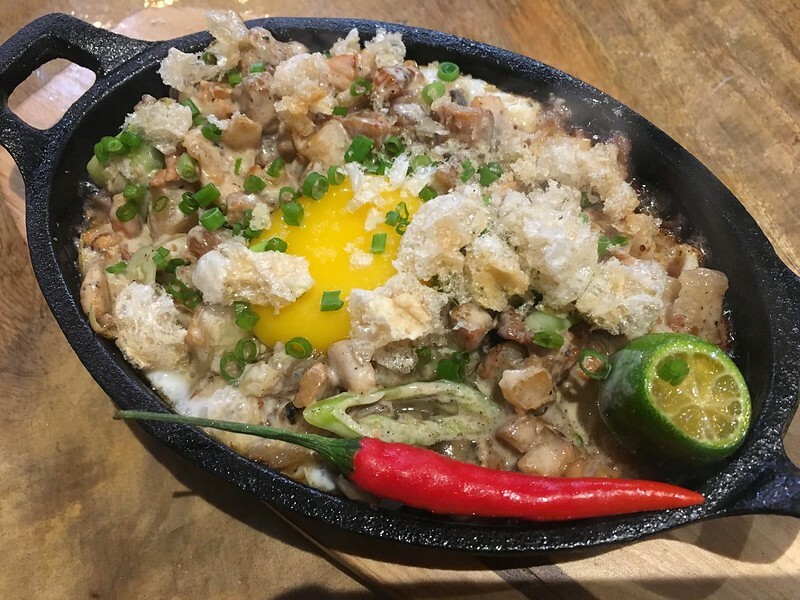 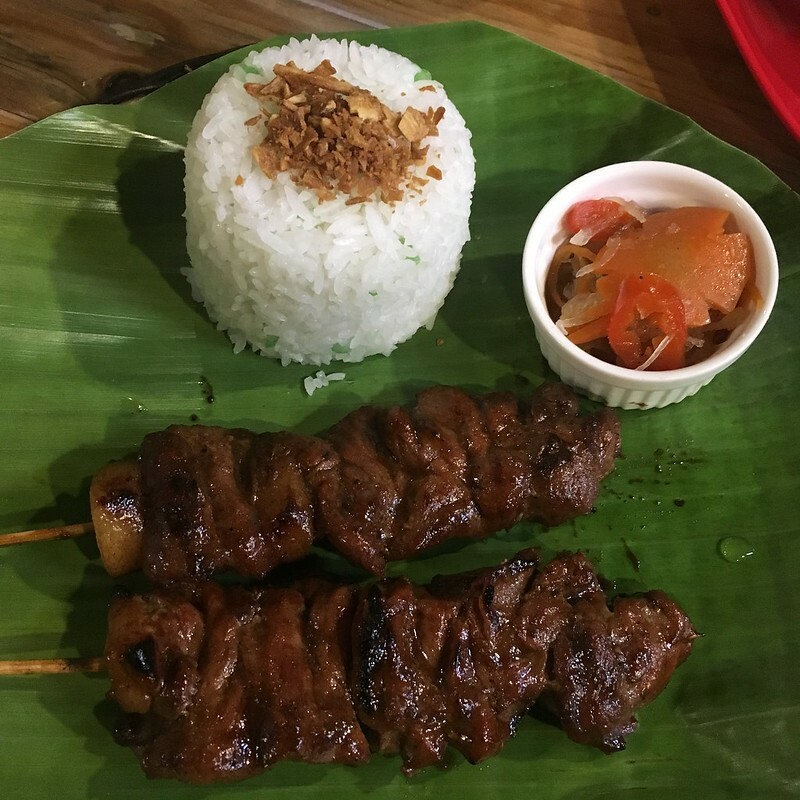 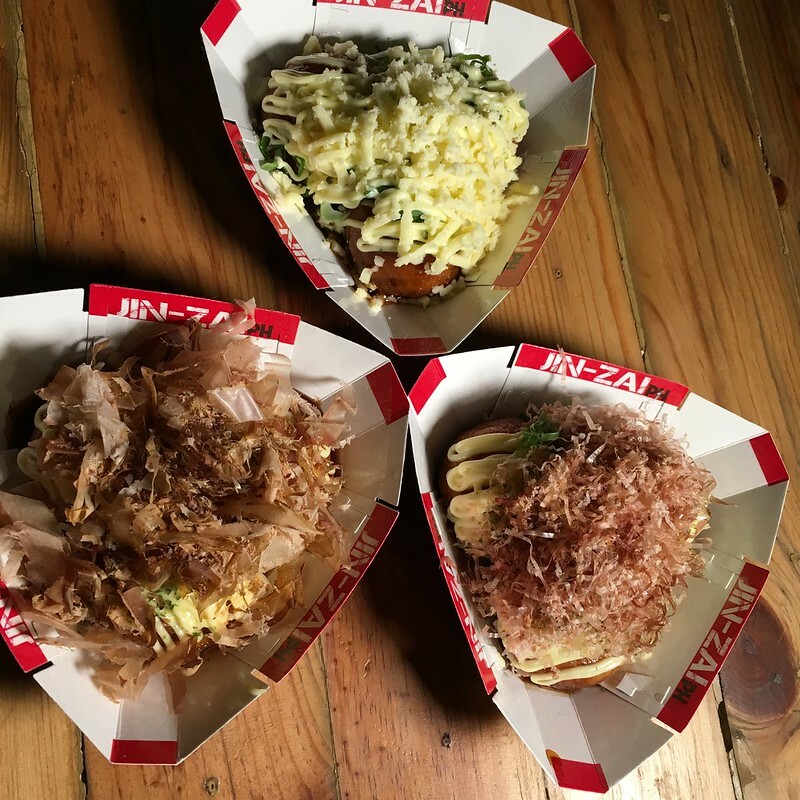 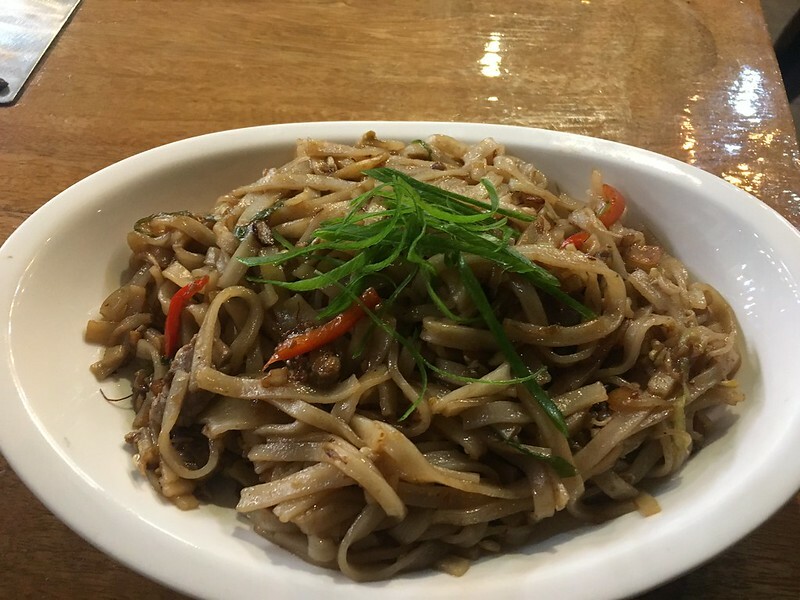 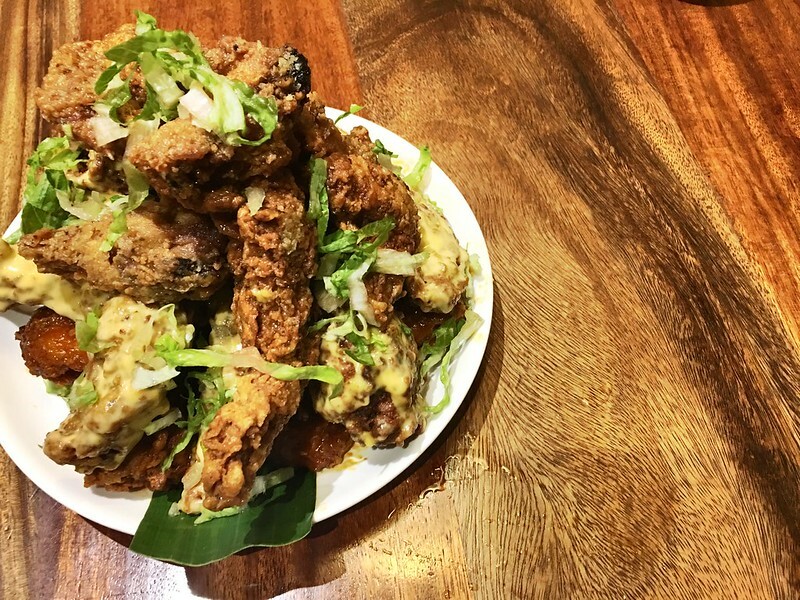 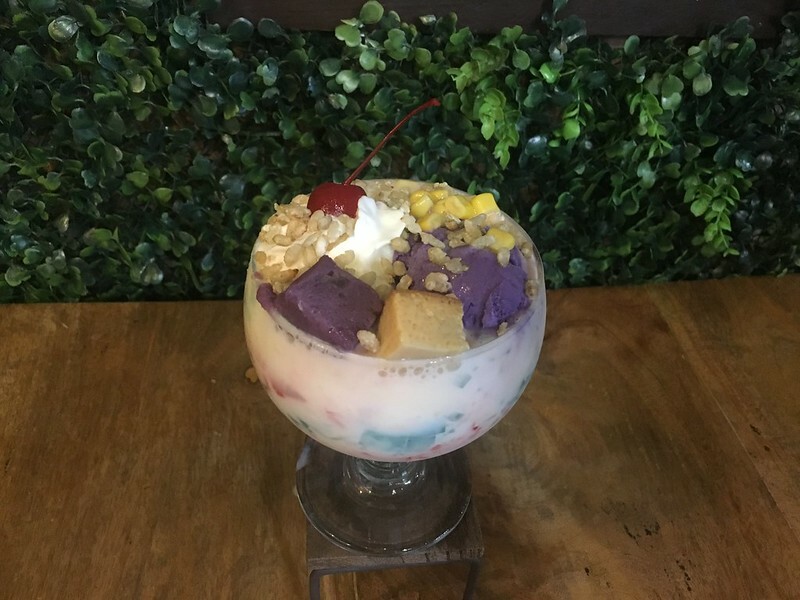 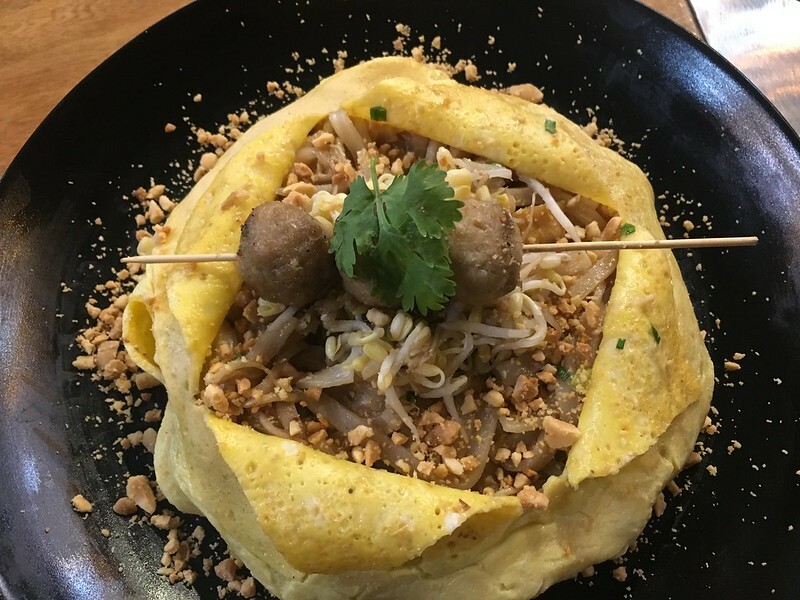 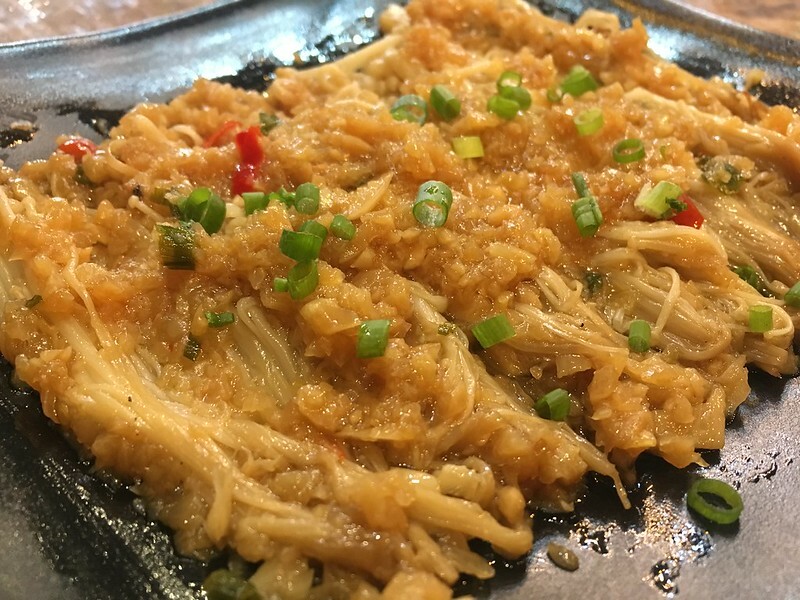 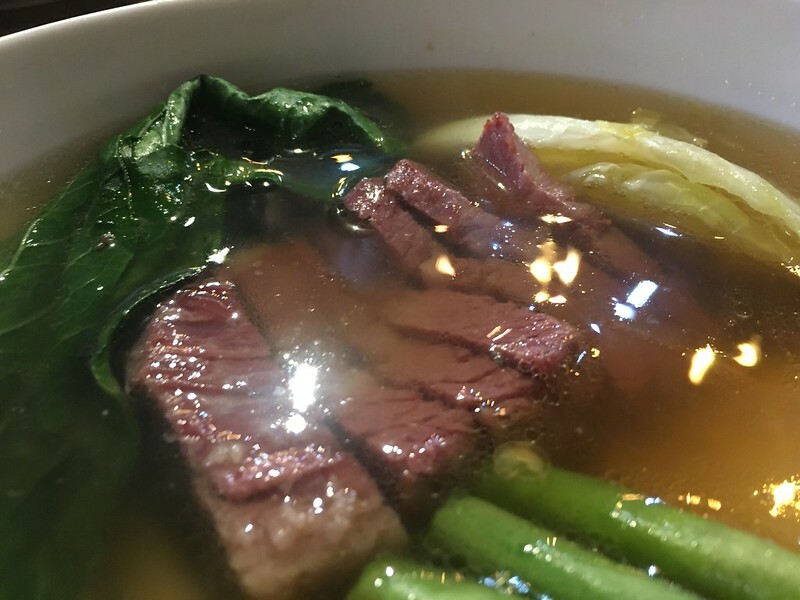 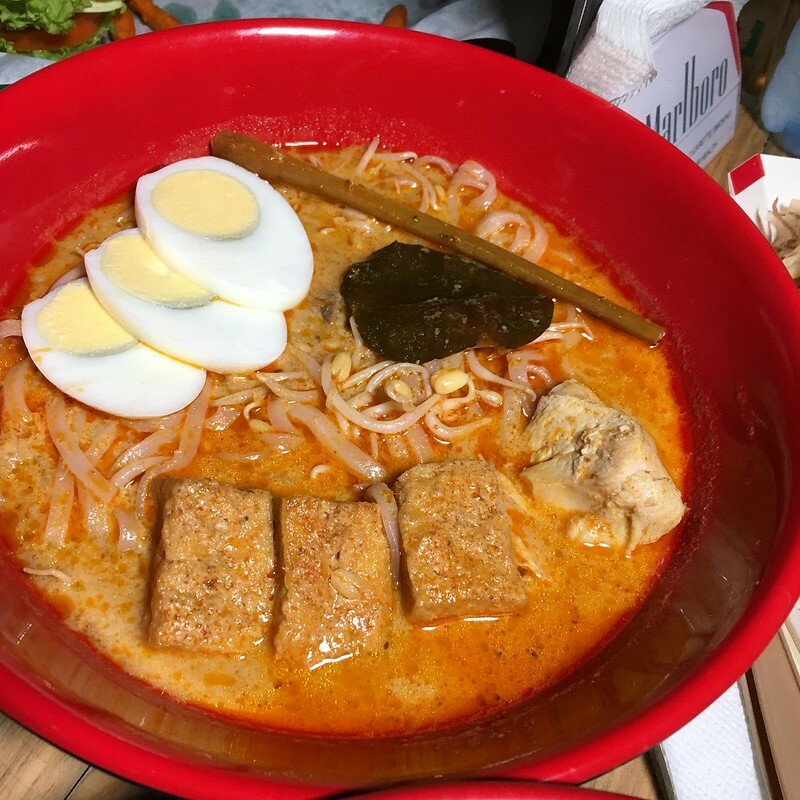 Kapitolyo is considered to be the foodie haven of Pasig, the city’s answer to QC’s Maginhawa Street and Marikina’s Lilac Street. 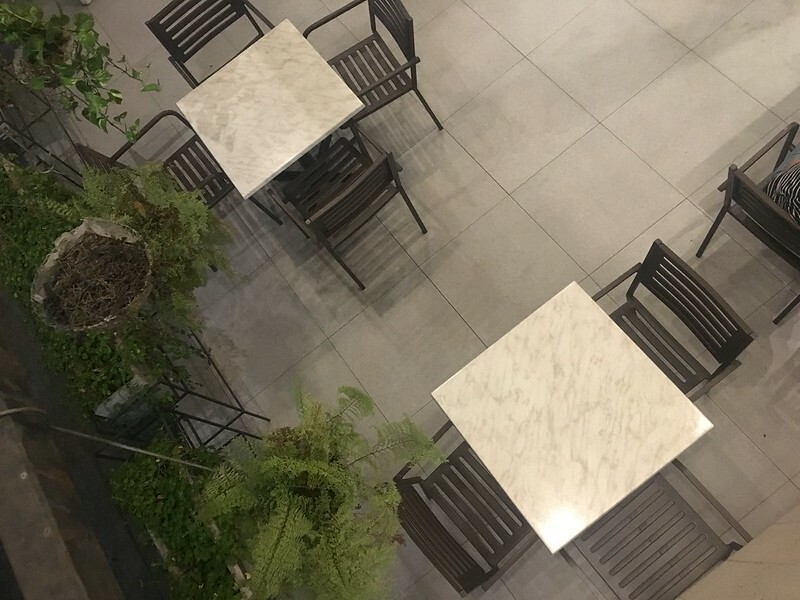 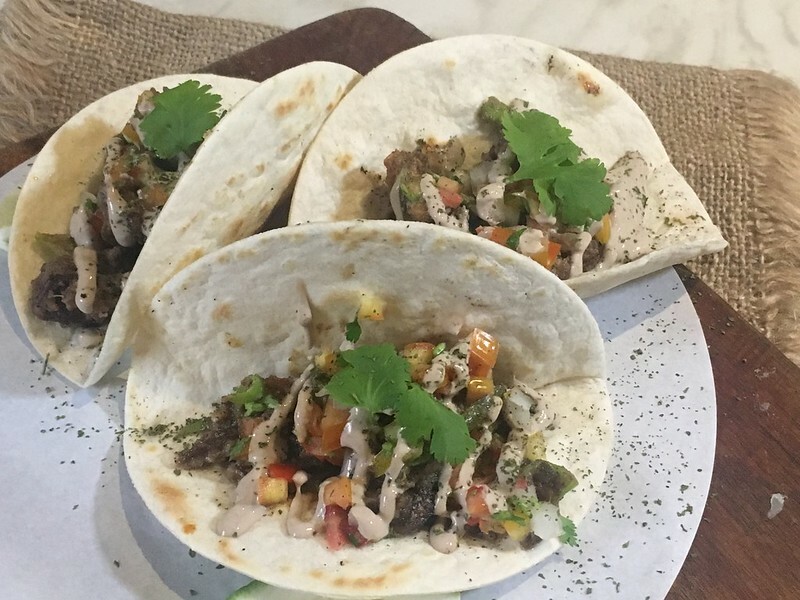 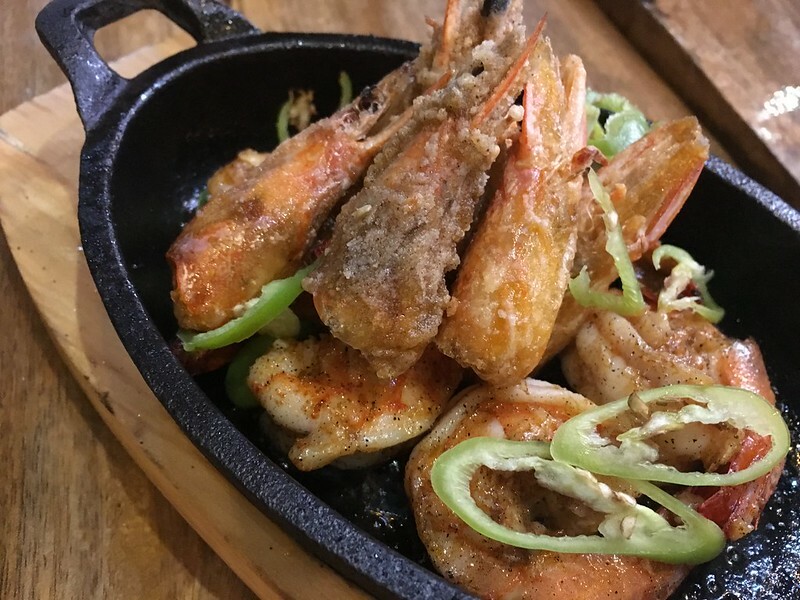 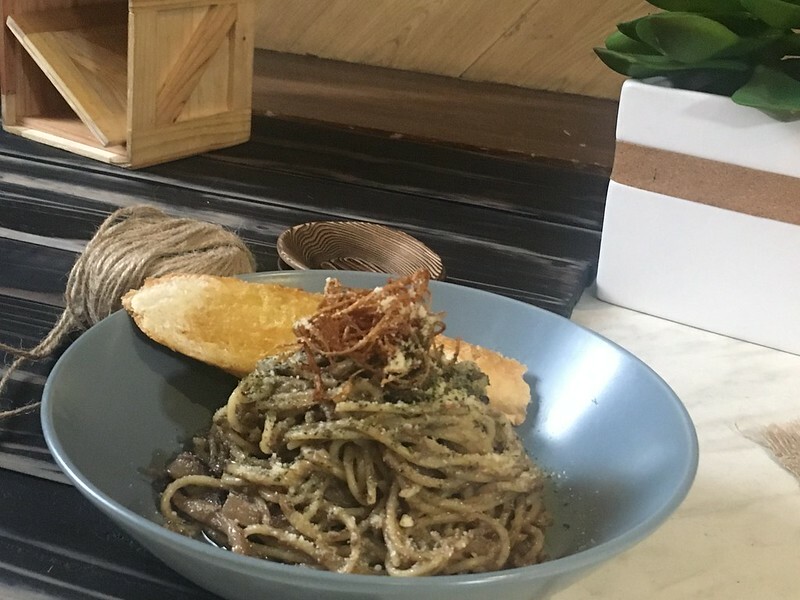 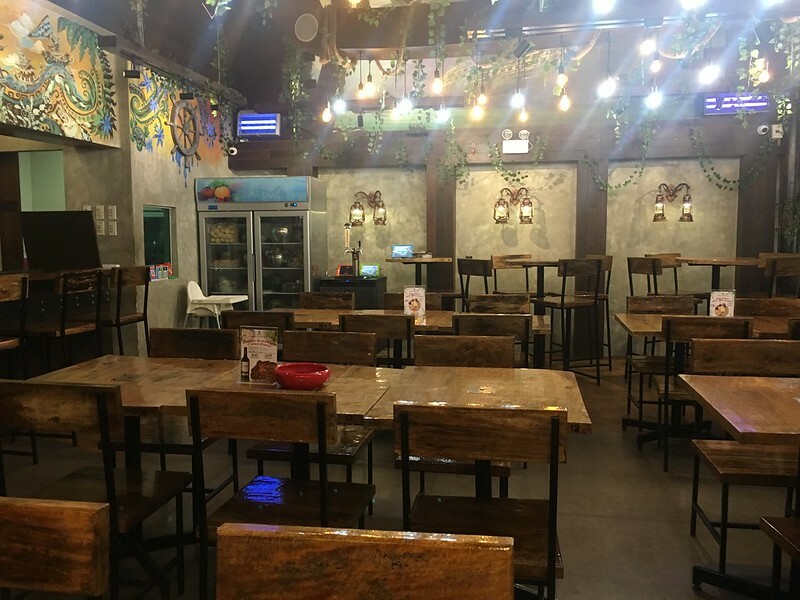 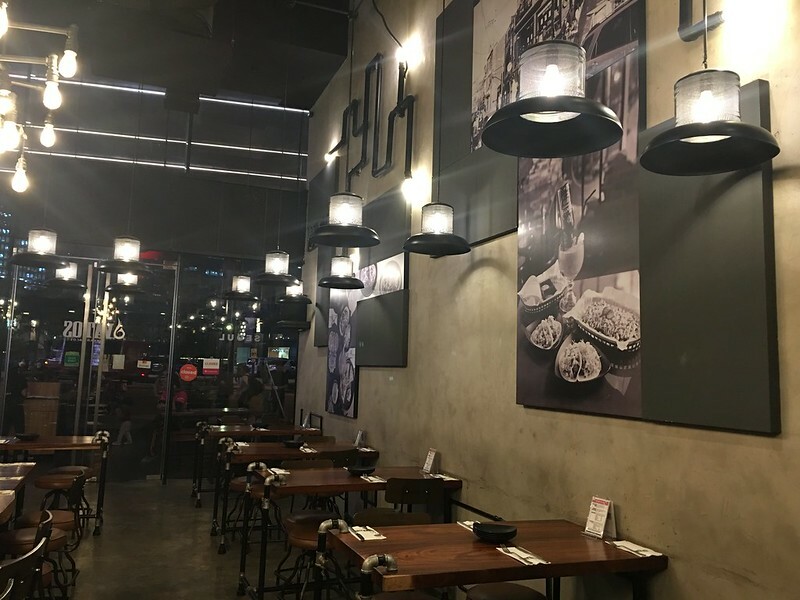 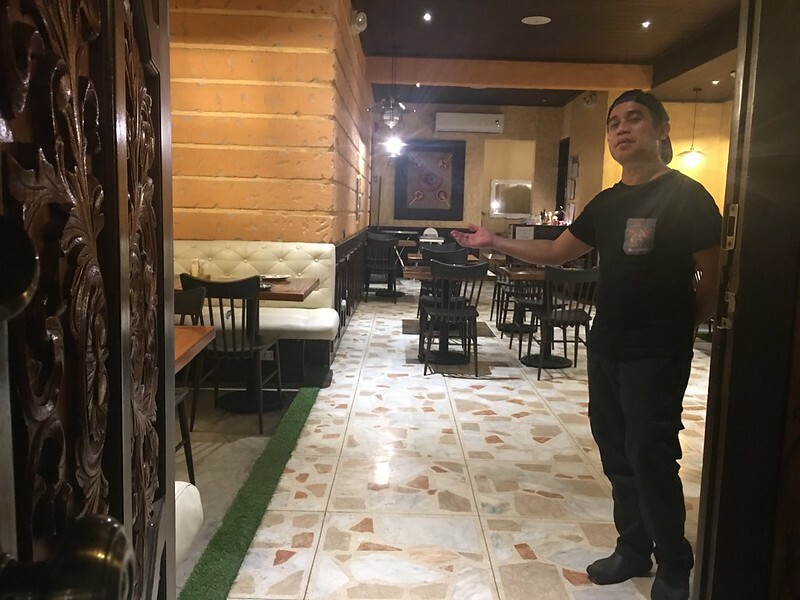 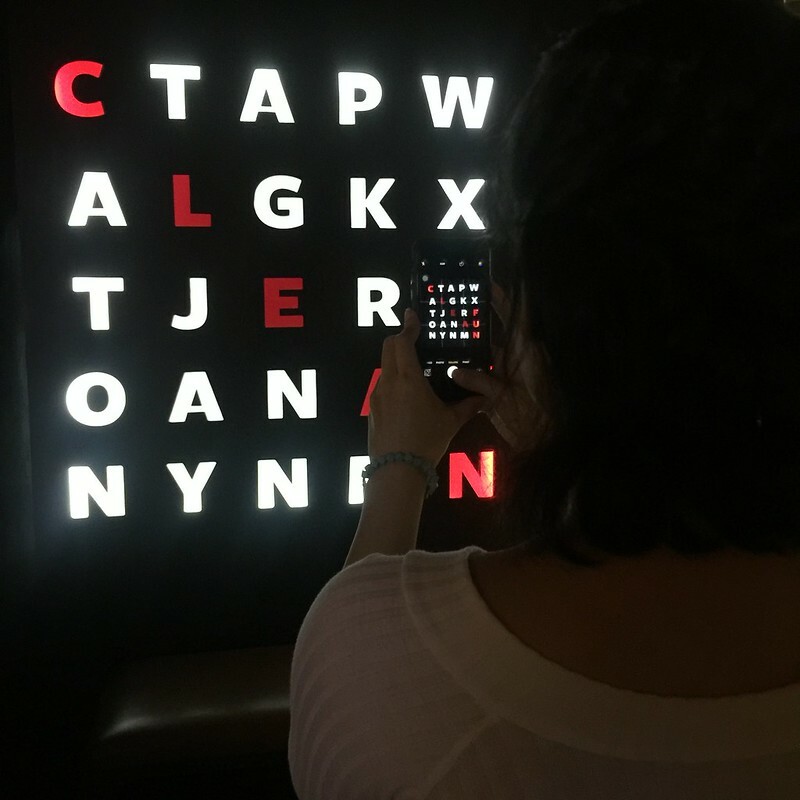 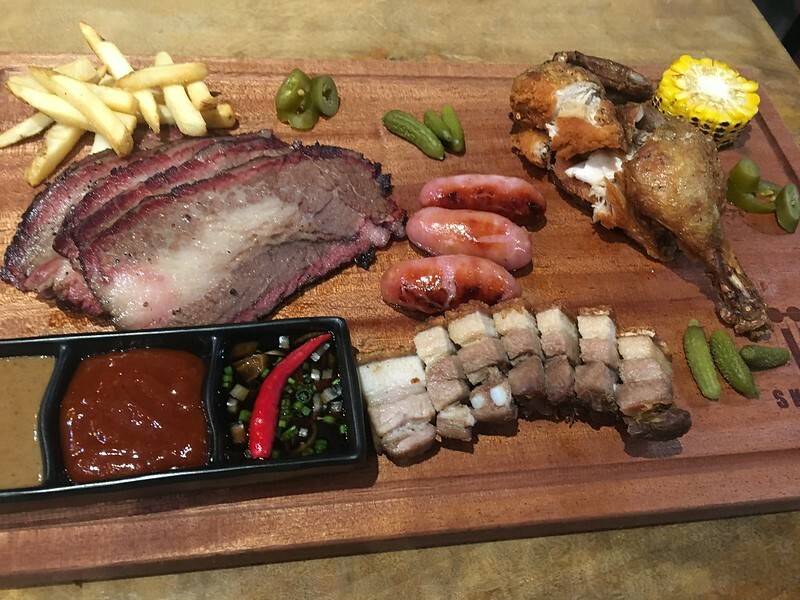 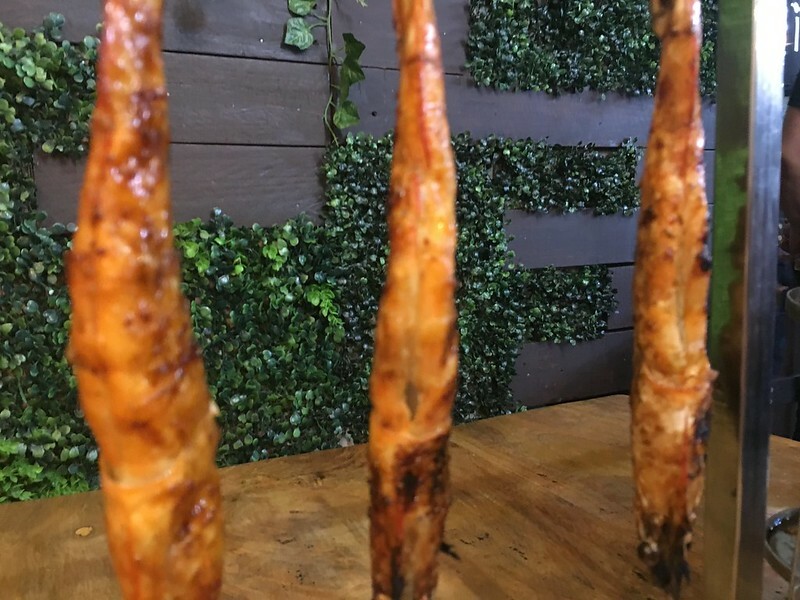 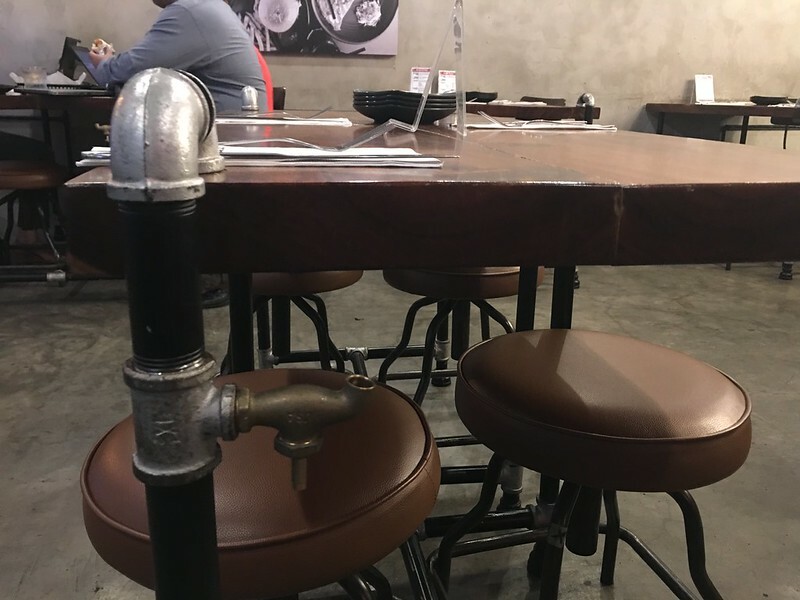 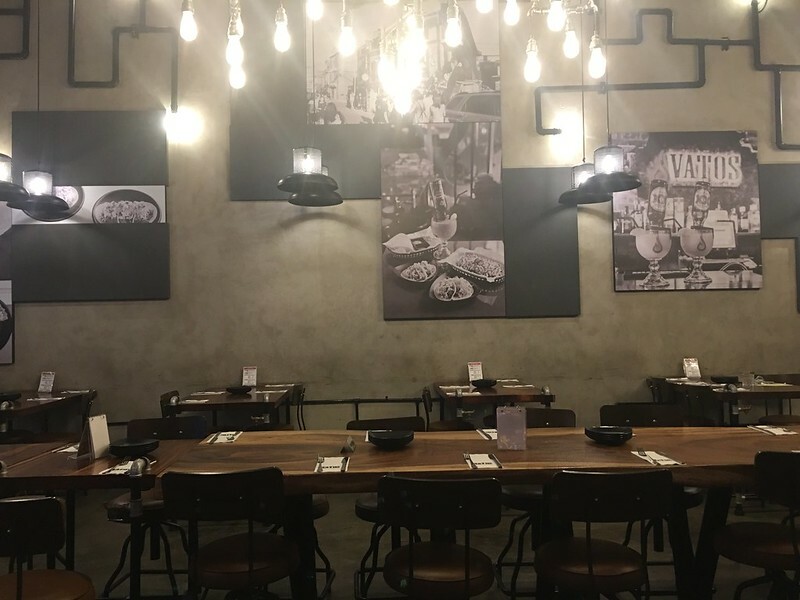 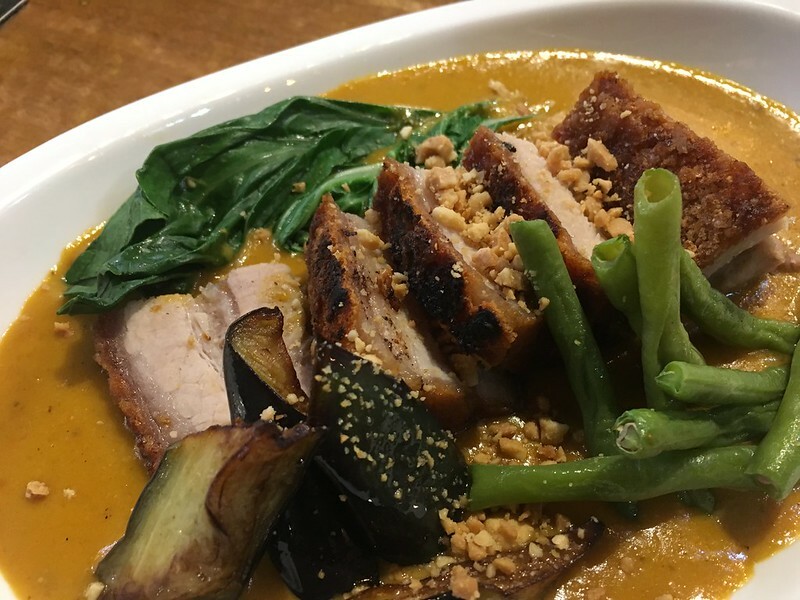 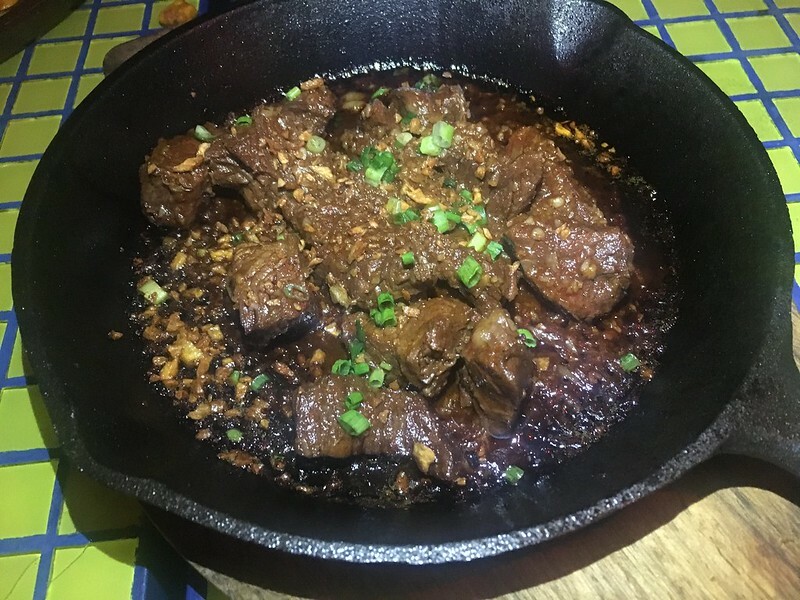 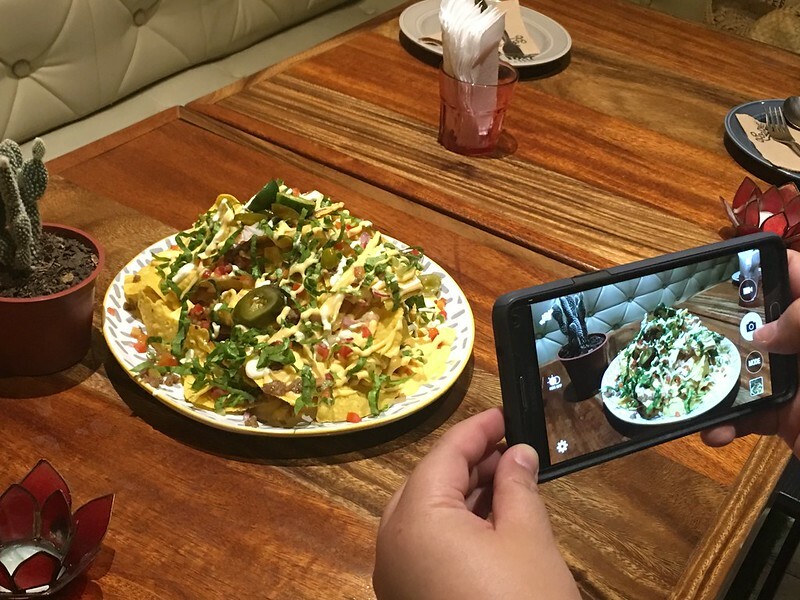 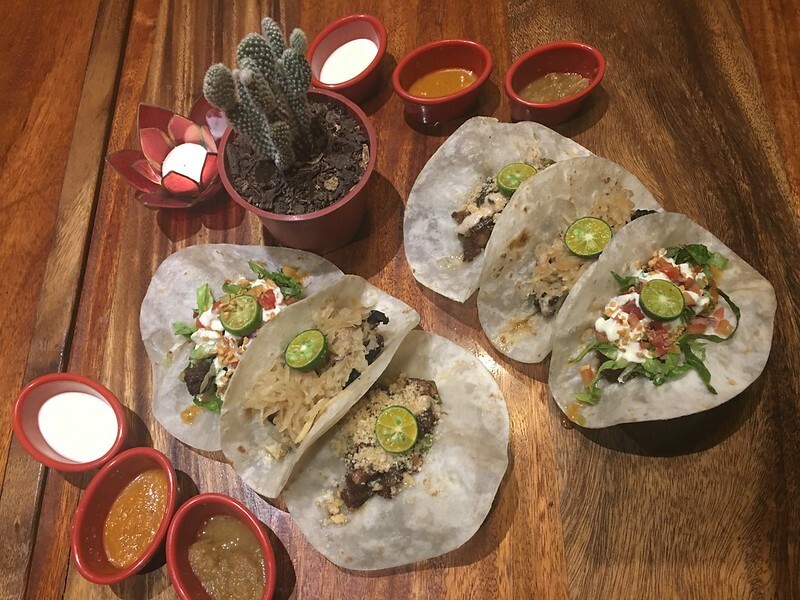 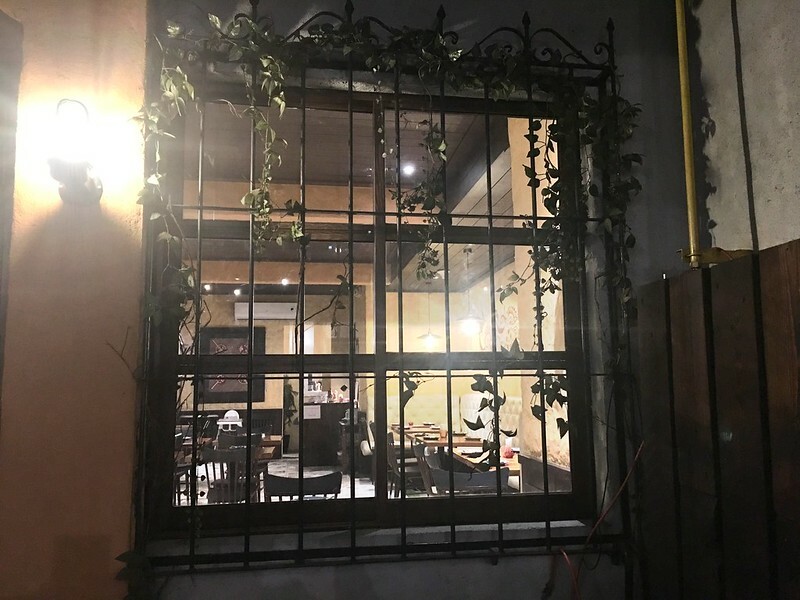 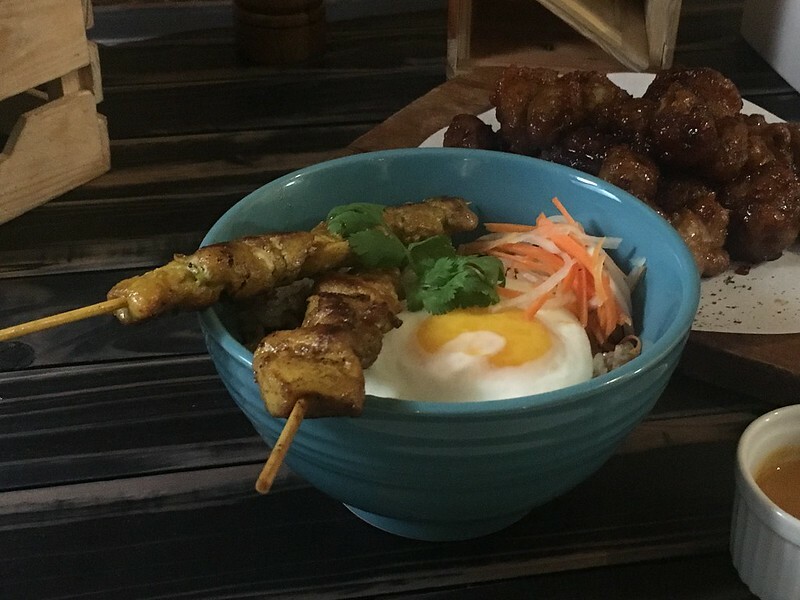 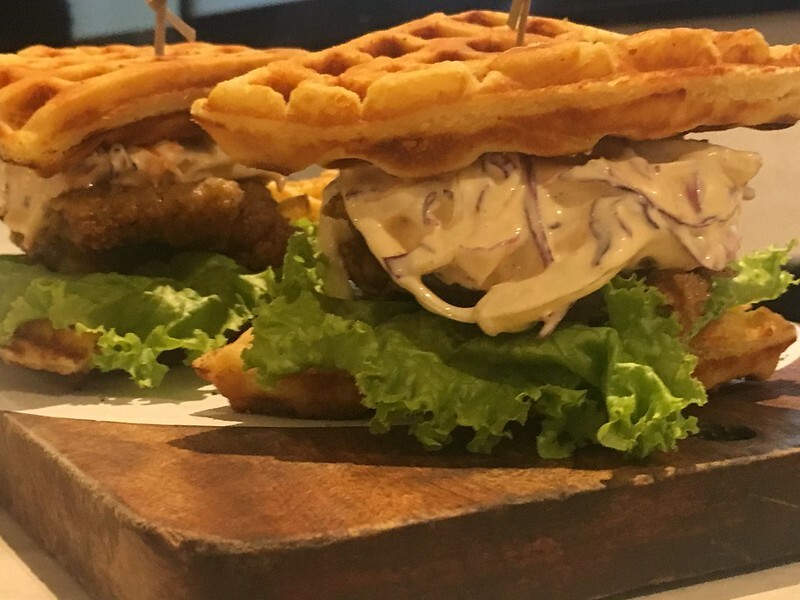 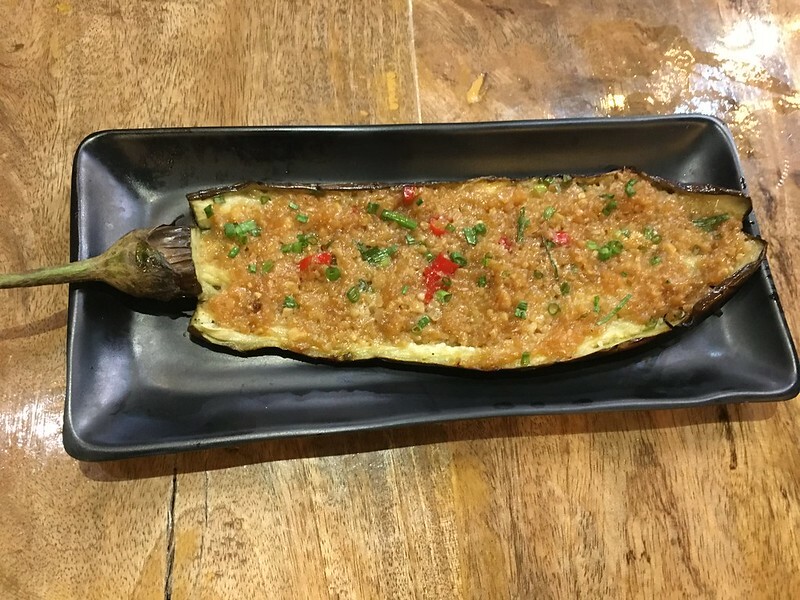 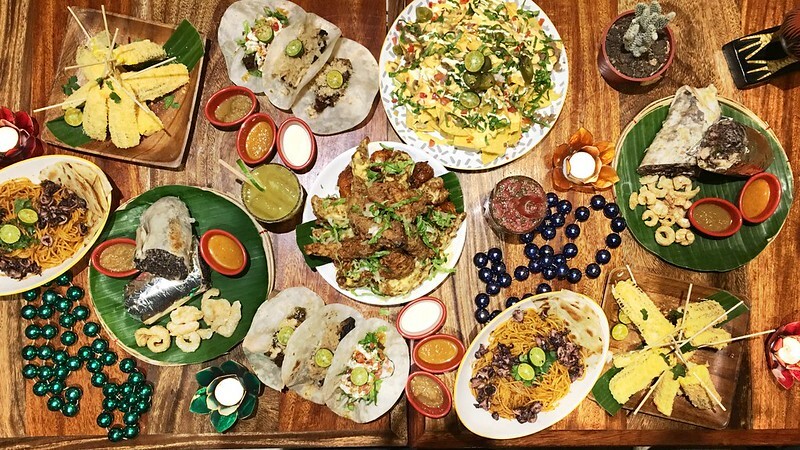 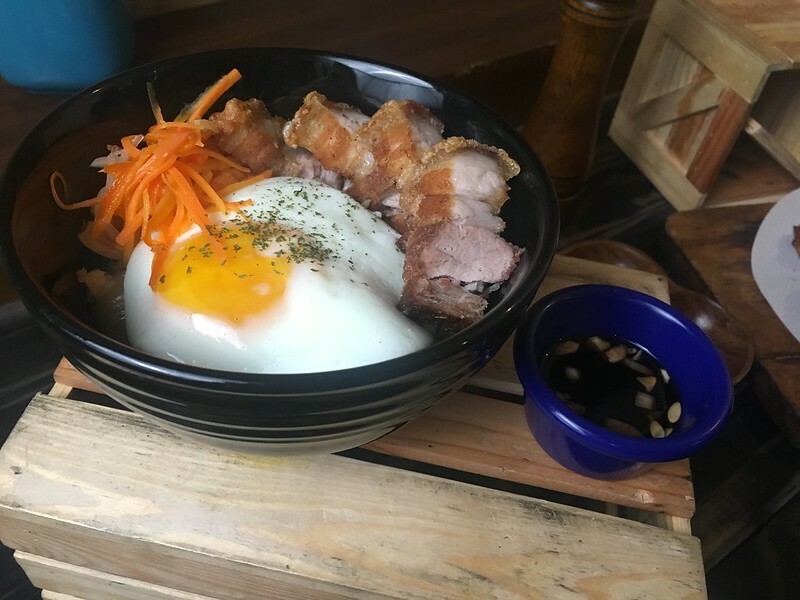 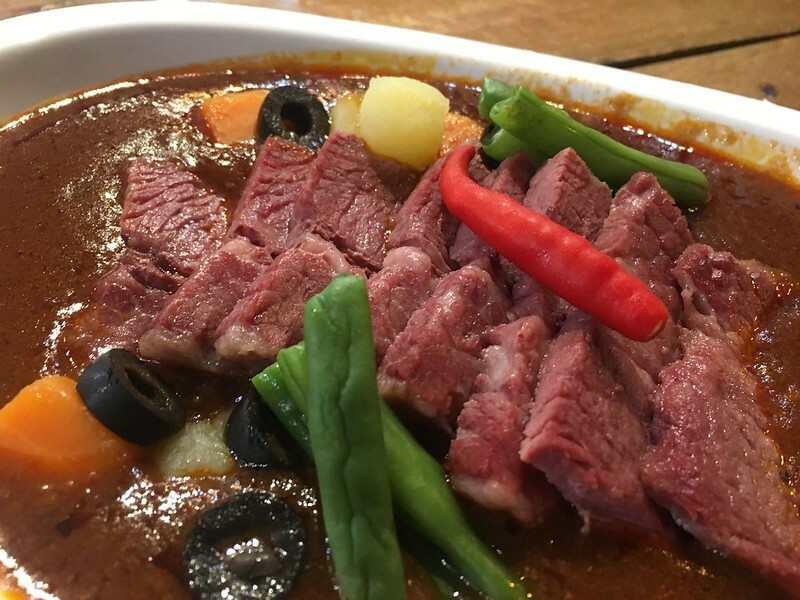 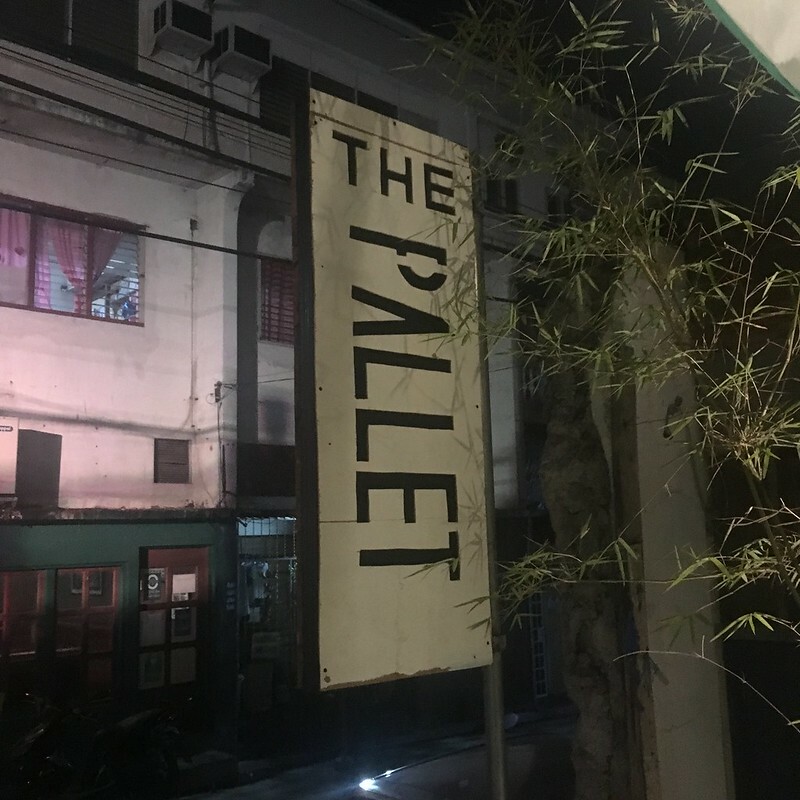 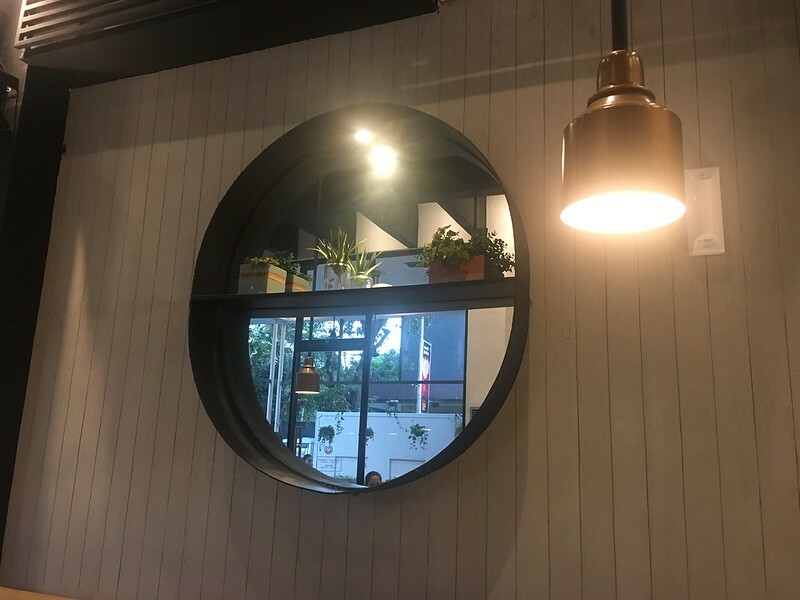 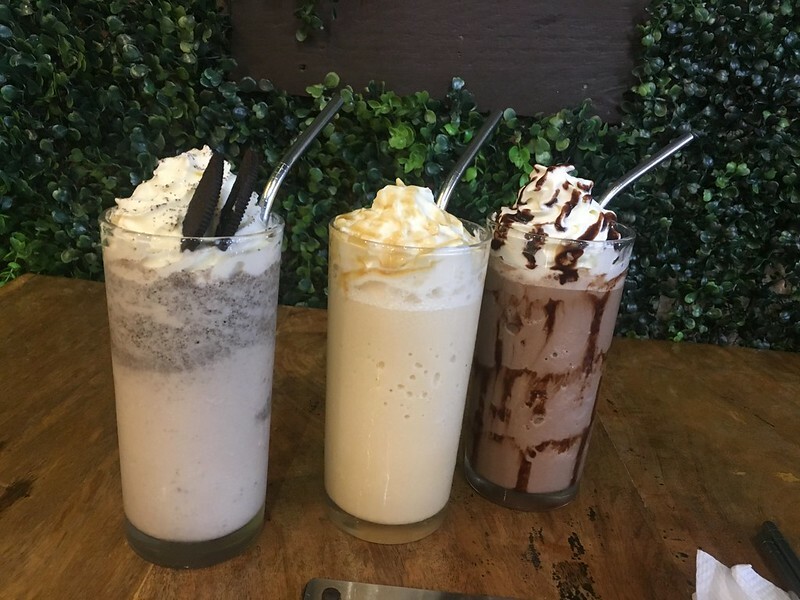 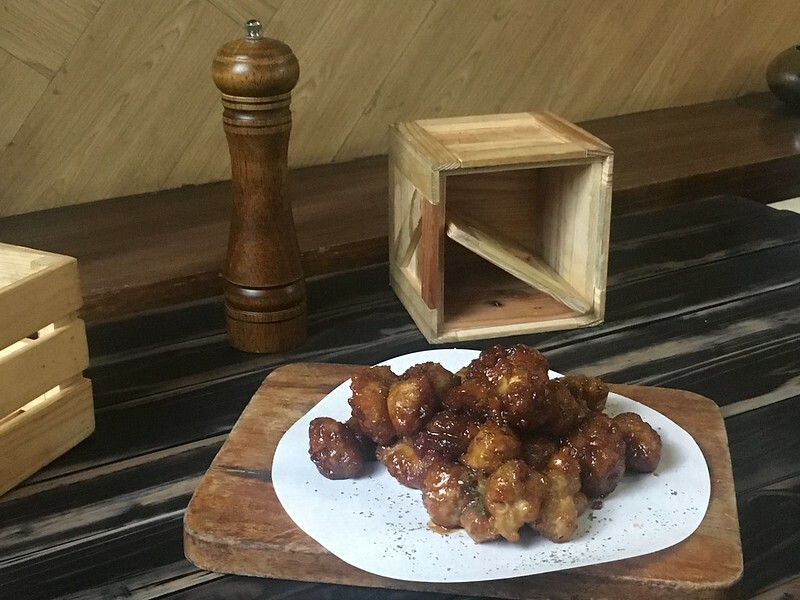 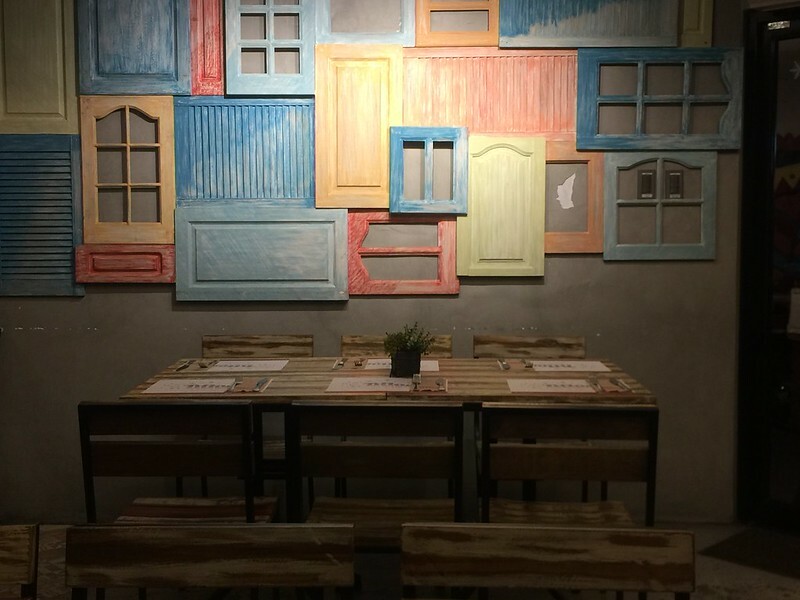 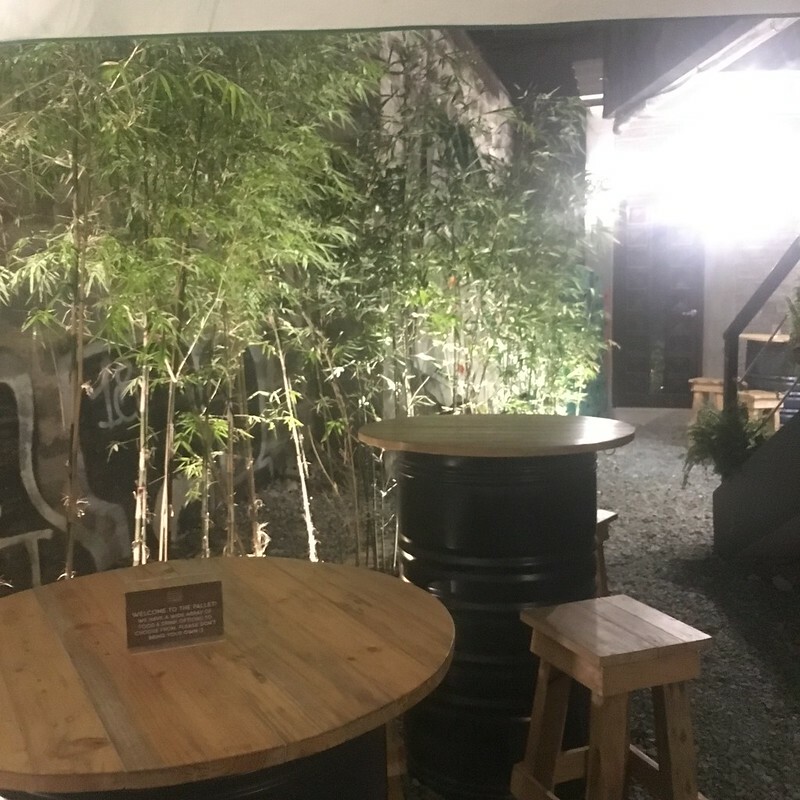 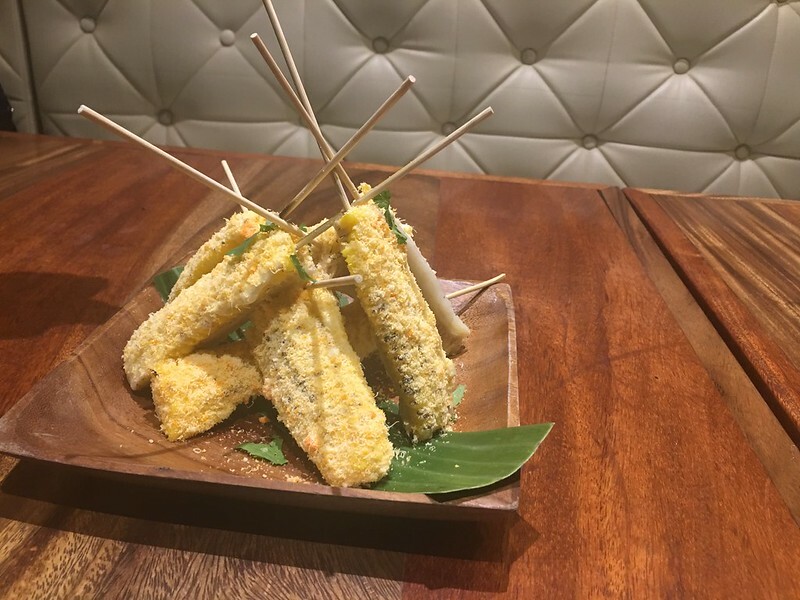 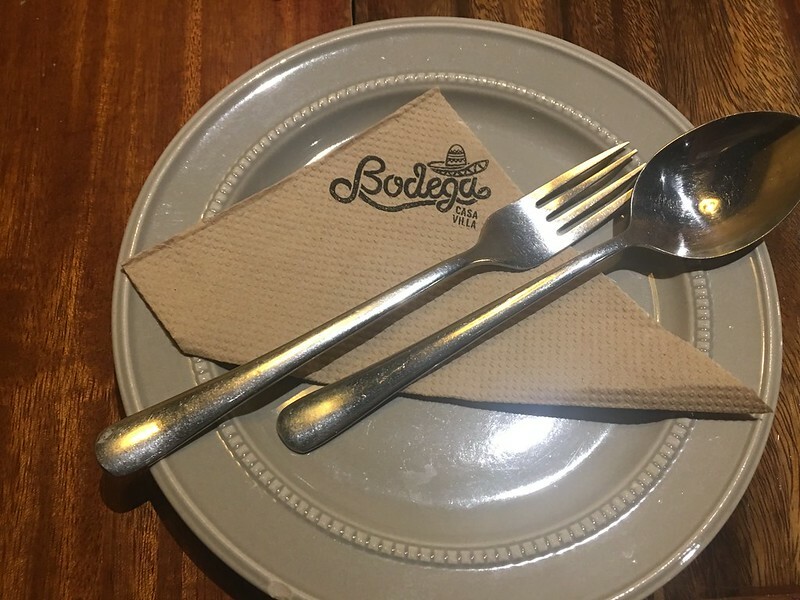 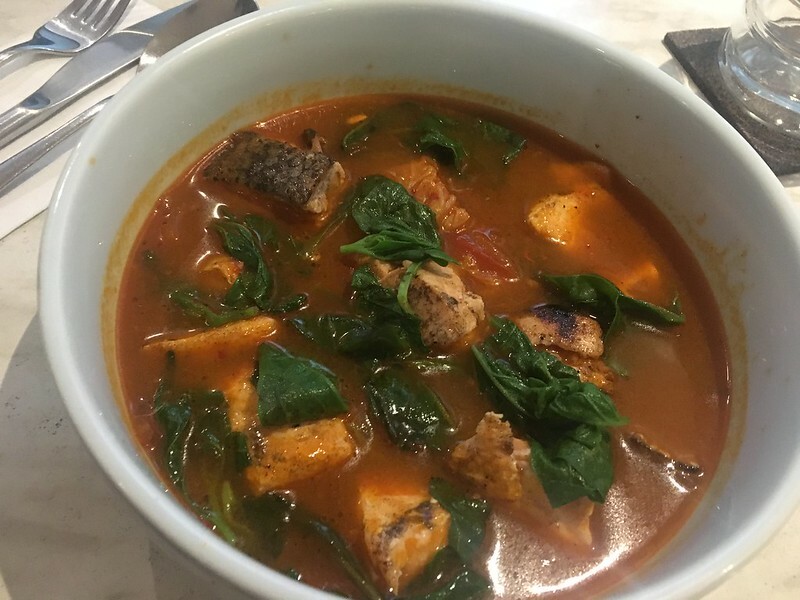 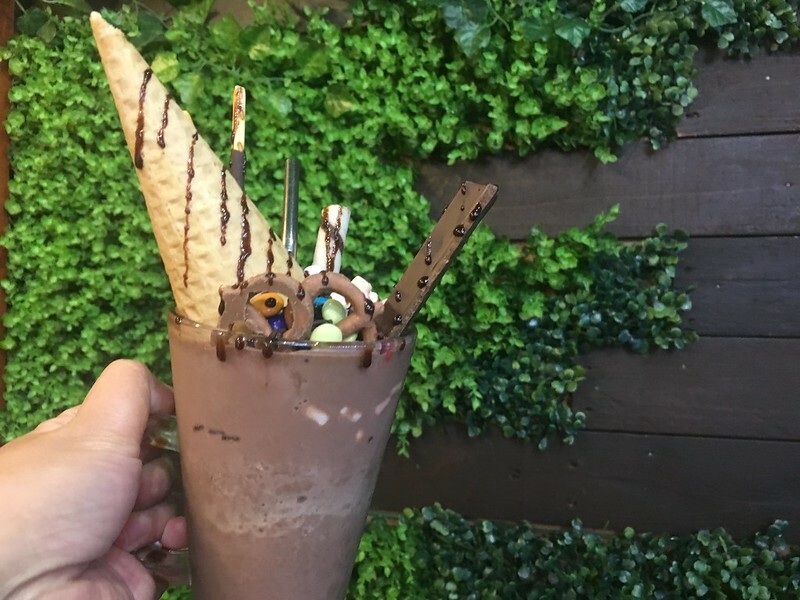 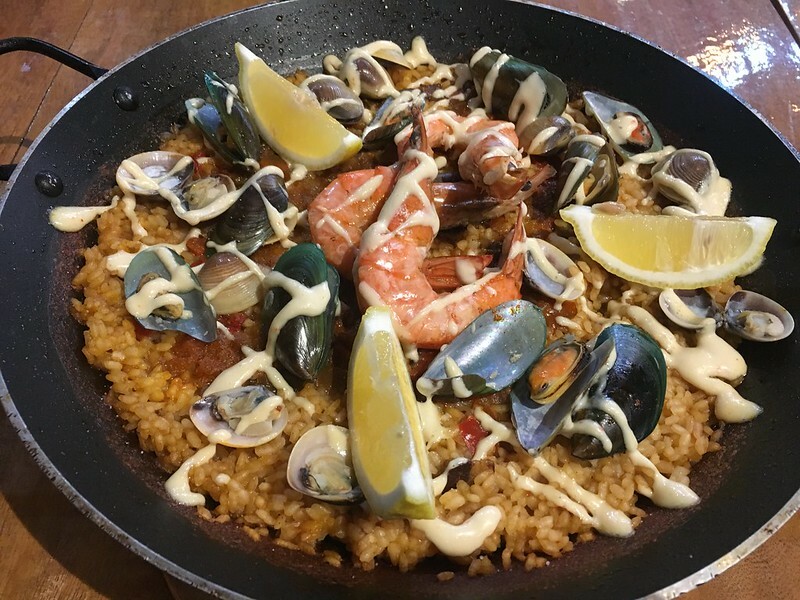 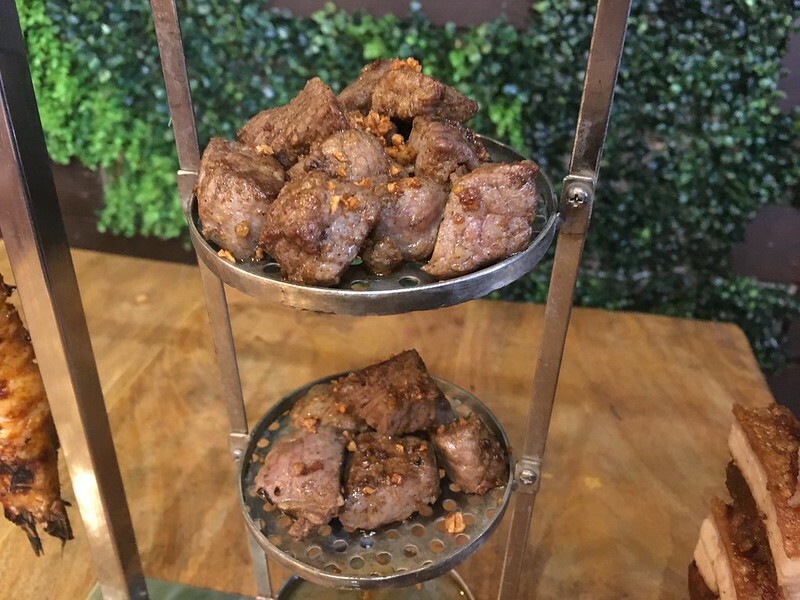 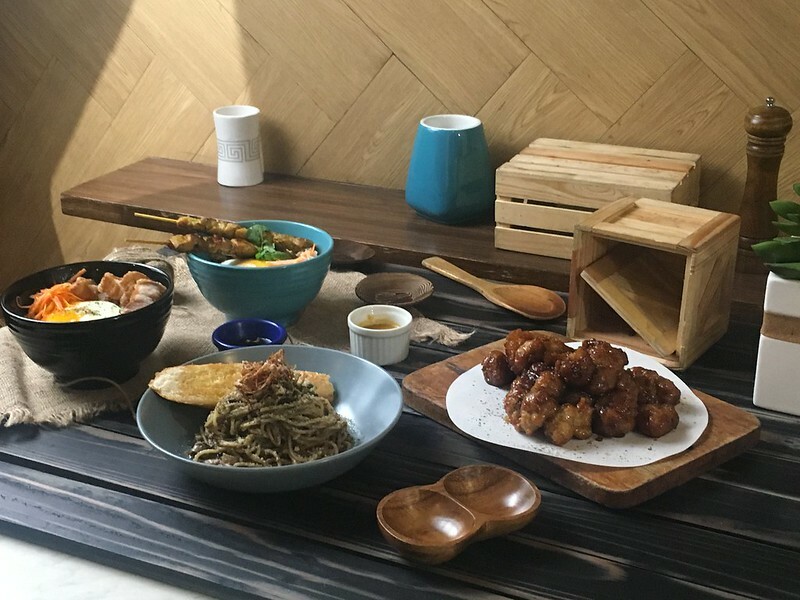 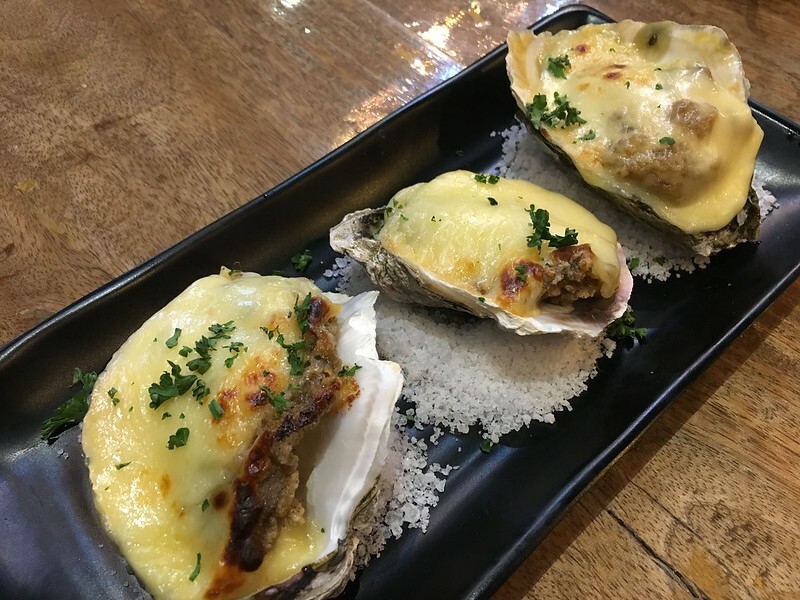 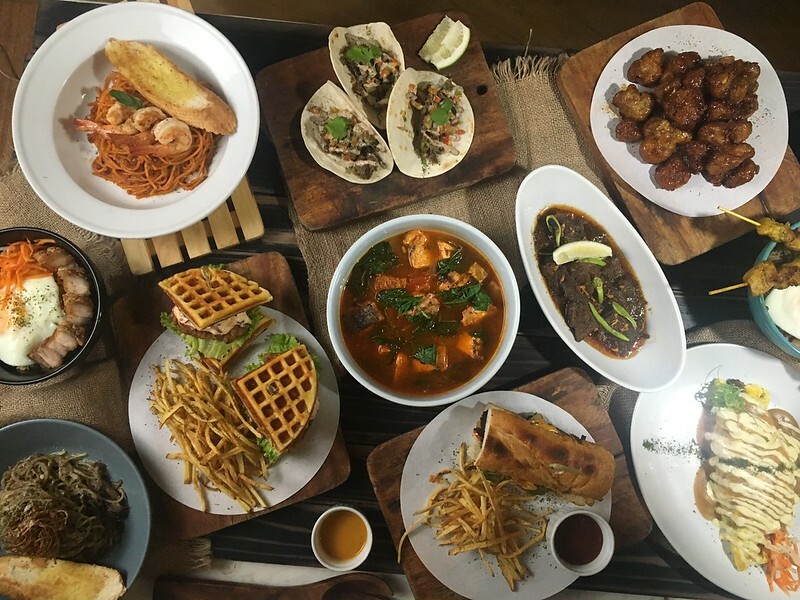 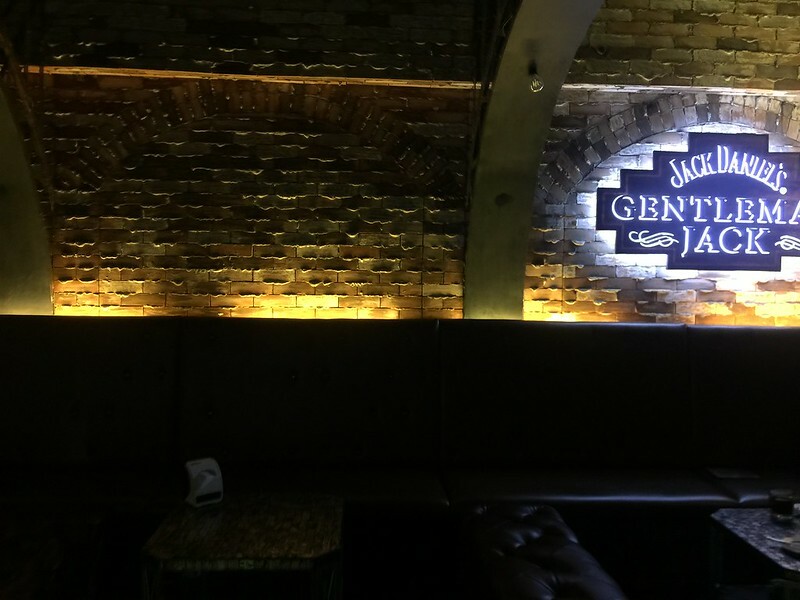 Kapitolyo is the place to be if you want imaginative and extraordinary dining experiences, in establishments that veer off the beaten path when it comes to restaurant concept, menu items or decor. 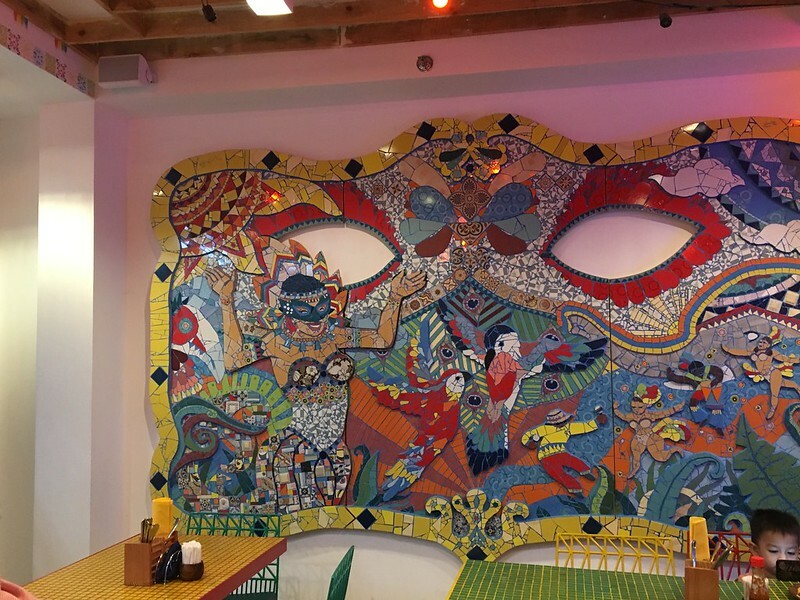 One such restaurant is Tittos Latin BBQ and Brew. 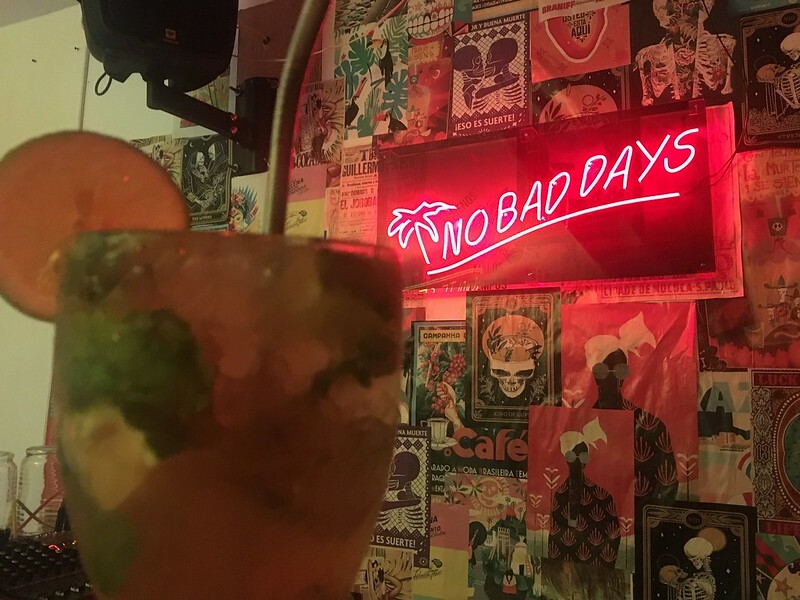 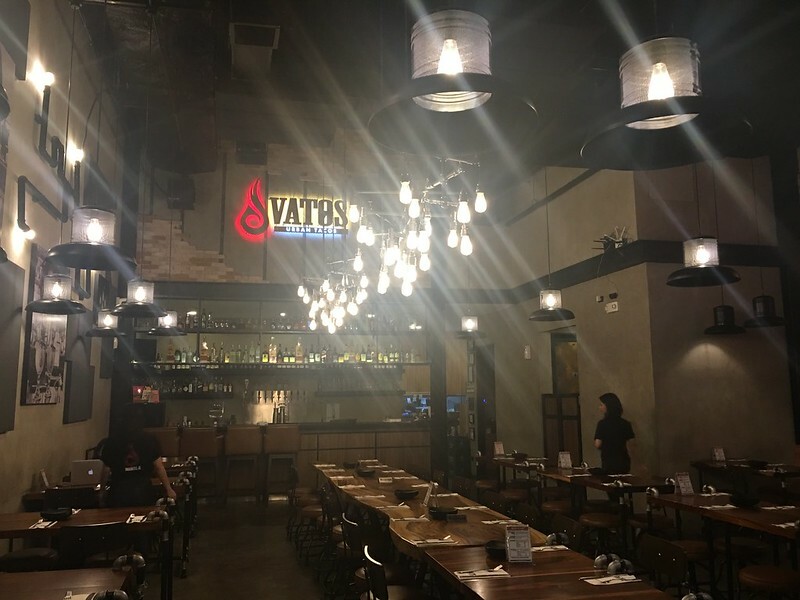 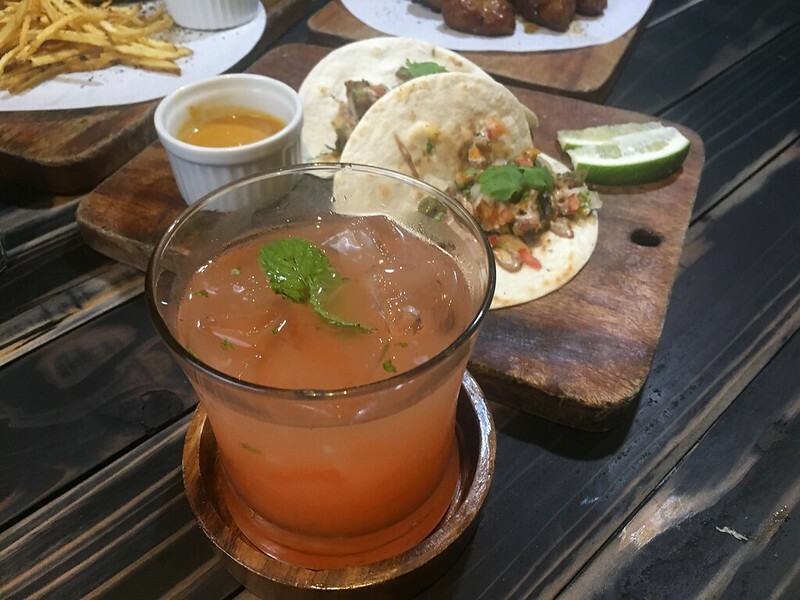 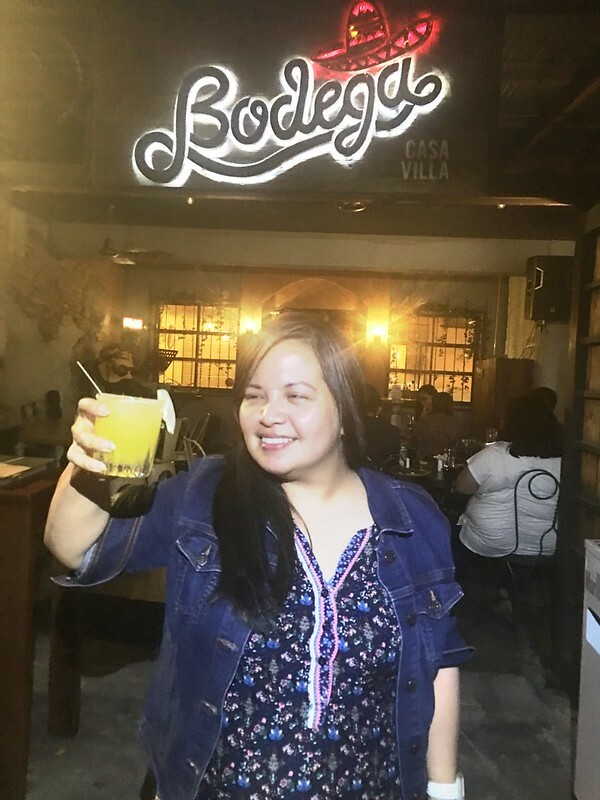 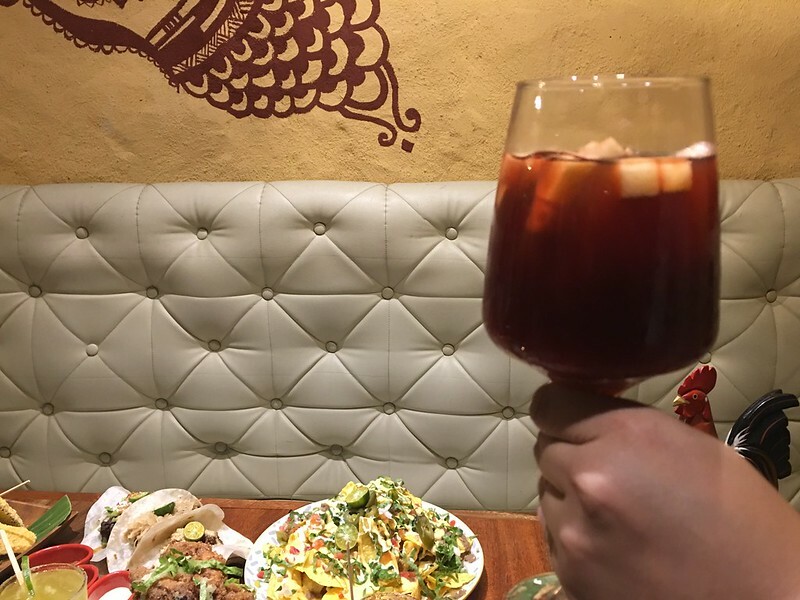 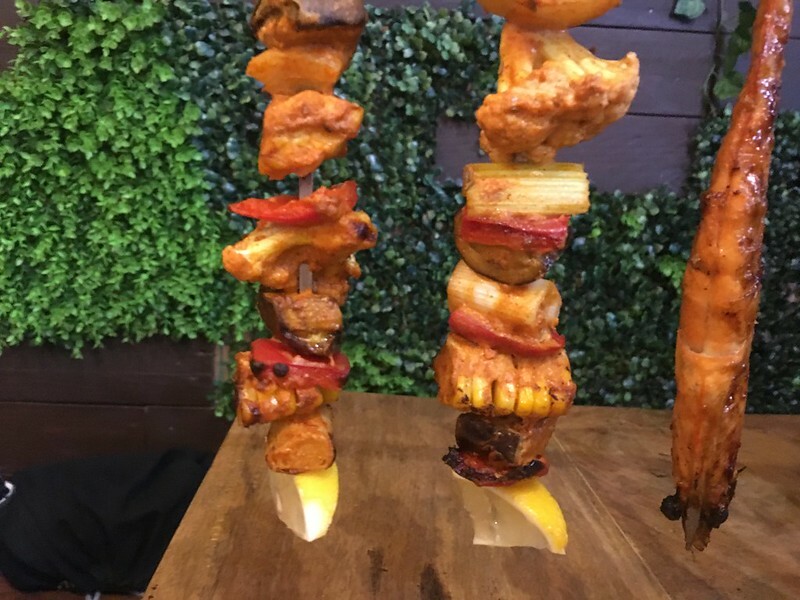 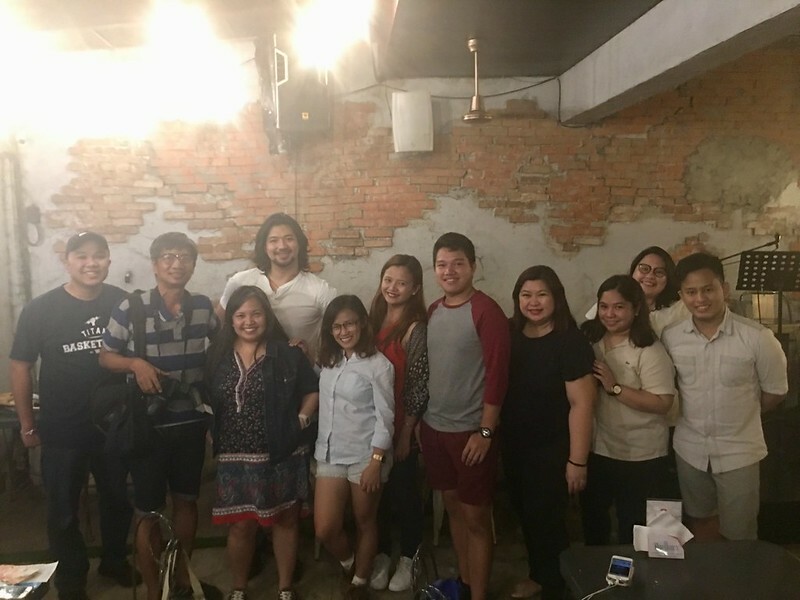 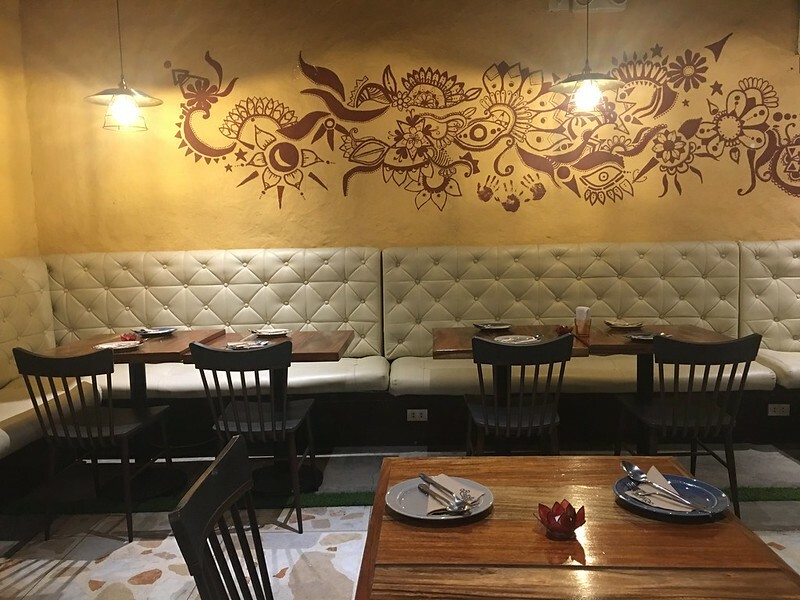 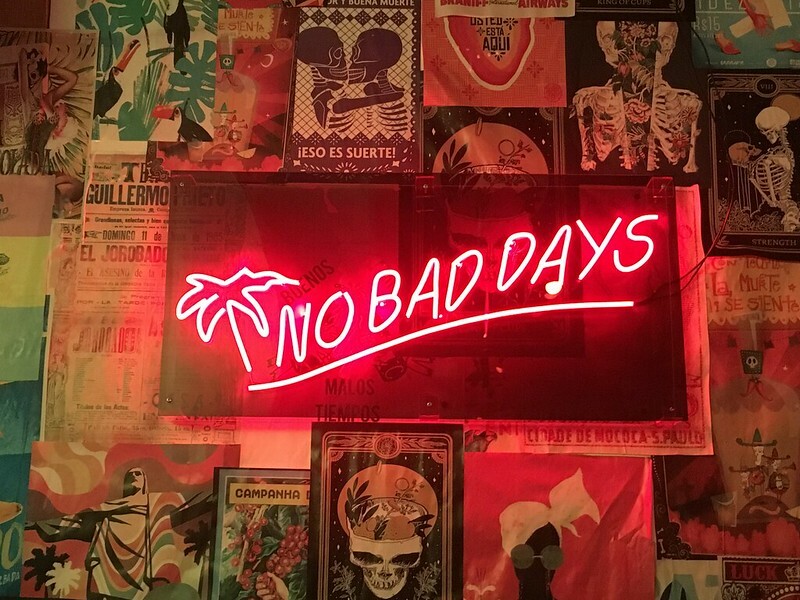 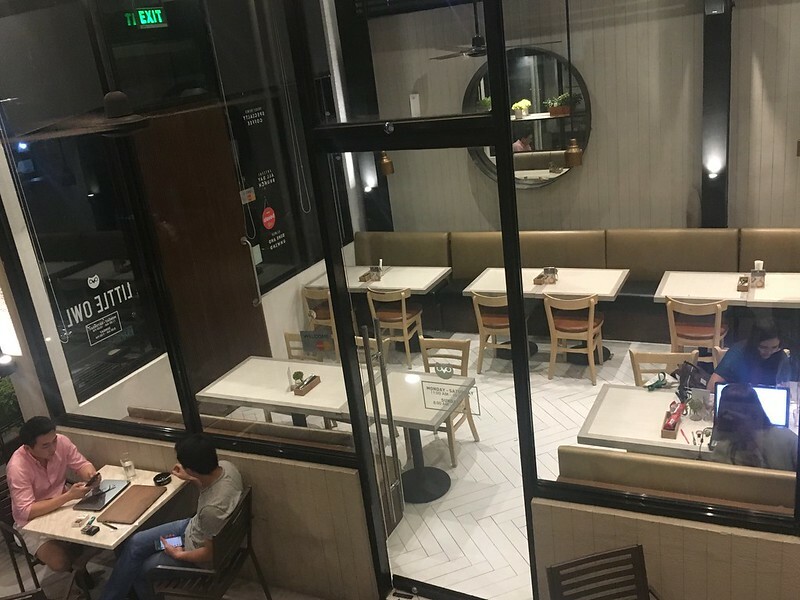 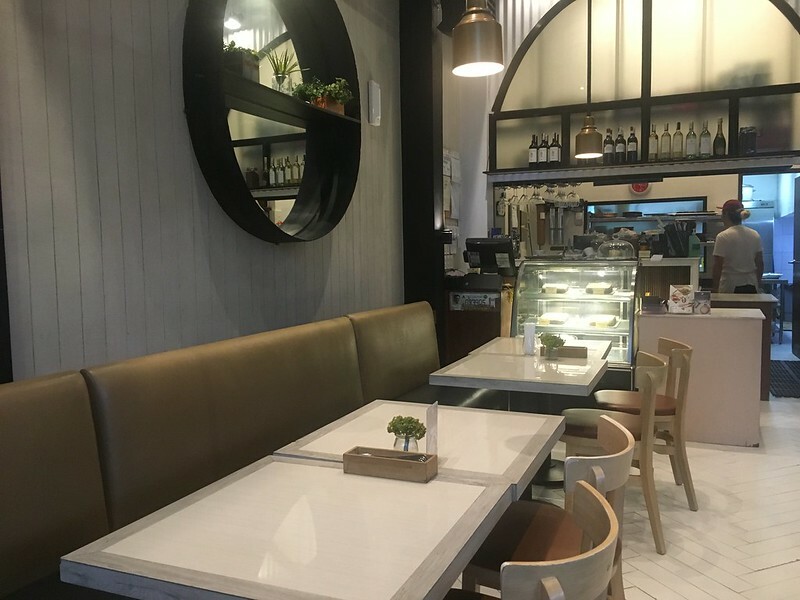 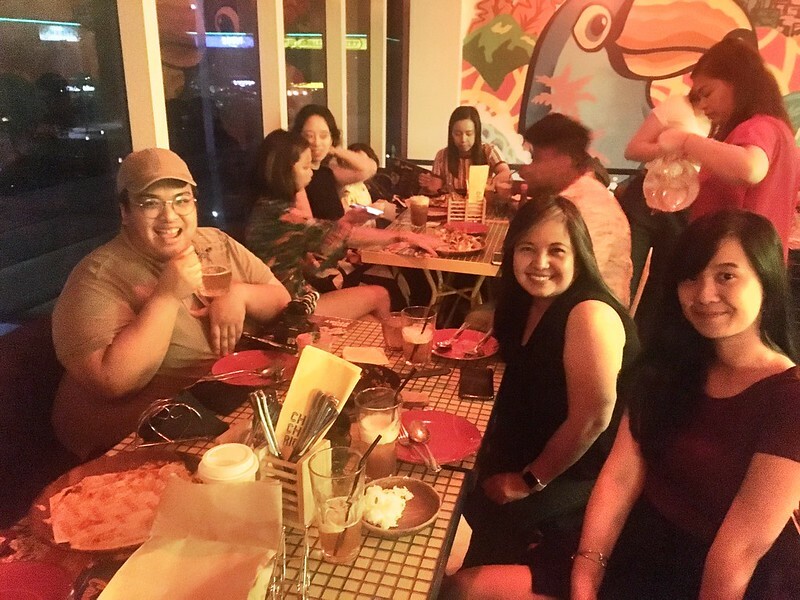 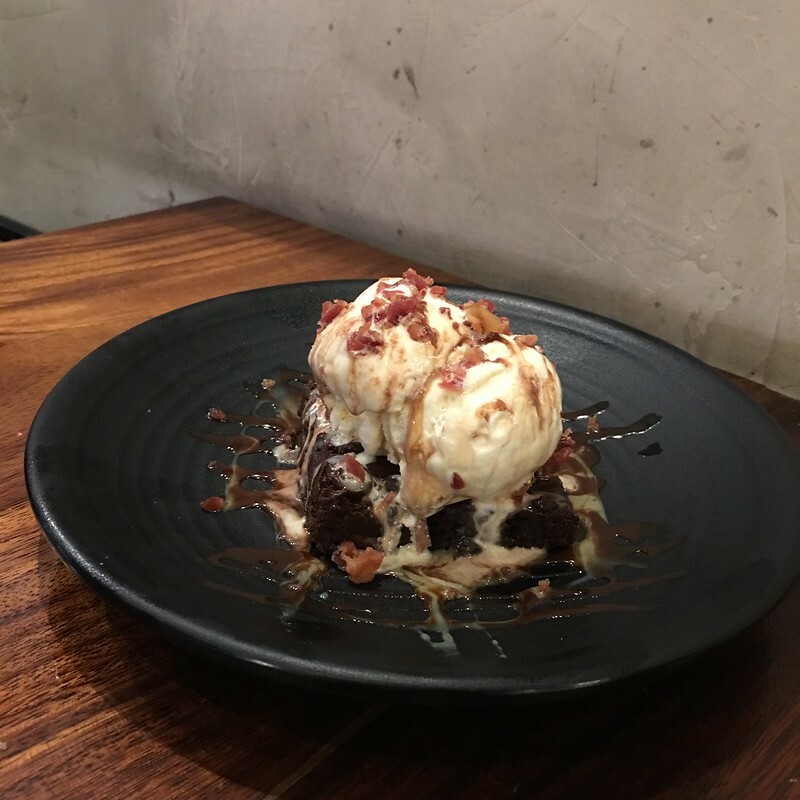 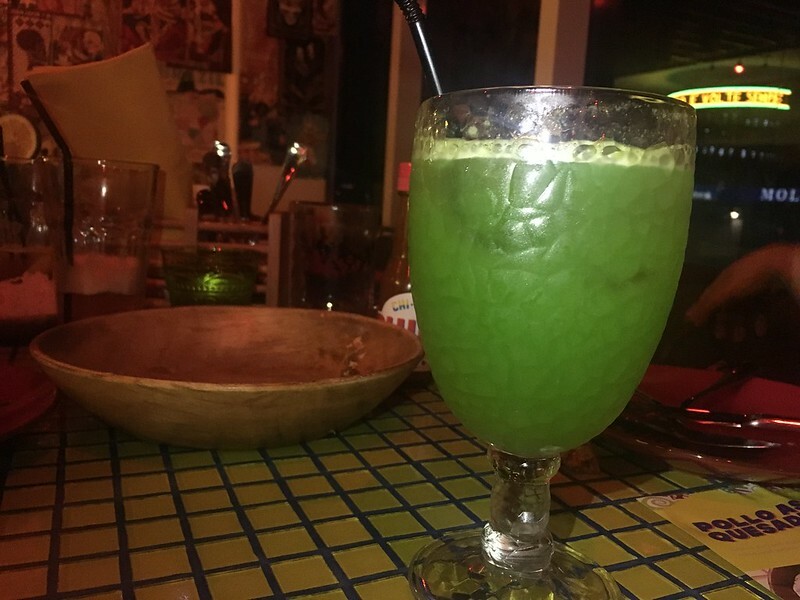 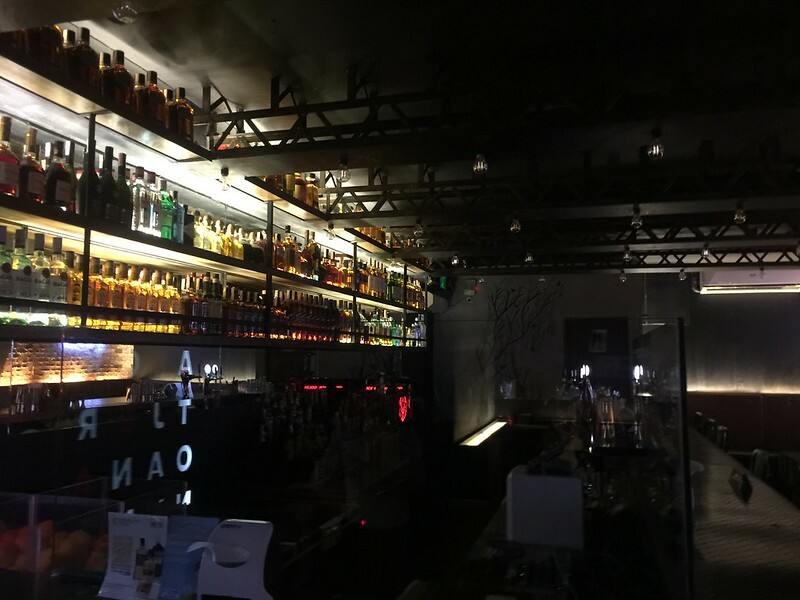 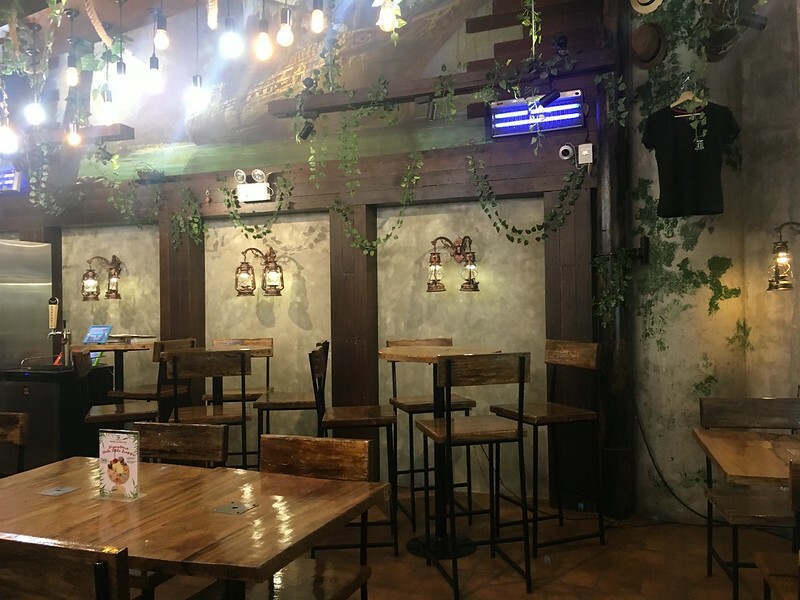 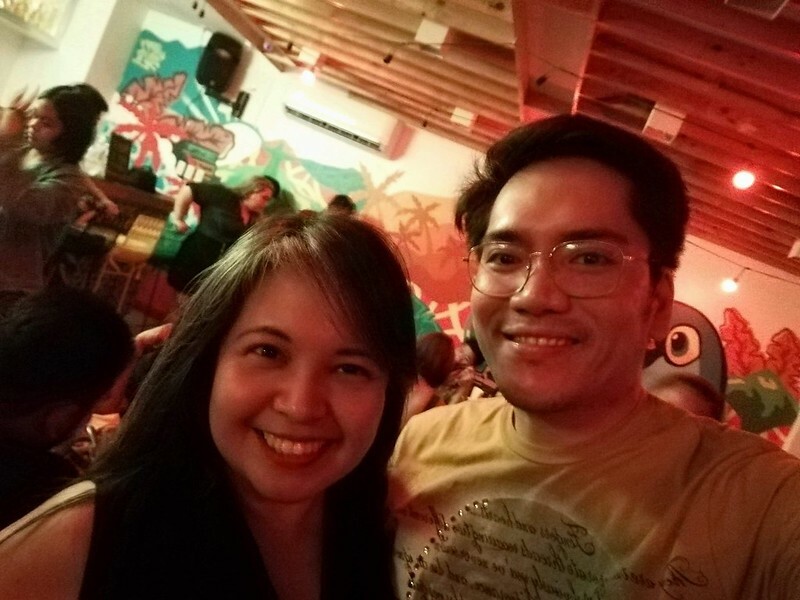 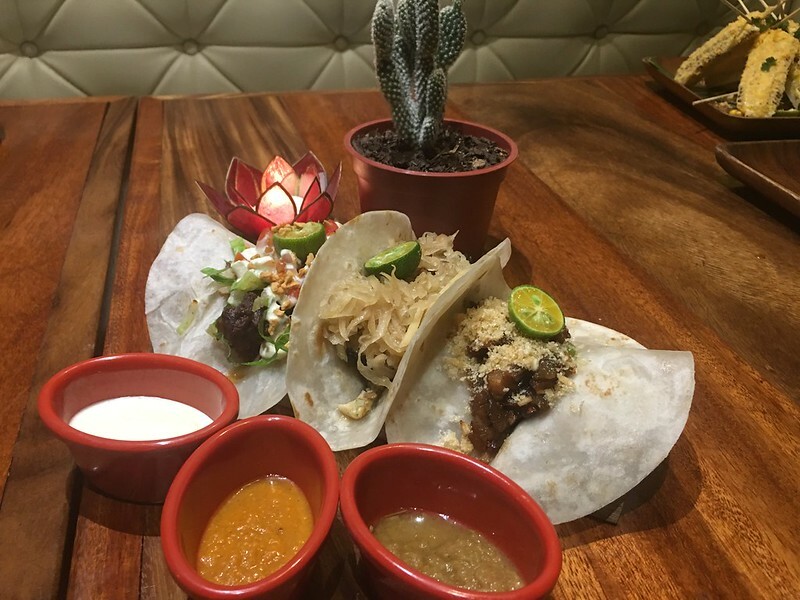 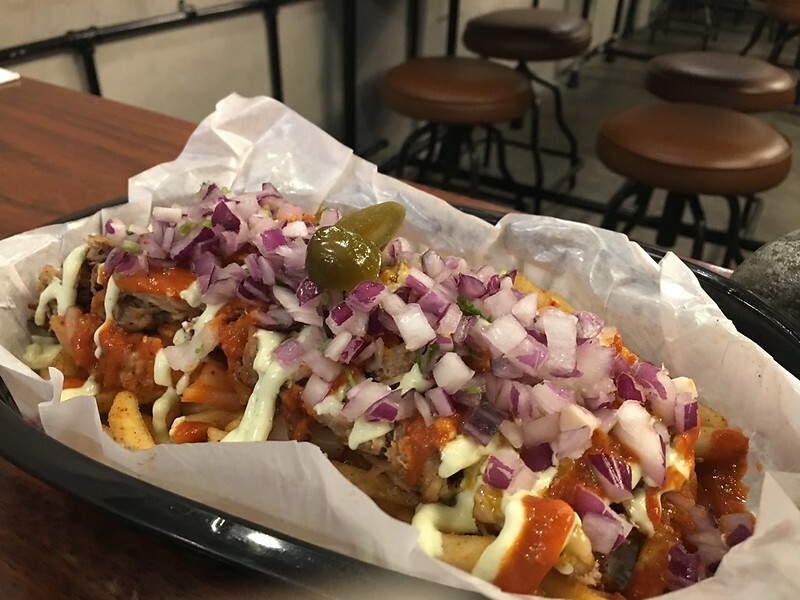 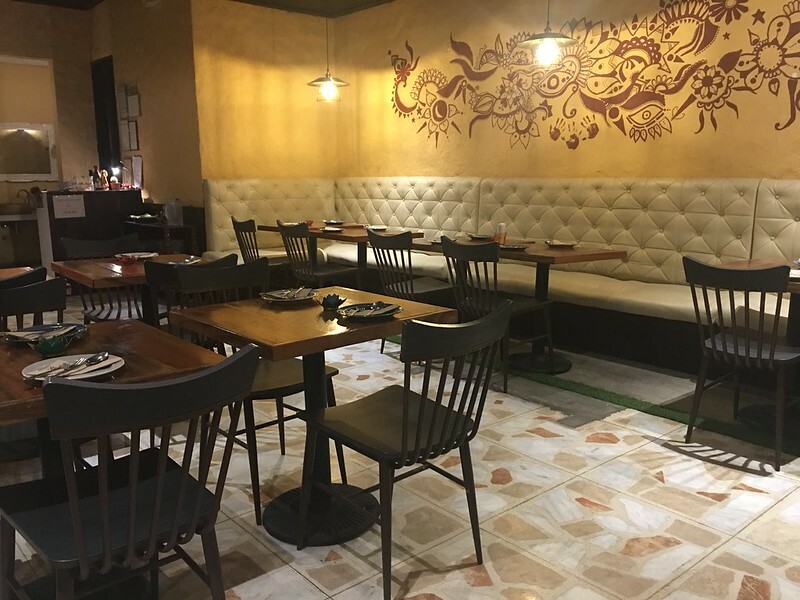 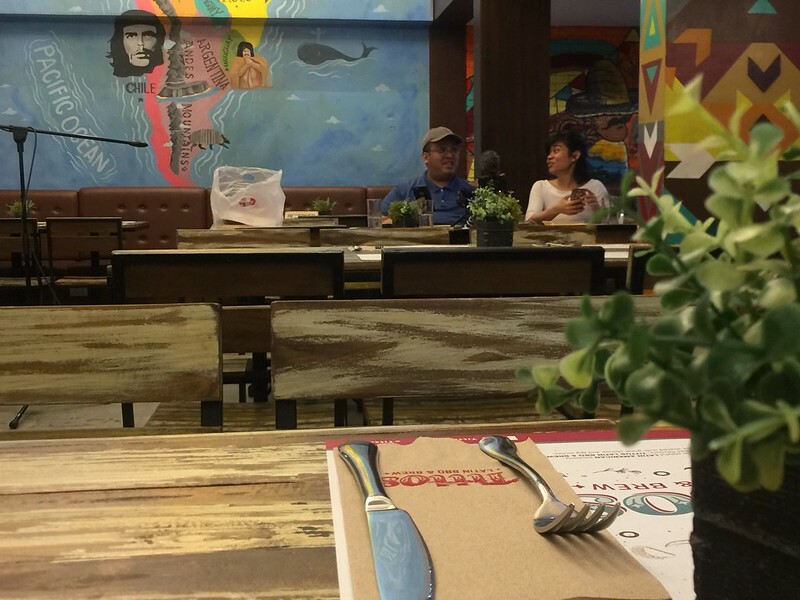 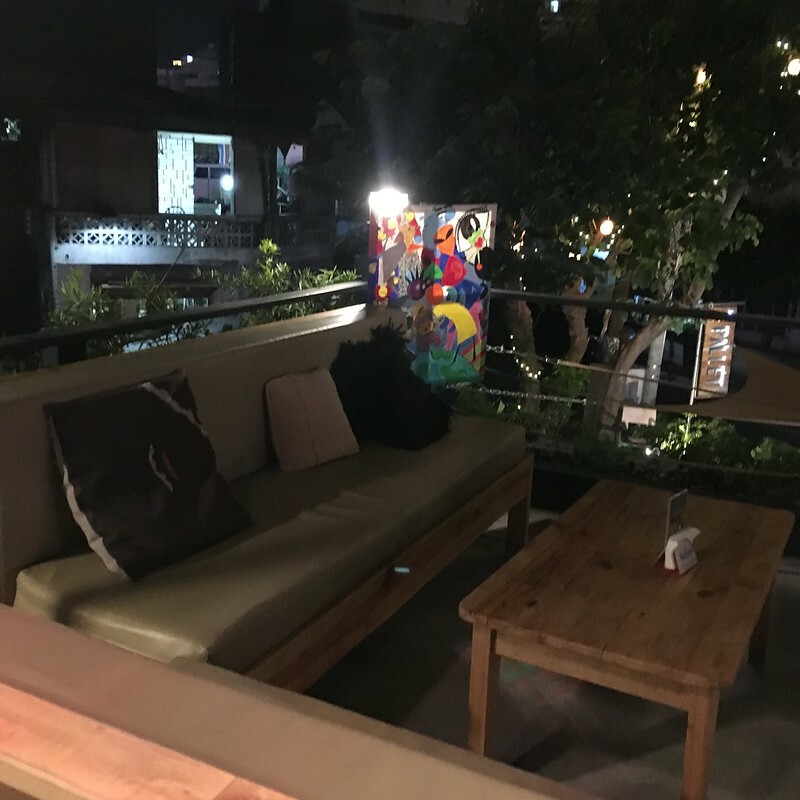 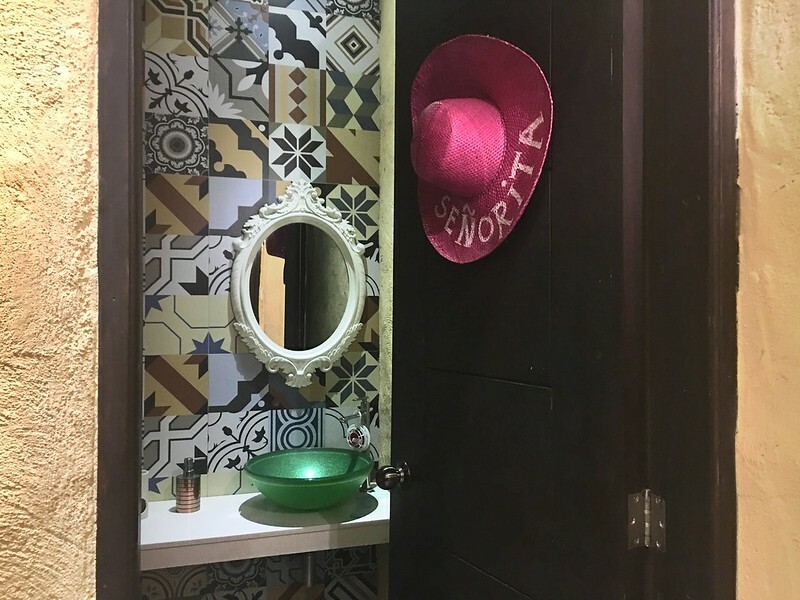 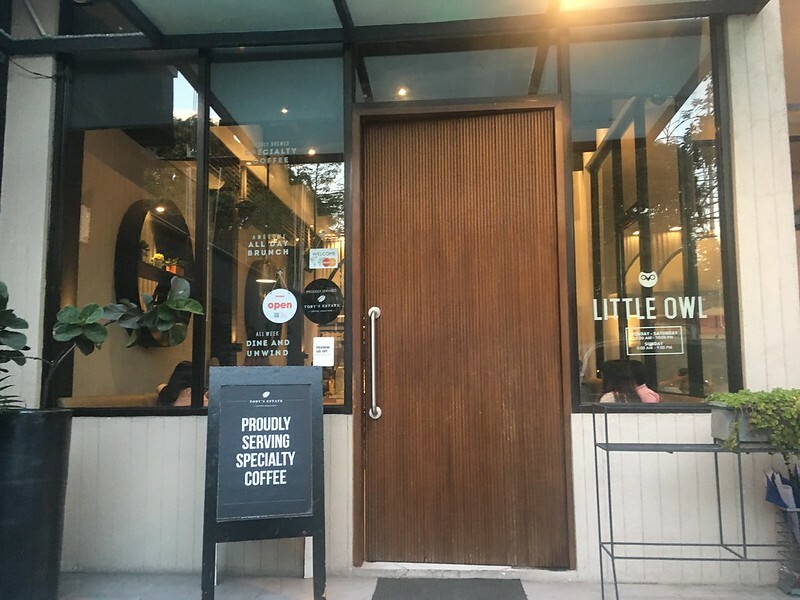 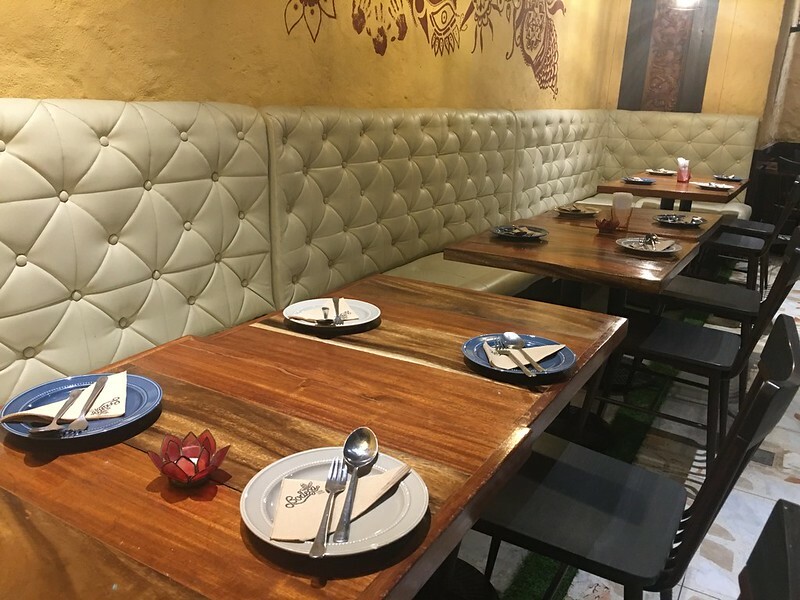 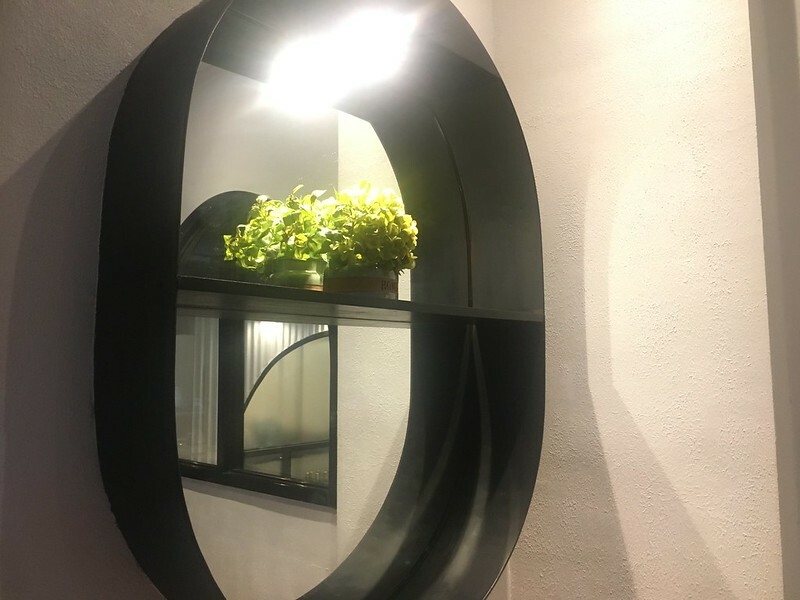 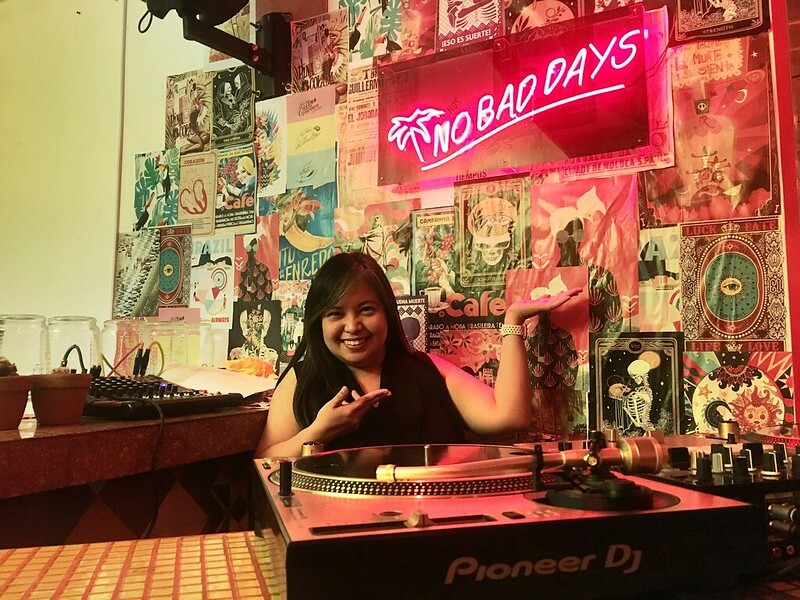 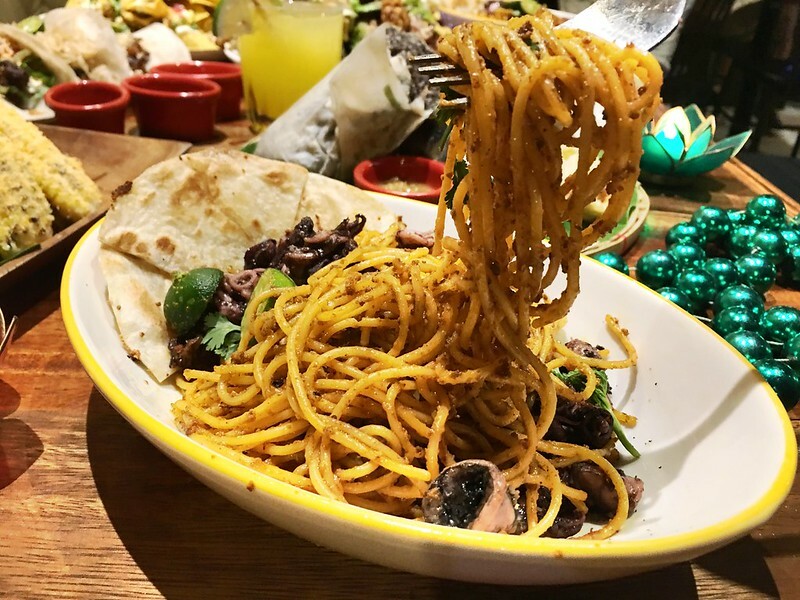 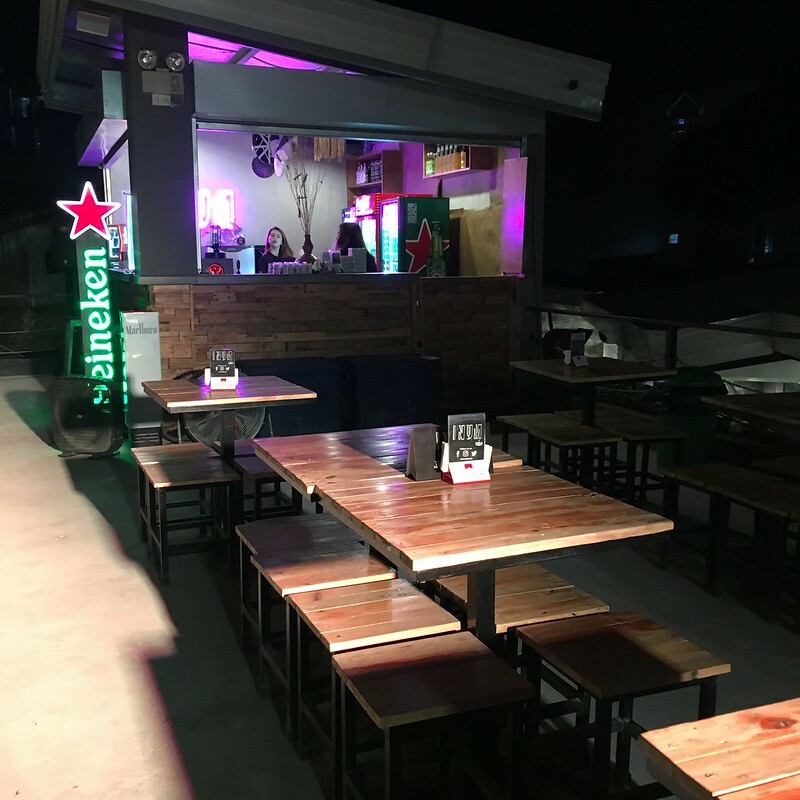 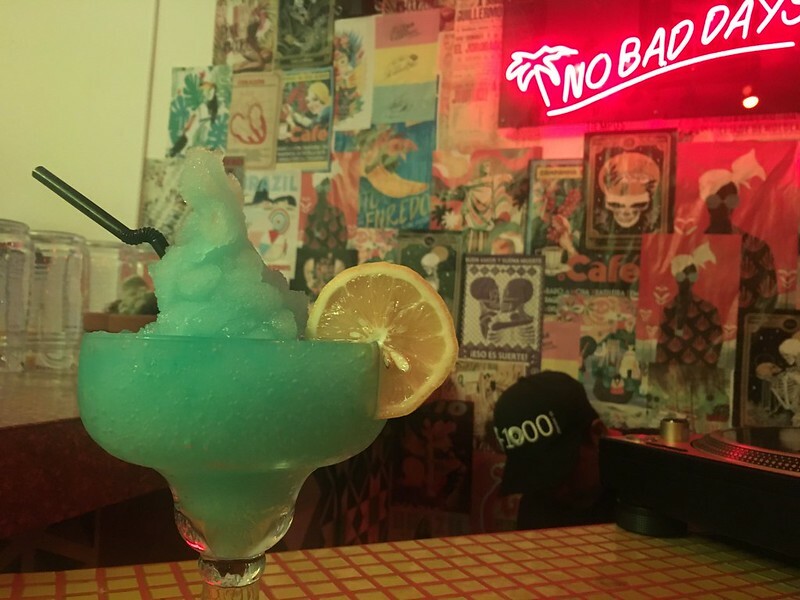 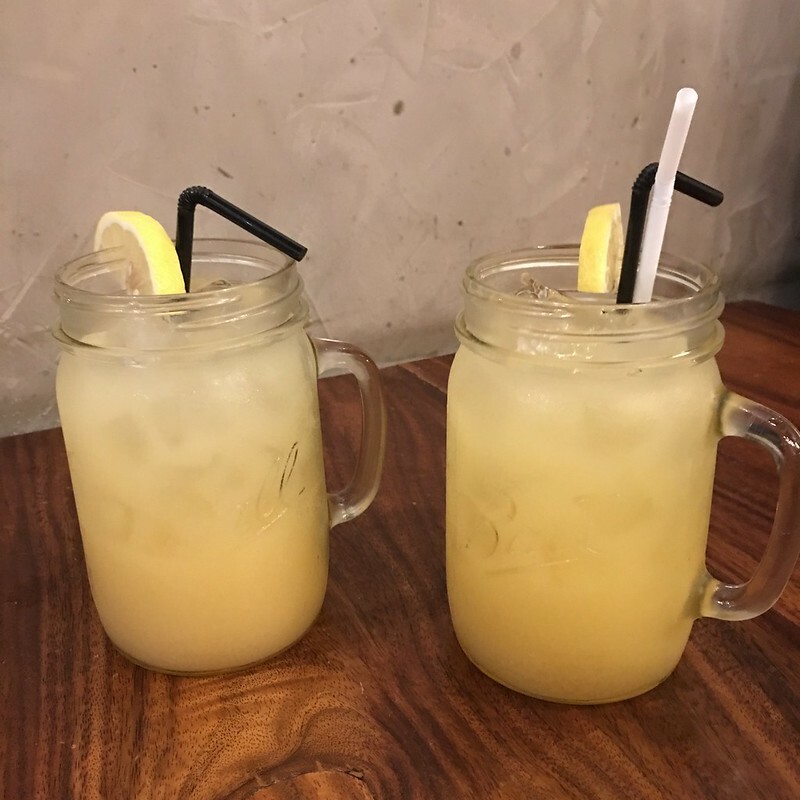 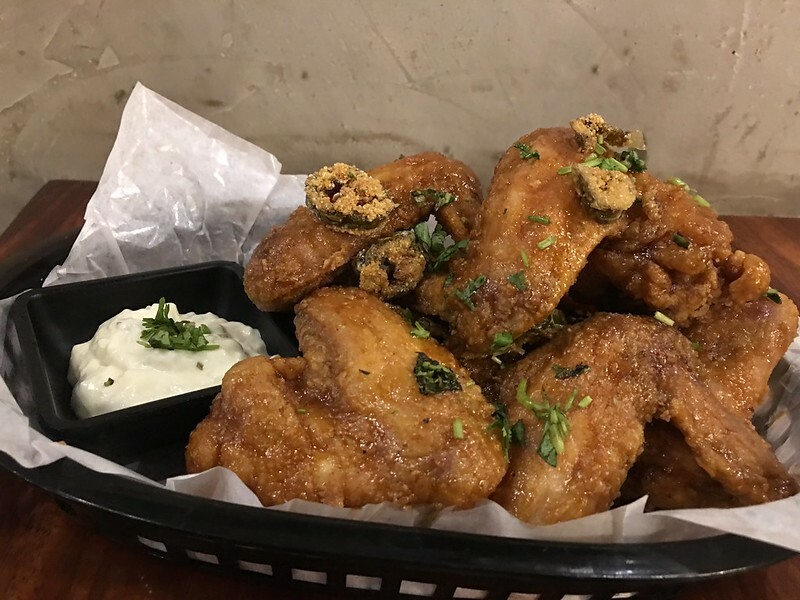 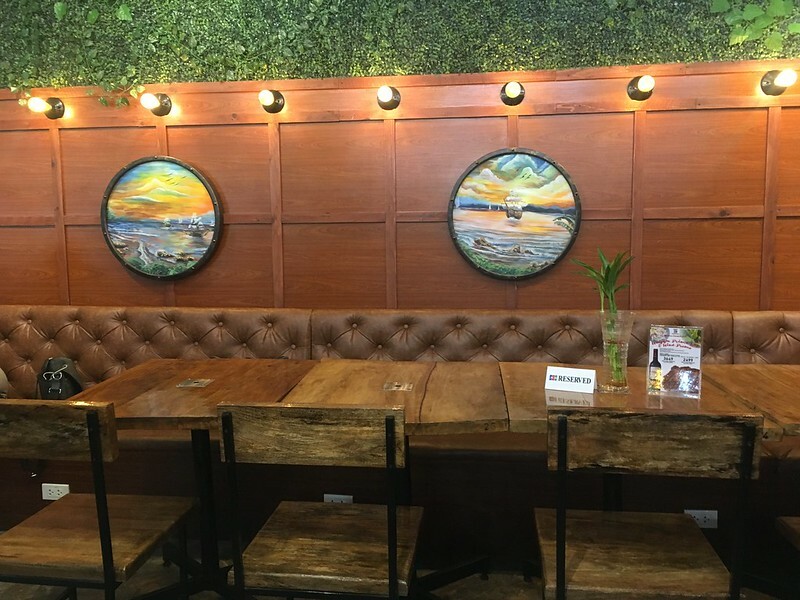 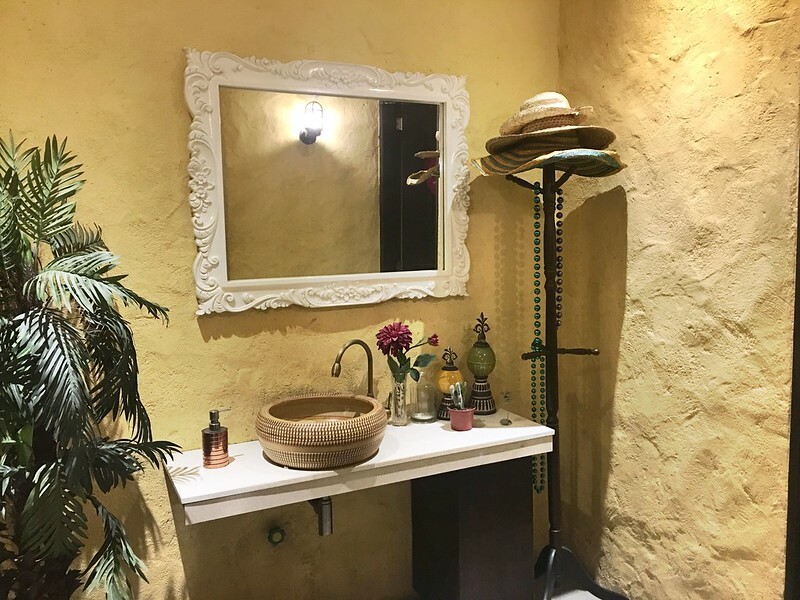 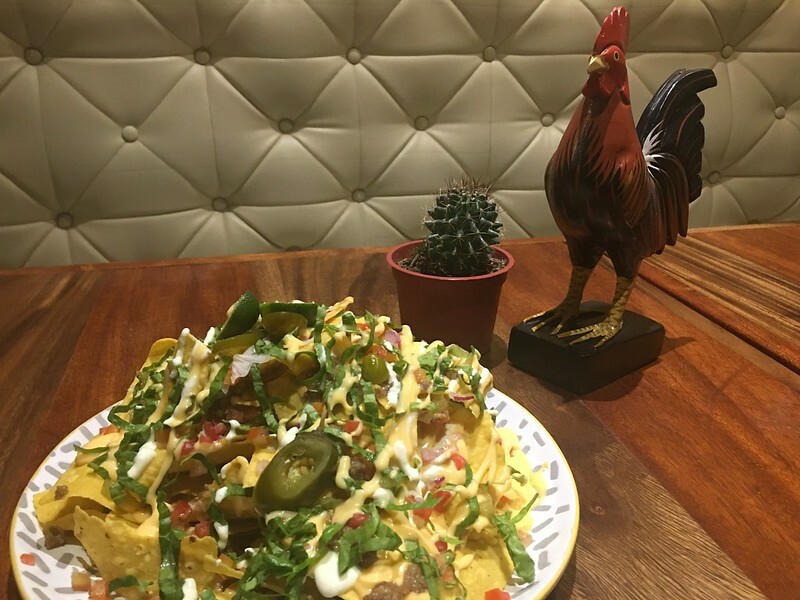 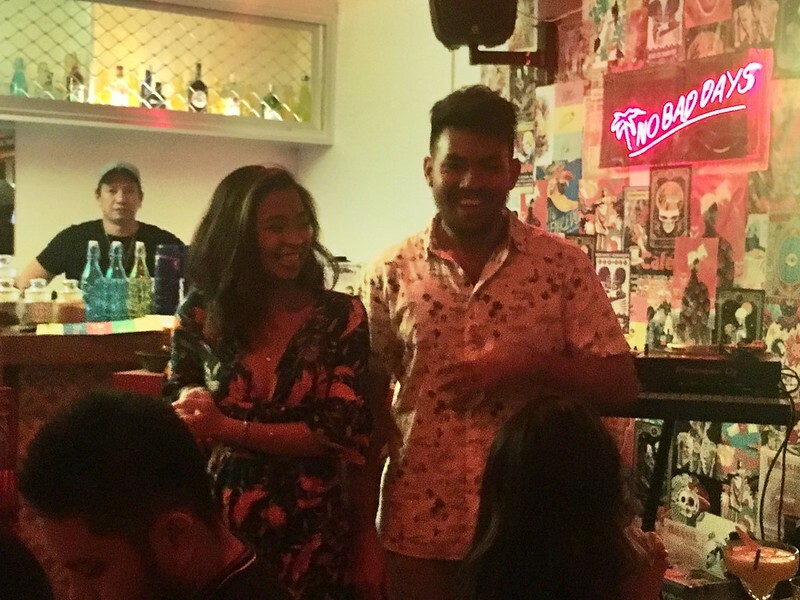 The brainchild of a group of friends who consider themselves “titos” already (hence the restaurant name), Tittos has a relaxed yet vibrant vibe that appeals to the titos and titas in all of us. 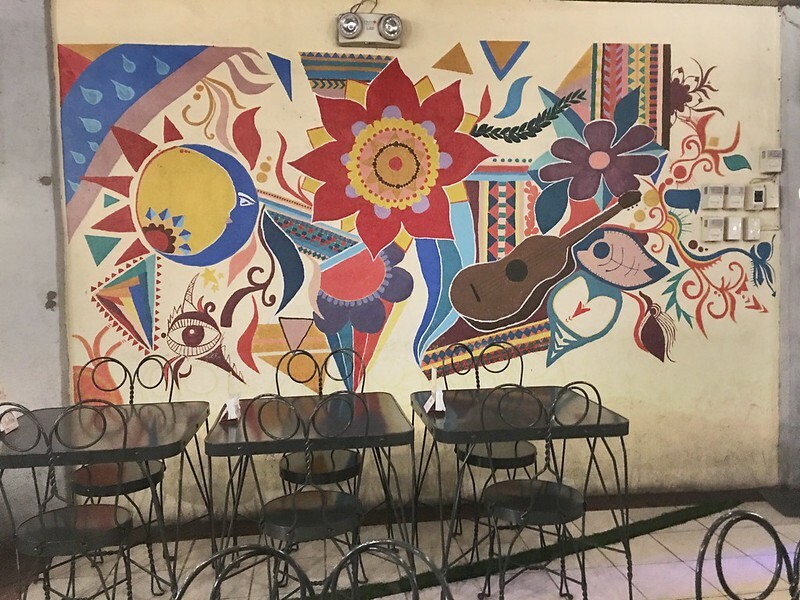 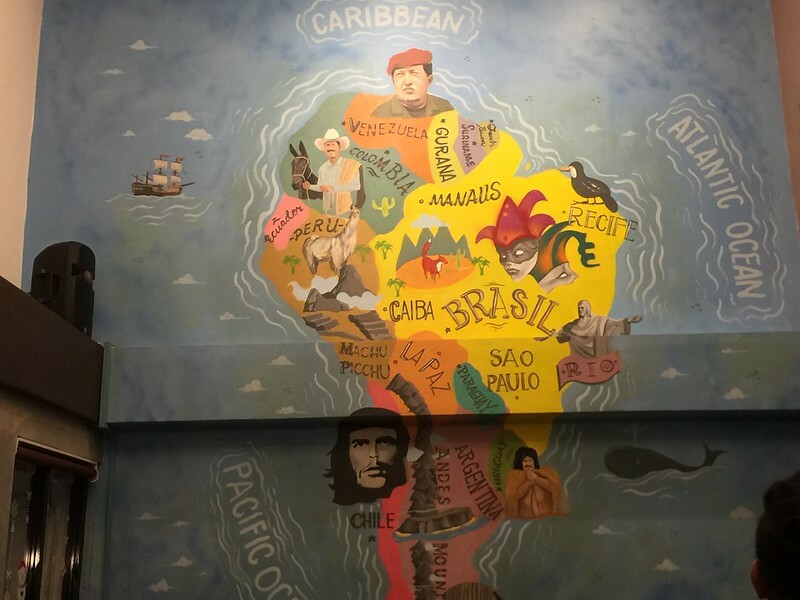 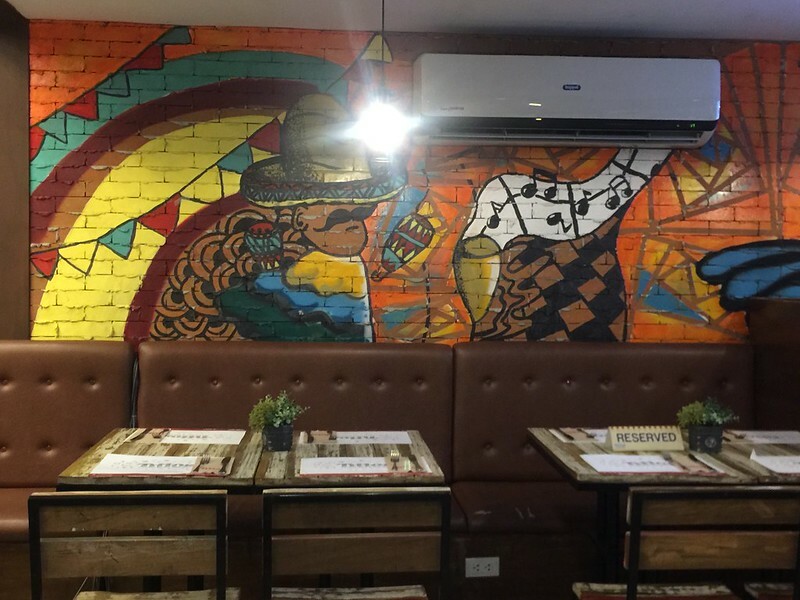 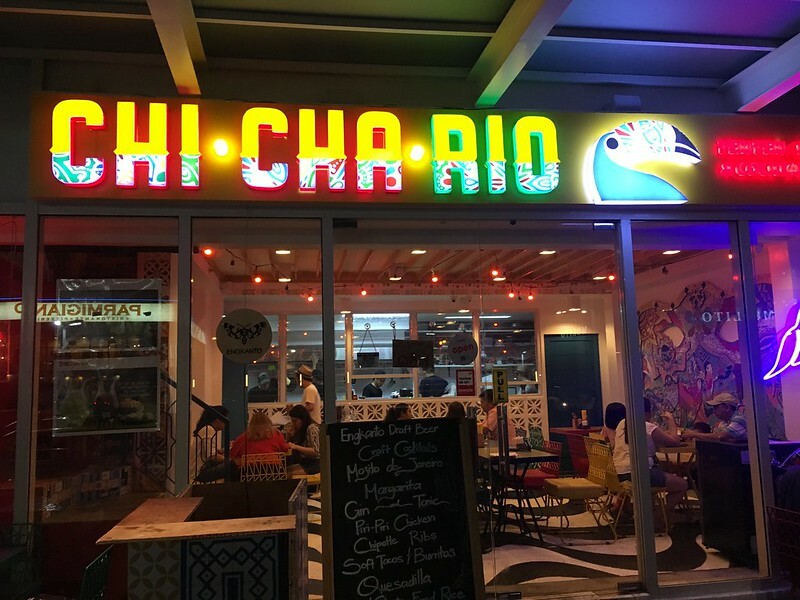 From the huge colorful murals, its spacious indoor and al fresco dining areas, its friendly and accommodating wait staff to its huge servings of Latin American comfort food that appeals to the Pinoy palate, Tittos is the place to be for gastronomic adventures and fun times with friends. 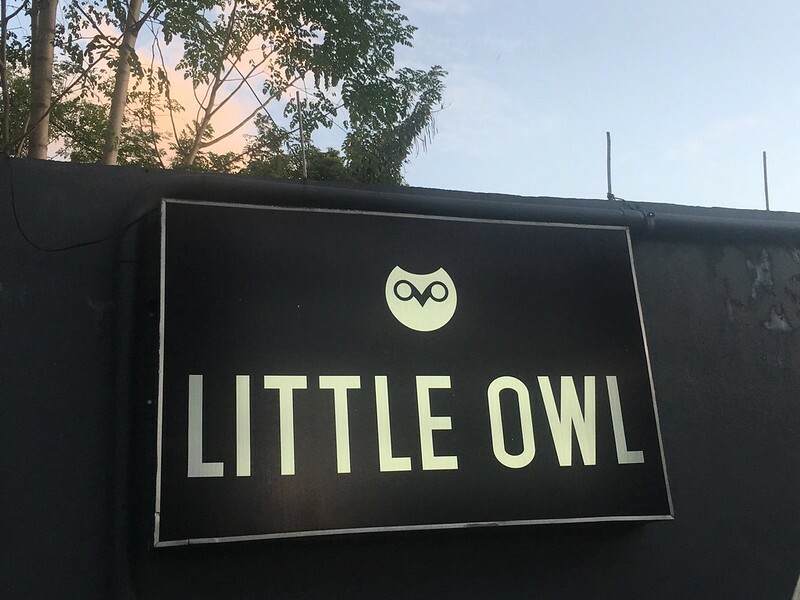 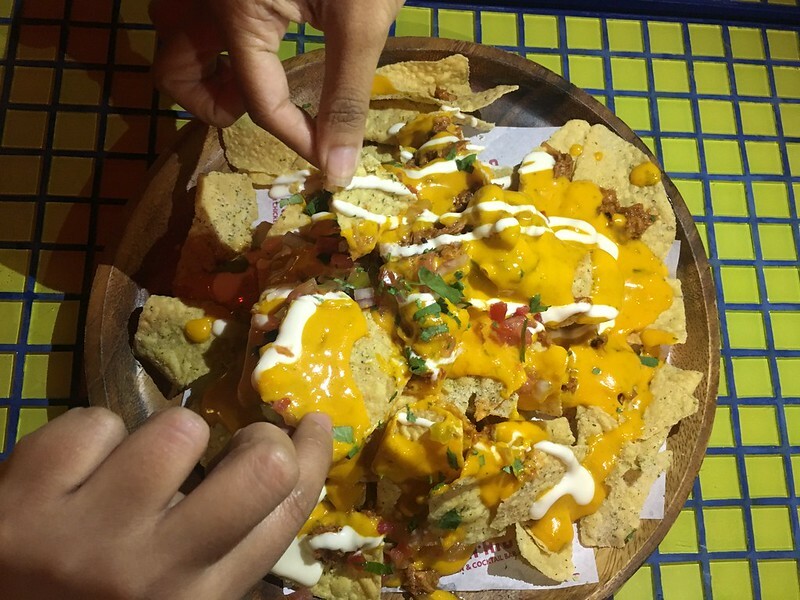 However, there is more to Tittos than meets the eye which I found out when I attended a foodie meet up held there. 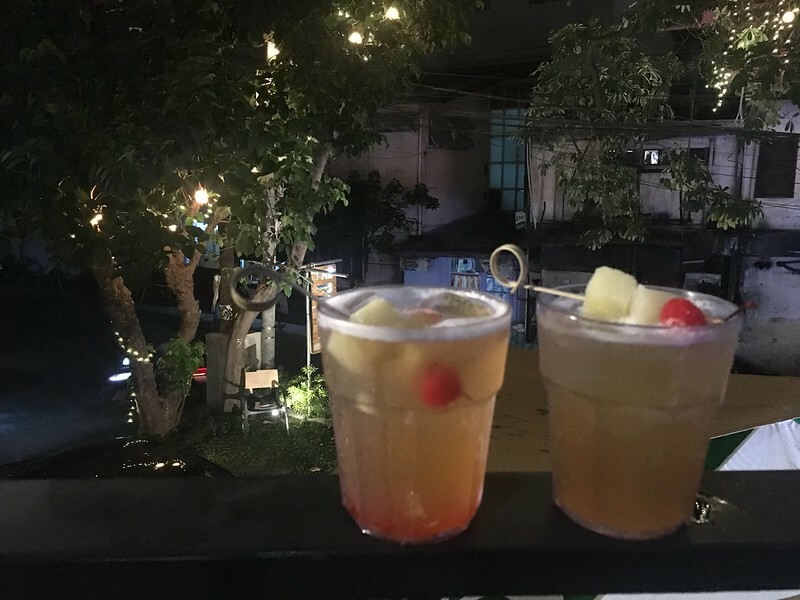 And since I like to blab about my discoveries, here are things about Tittos that will make you hie yourself off to Kapitolyo stat. 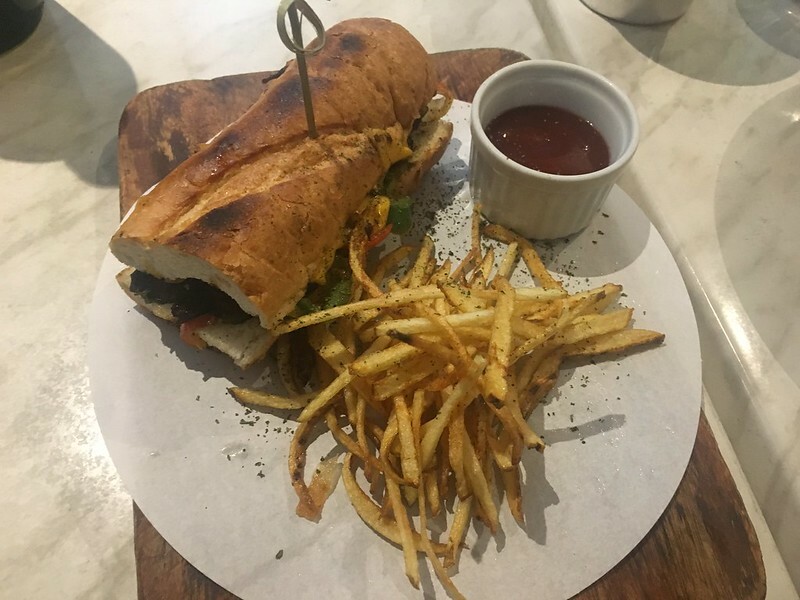 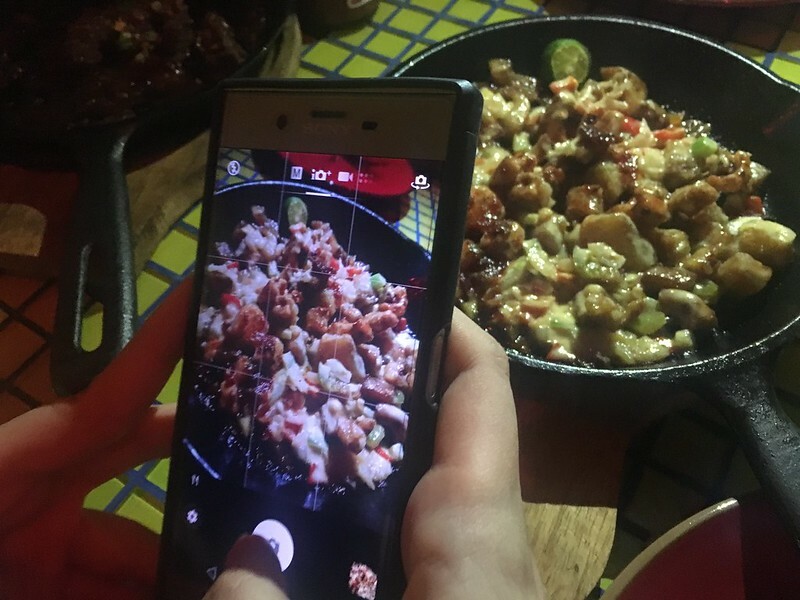 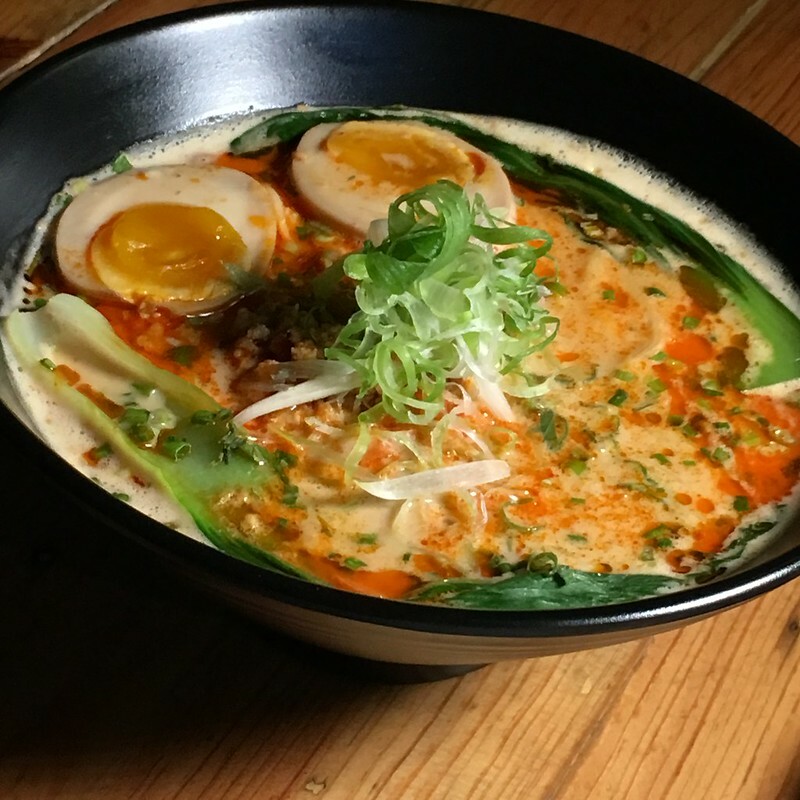 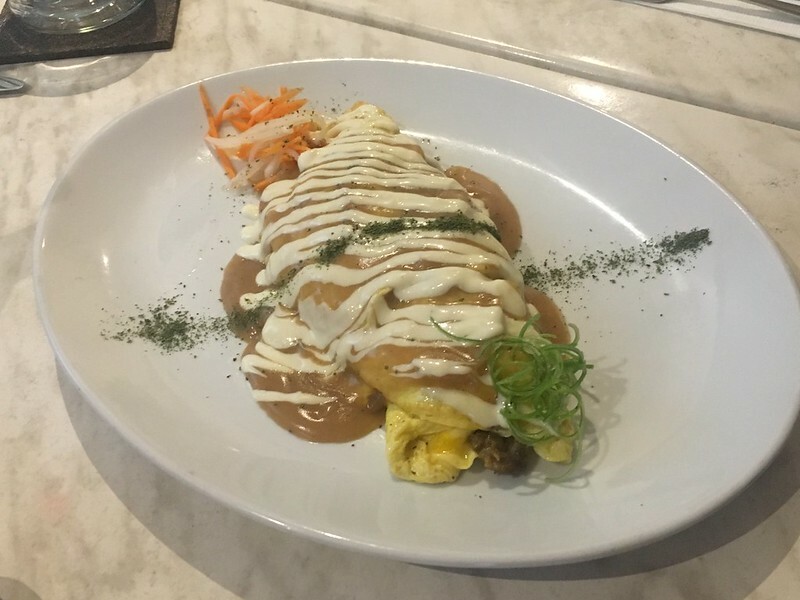 One: It recently launched some new appetizing menu items. 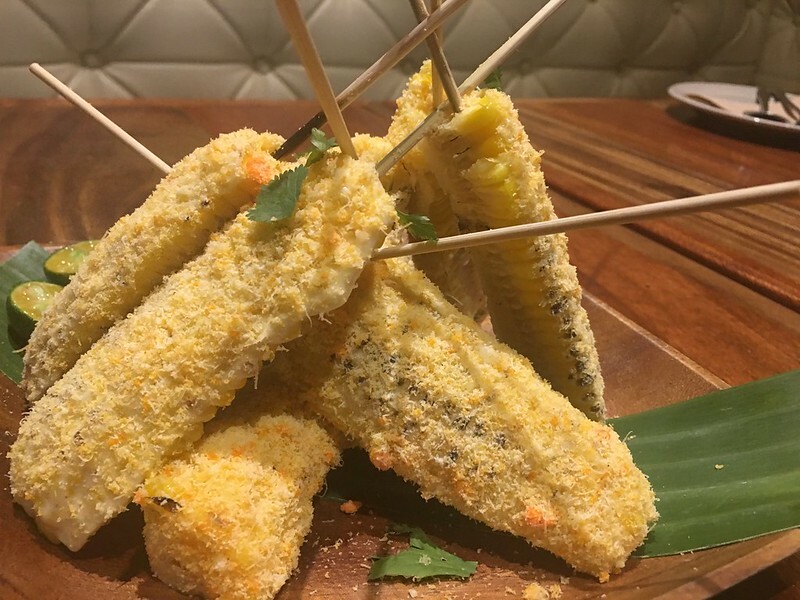 Tapas de Chipa (Php295). 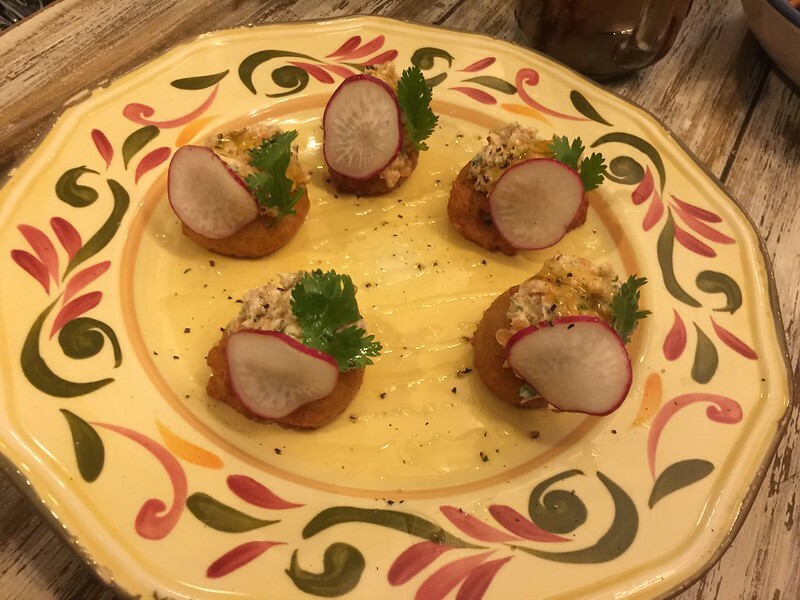 Soft puff pastries served tapas-style with cream cheese, smoked salmon and truffle honey. 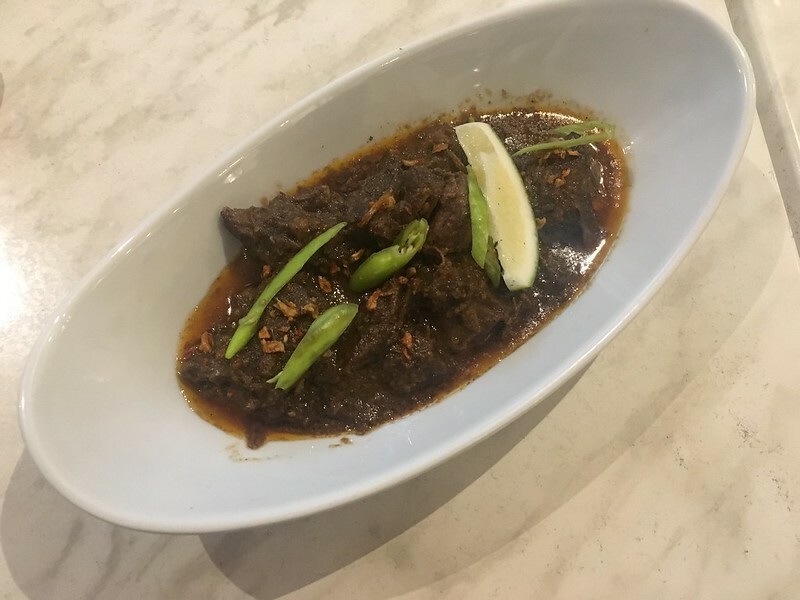 Tuna Tirataki (Php275). 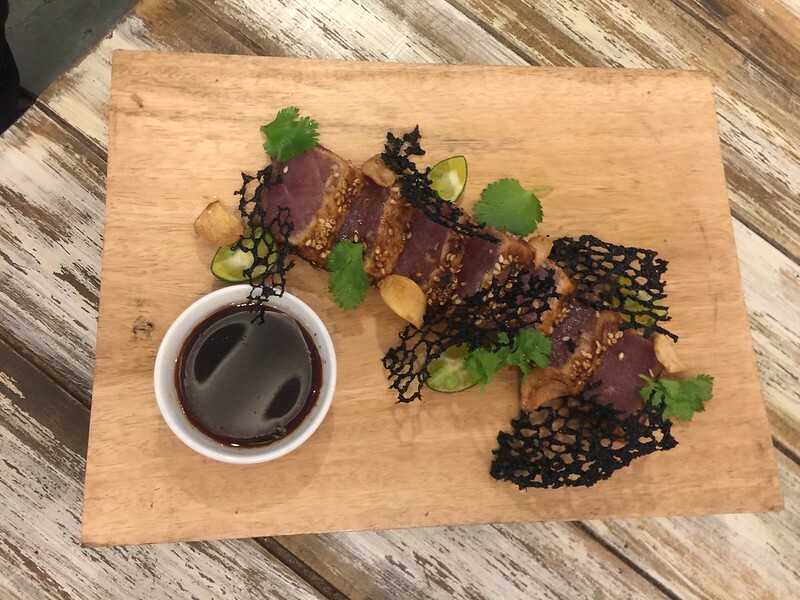 A Brazilian take on the Japanese tataki, sashimi-grade tuna is seared and served with a tangy spice mix, fried garlic, and garnished with a delicate black coral tuile. 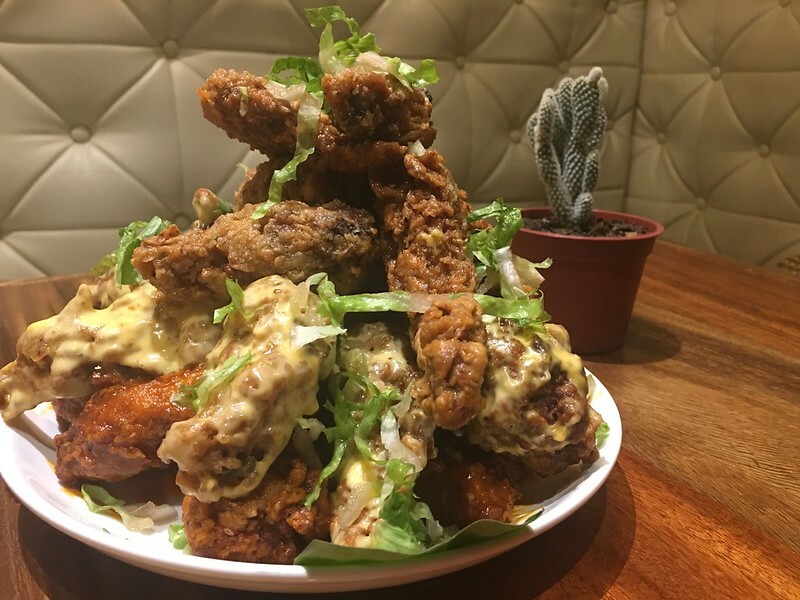 La Lucha Salad (Php320). 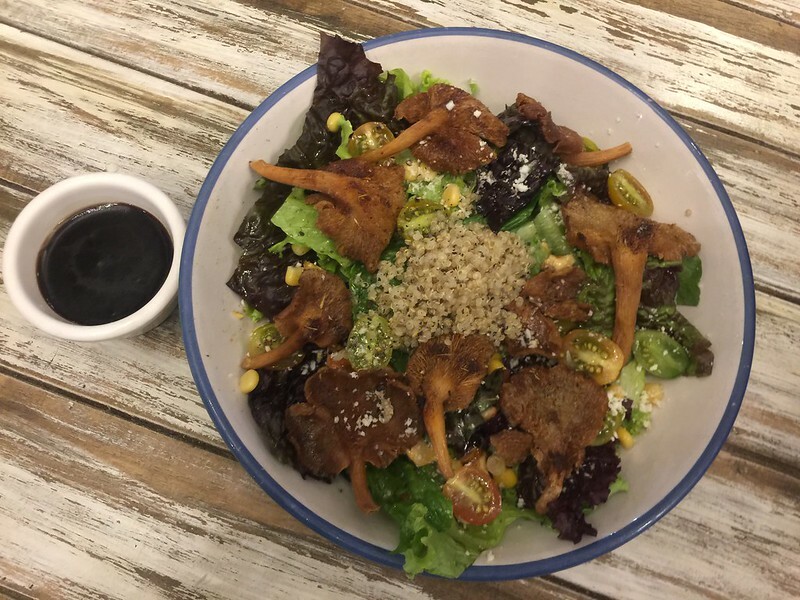 A very healthy salad that mixes in the trendy ingredient quinoa with mixed salad greens, corn, candied cashews, tempura-style oyster mushrooms, cherry tomatoes and crumbled white cheese drizzled with a honey balsamic dressing. 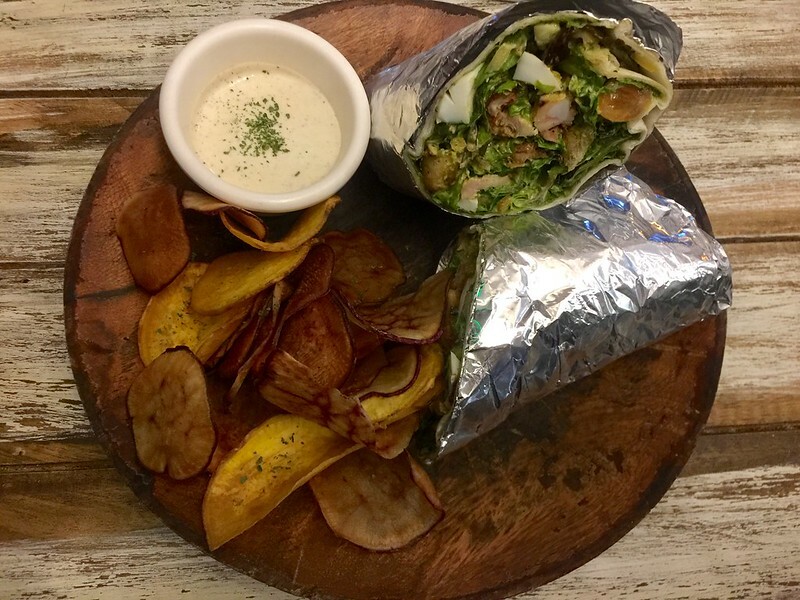 El Cesar’s Salad Burrito (Php320). 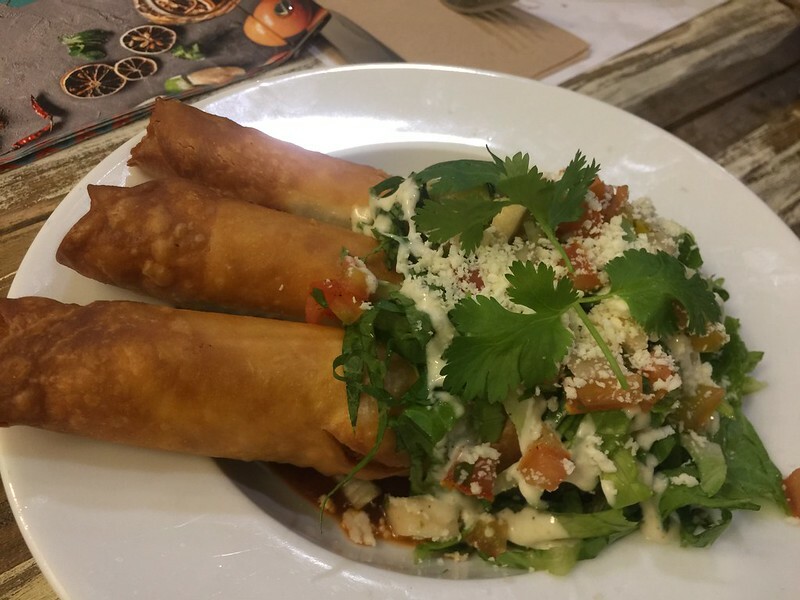 In this Latin American deconstruction of the classic Ceasar Salad, lava-grilled chicken mojo is wrapped in flour tortilla together with mixed lettuce, soft-boiled eggs, garlic croutons, fresh parmesan, cherry tomatoes and Tittos’ own house-made Ceasar salad dressing, and served with some potato fries on the side. 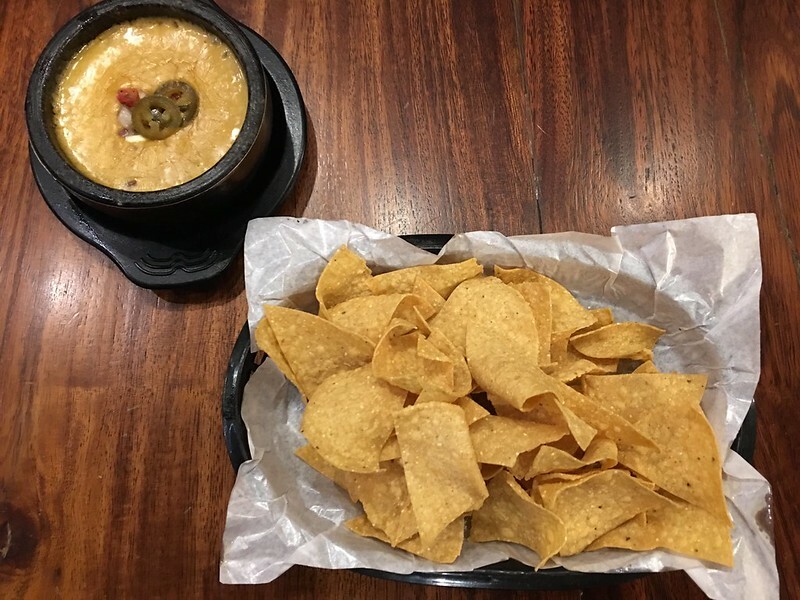 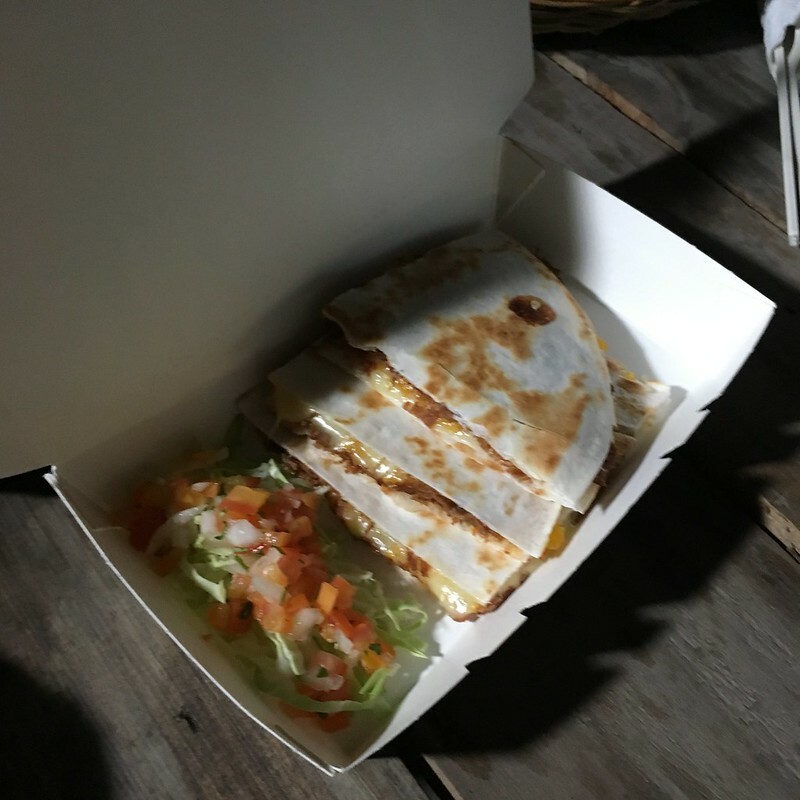 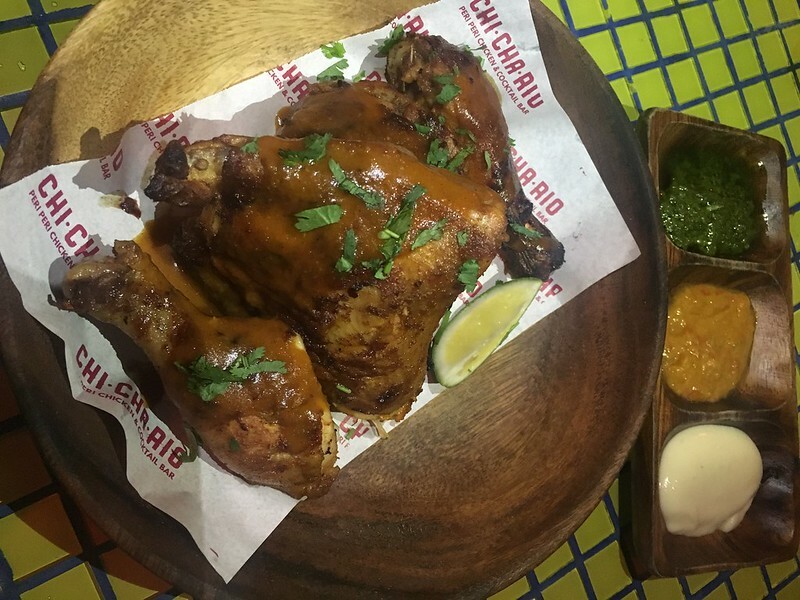 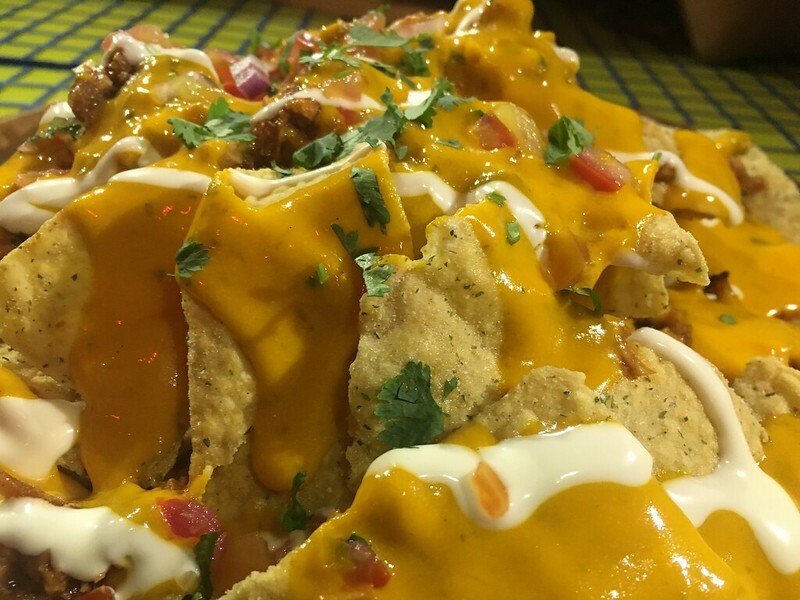 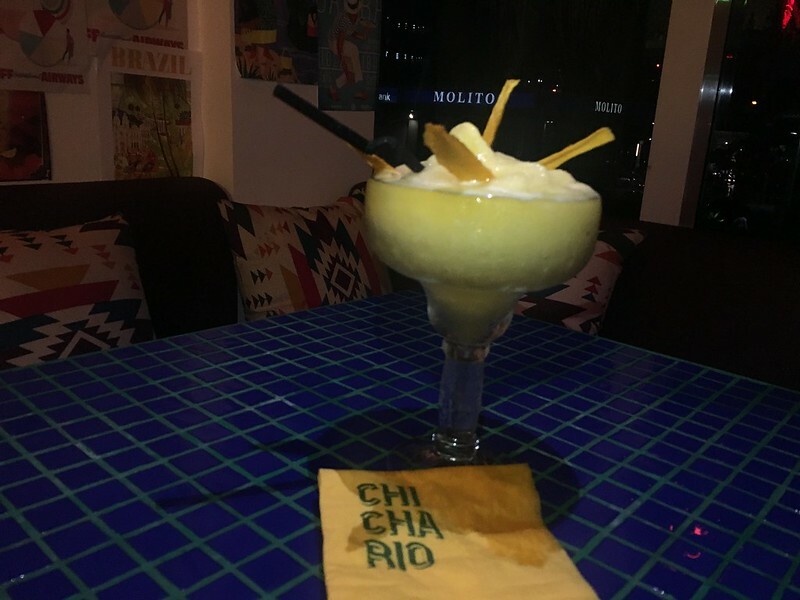 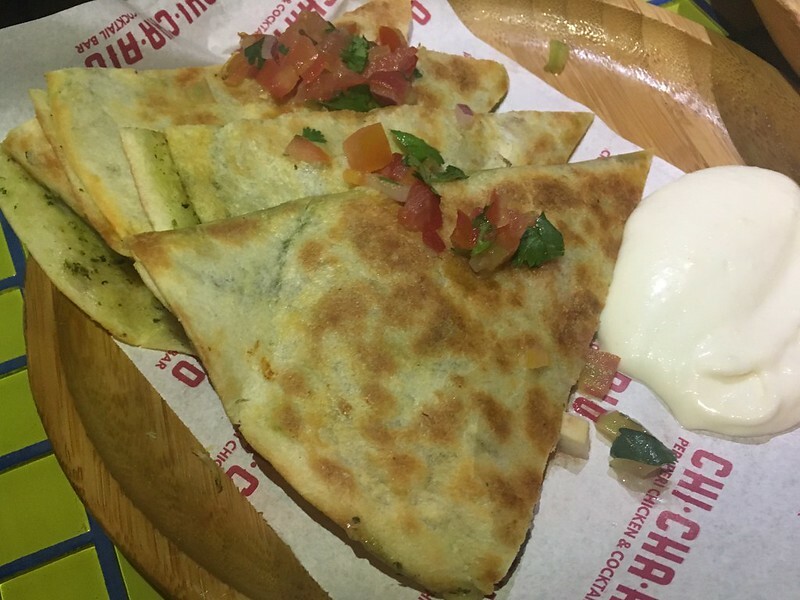 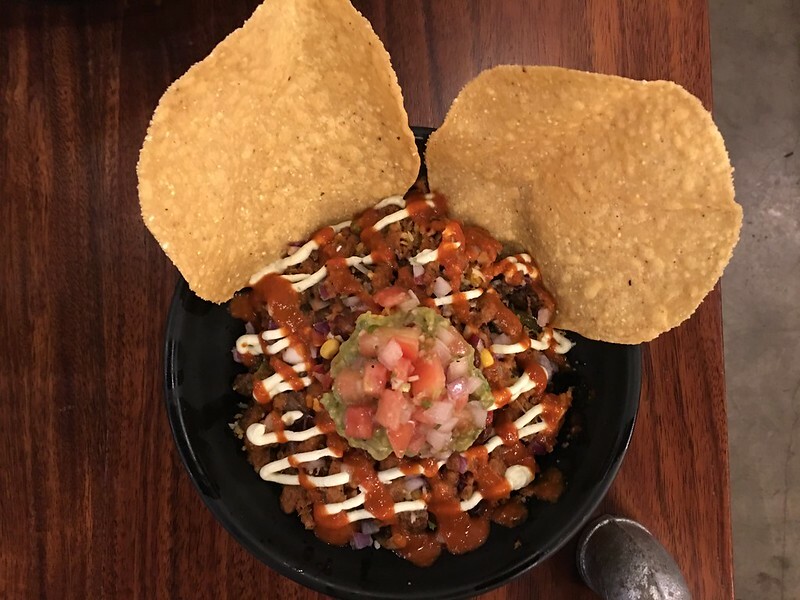 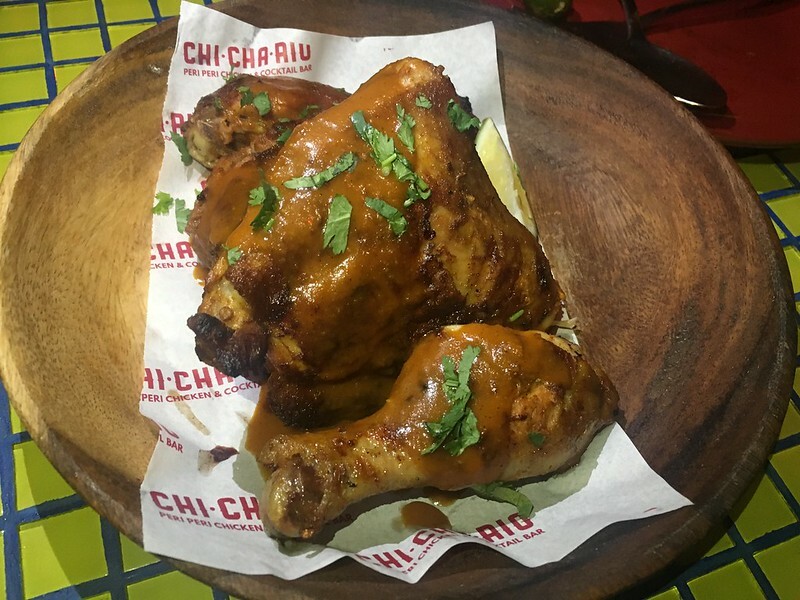 Chiquittos (Php155). 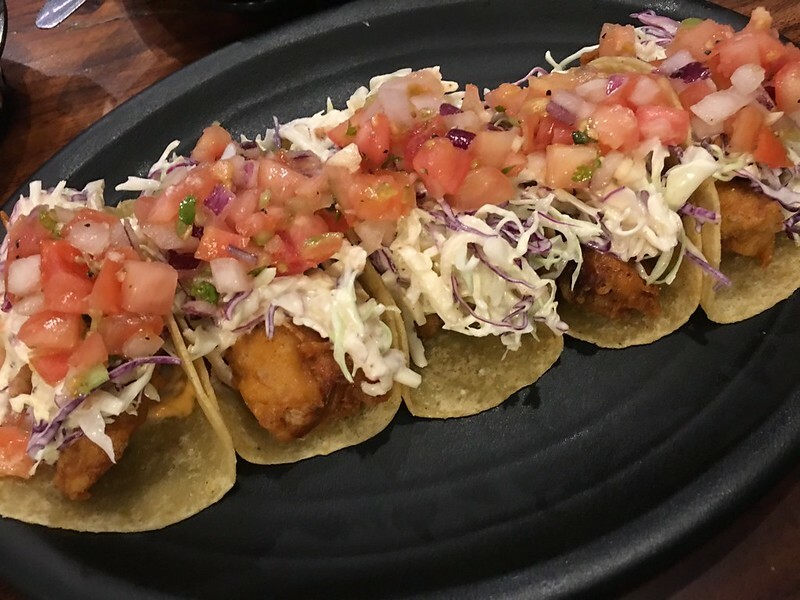 Fried chicken taco done as a deep-fried roll accented by white cheese and Mexican crema. 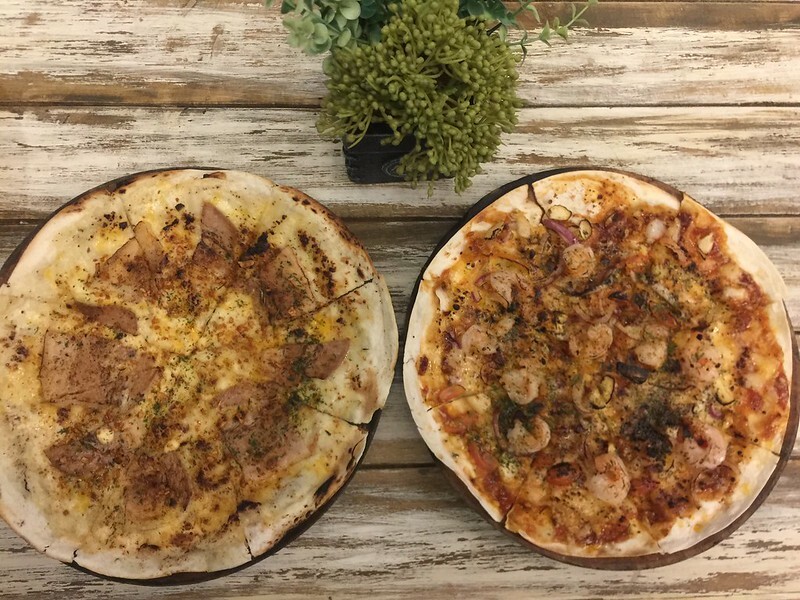 Garlic Shrimp BBQ Pizza (Php325) and Truffle Pork Pizza (Php345). 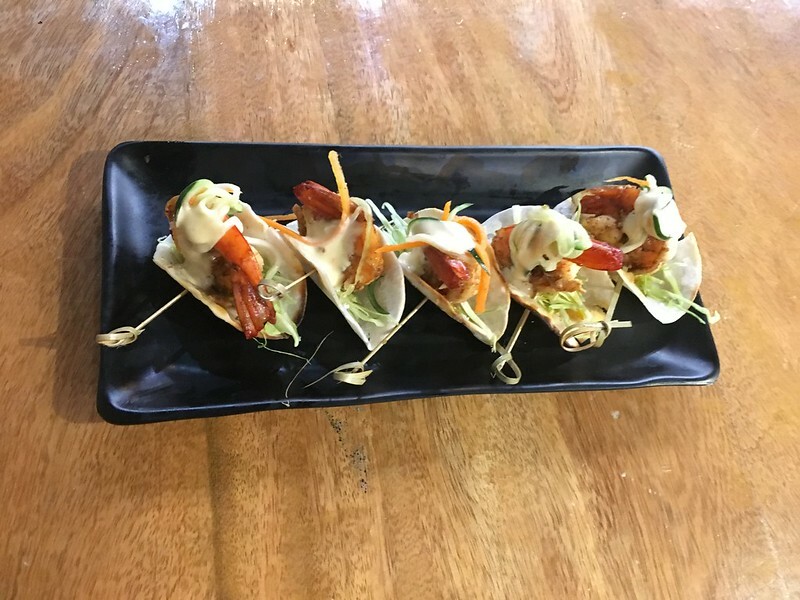 Substituting the normal pizza dough with a flour tortilla, these pizzas give you maximo satisfaction through either the spicy garlicky barbecued shrimp toppings or the strips of pork belly over bechamel sauce together with melted cheeses. 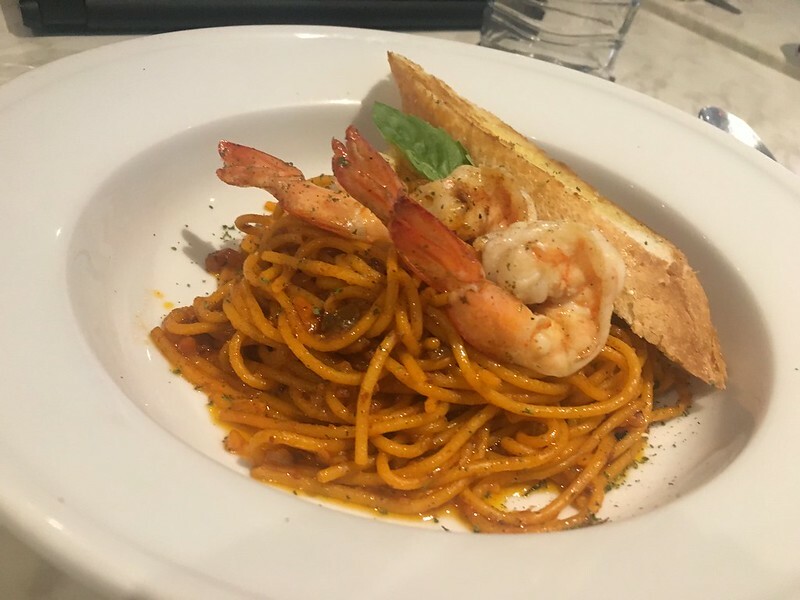 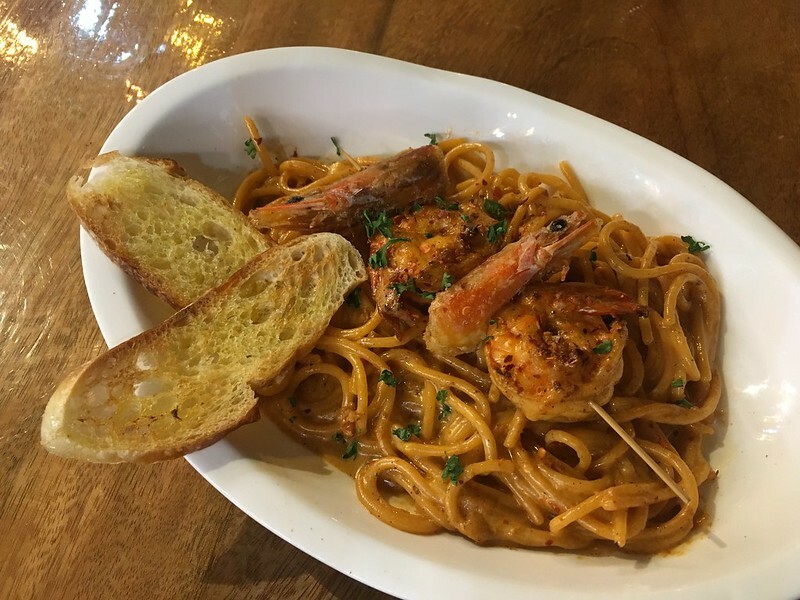 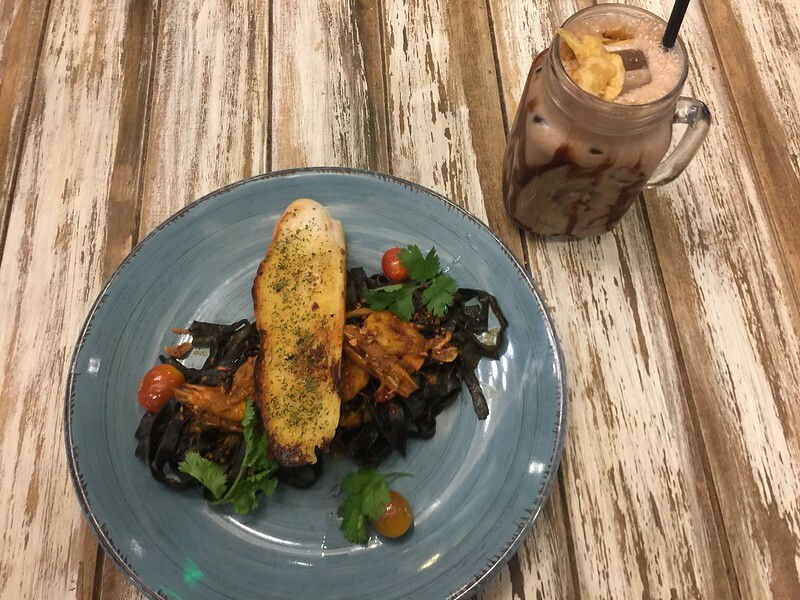 Pasta Negra con Gambas (Php375). 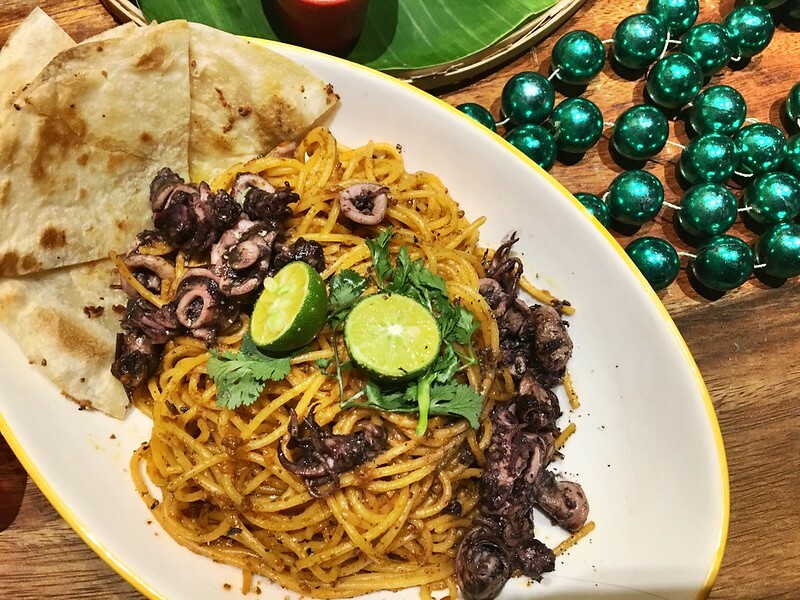 Squid ink linguine tossed with stir-fried prawns marinated in citrus and garlic bits. 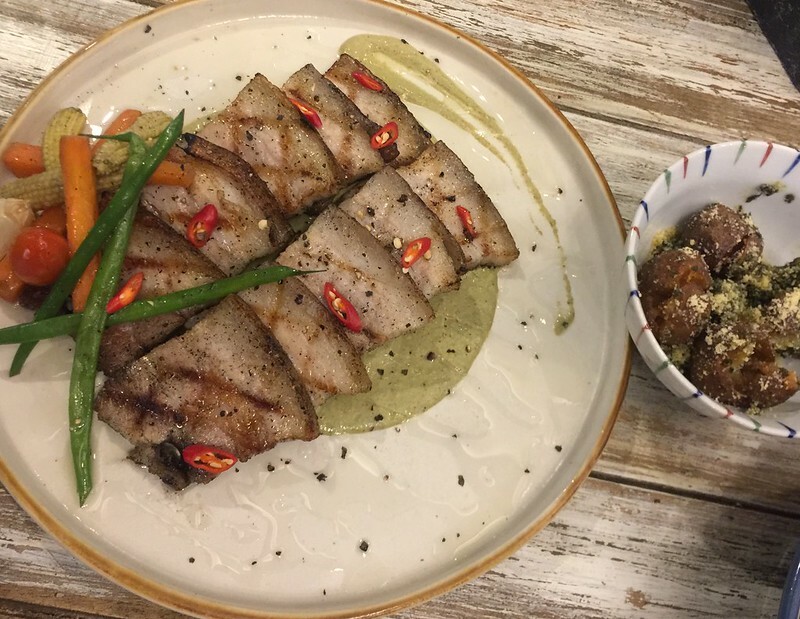 Blackened Tuna Jaw (Php745). 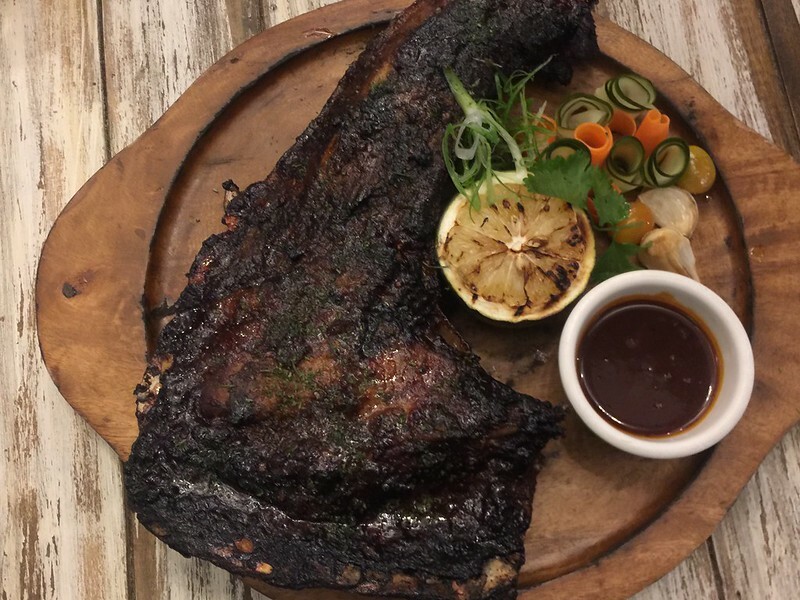 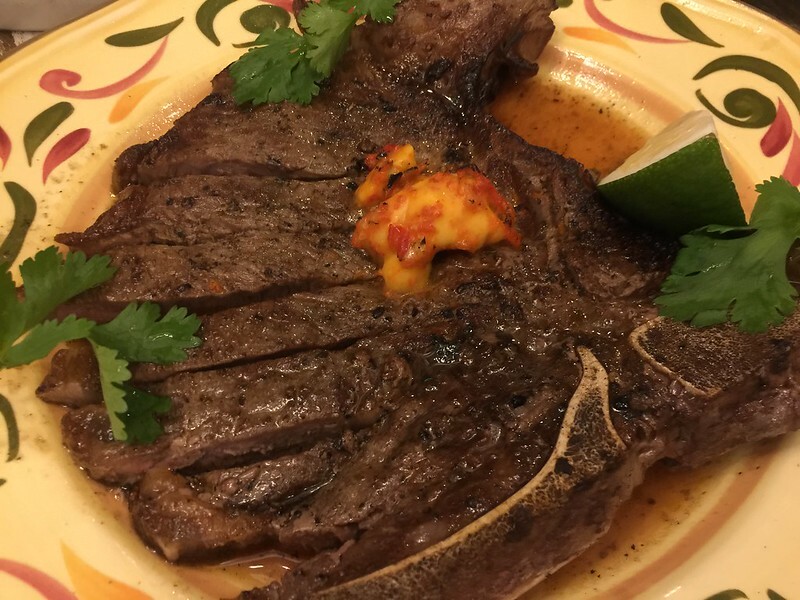 Lava-roasted tuna jaw rubbed with Latin spices served with grilled lime and honey chipotle sauce. 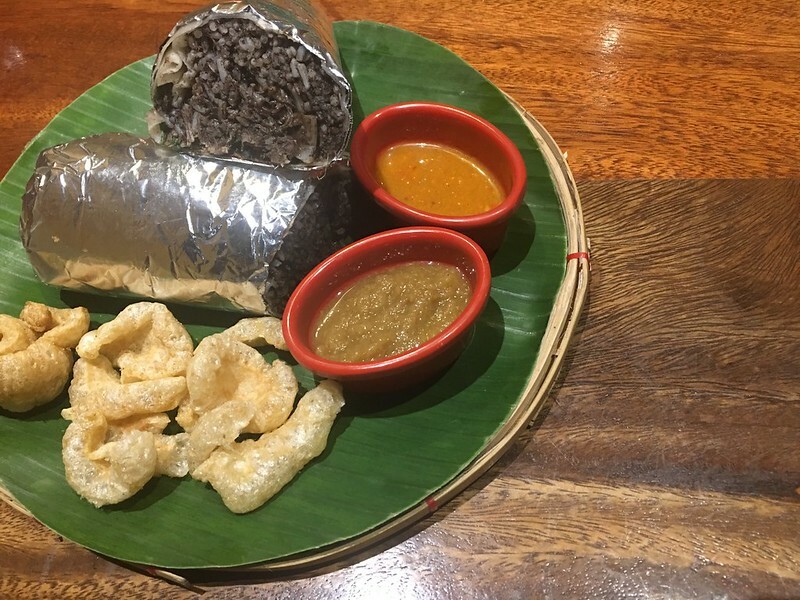 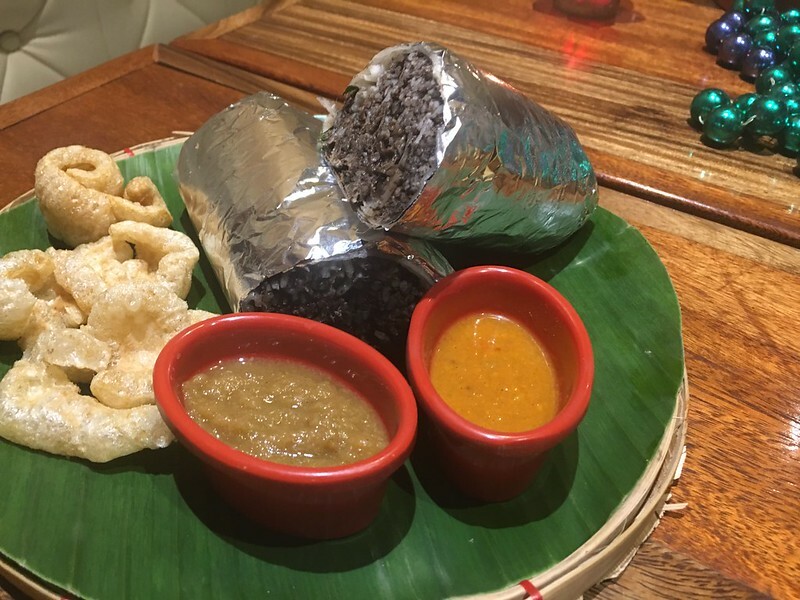 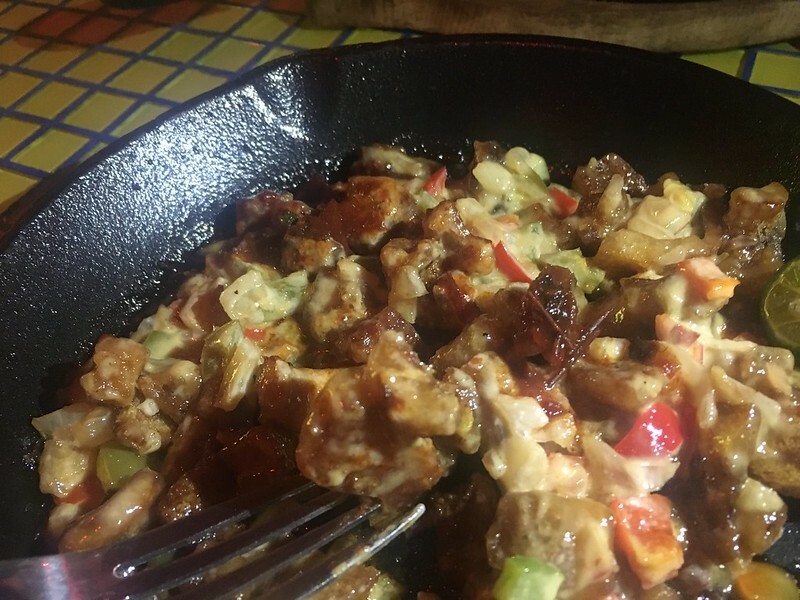 El Puerco ala Brasa (Php395). 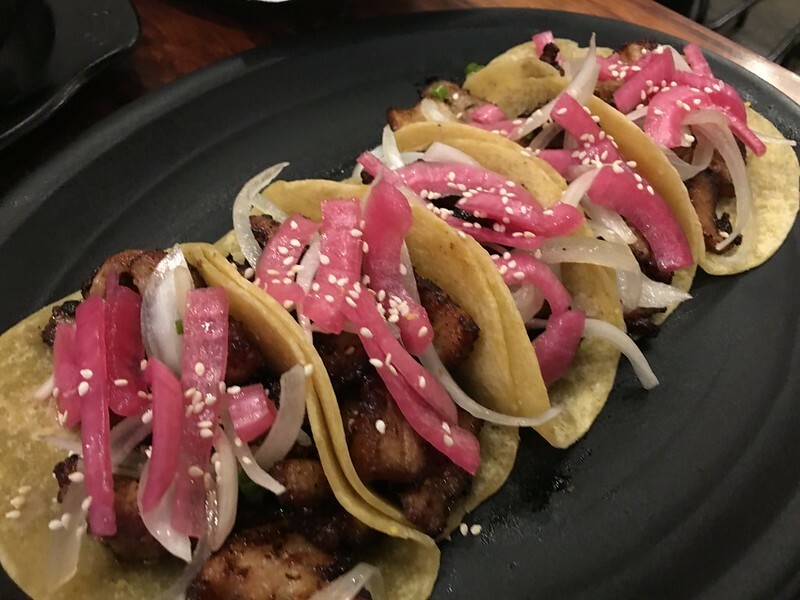 Tender slices of pork belly rubbed with dried red chilis then lava-grilled and topped with mole verde sauce. 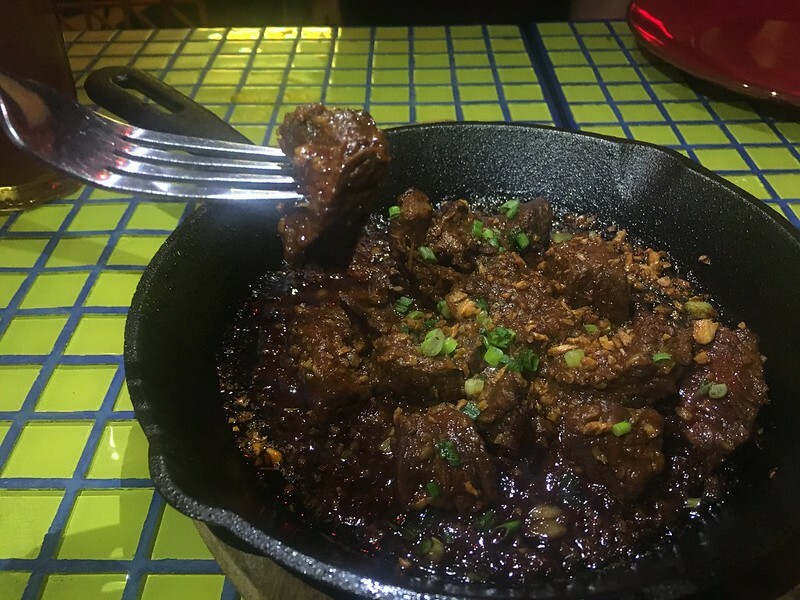 Pan-seared angus steaks served with torched sofrito butter, crispy beef bits, Peruvian pink peppercorn, lime and Latin gravy. 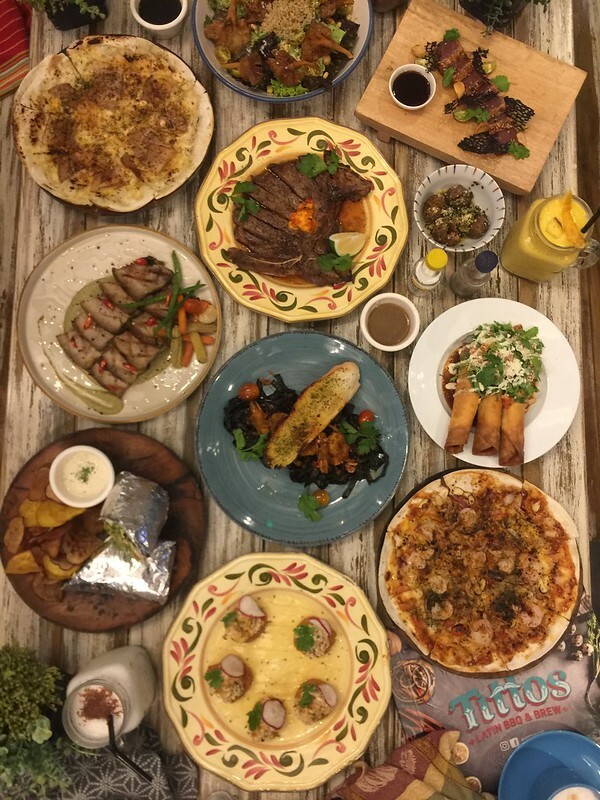 Now, with these new inclusions to the Tittos menu, all the titos and titas have great reasons to come together and grab a bite! 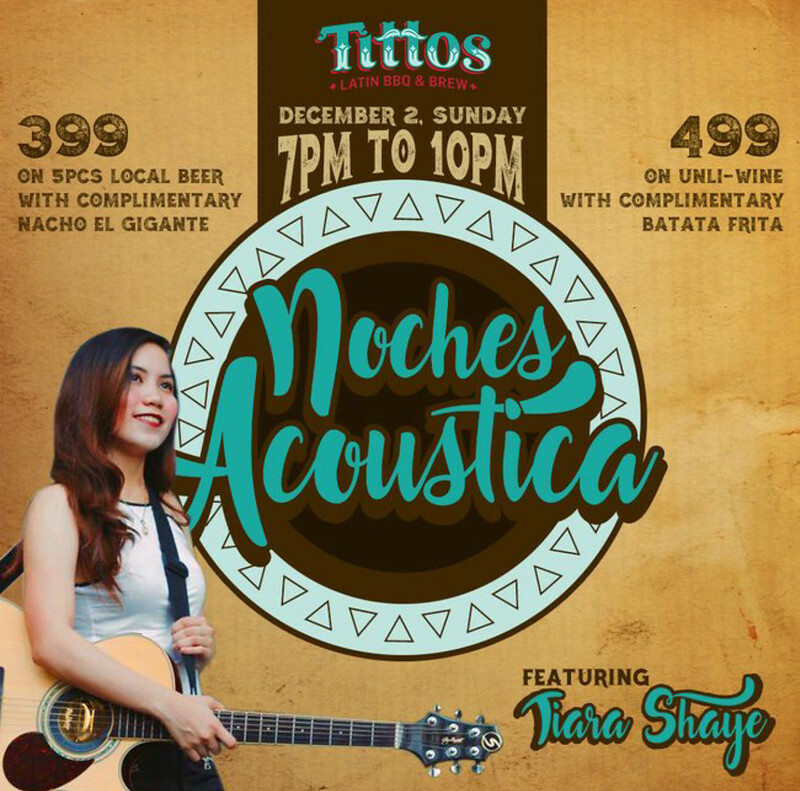 On December 2 from 7pm to 10pm, you can enjoy a Sunday Chill Night with acoustic music artist Tiara Shaye, along with five bottles of local beer and a plate of Nacho El Gigante for only Php399 or unli wine with a serving of Batata Frita for only Php499. 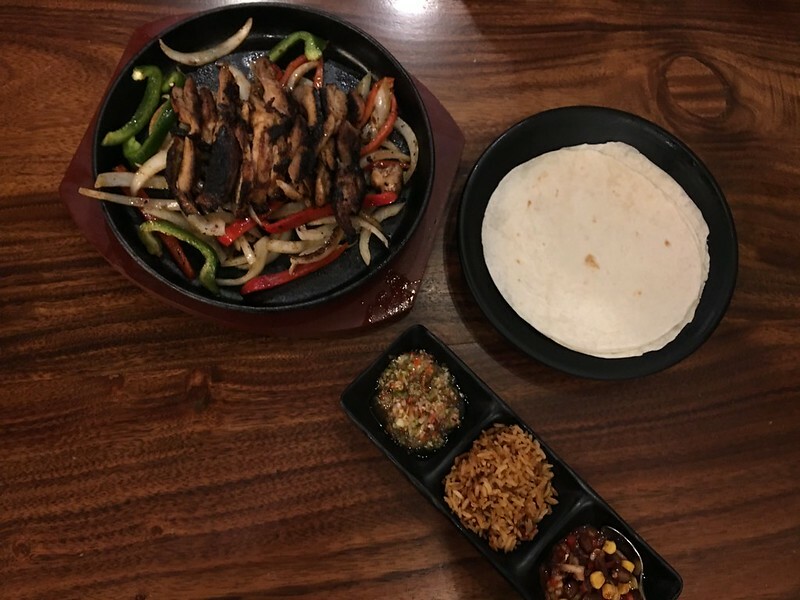 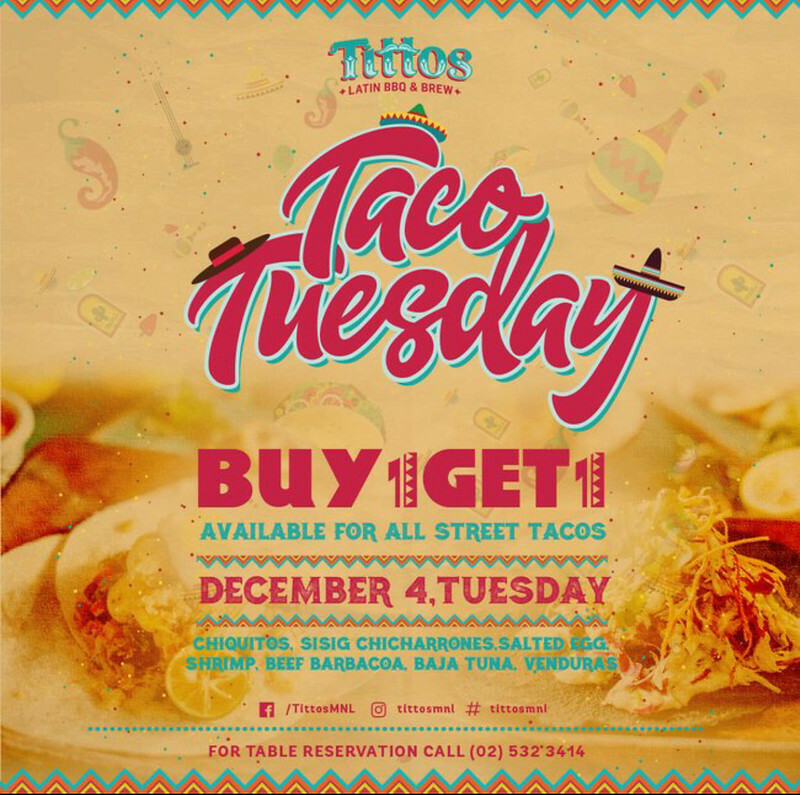 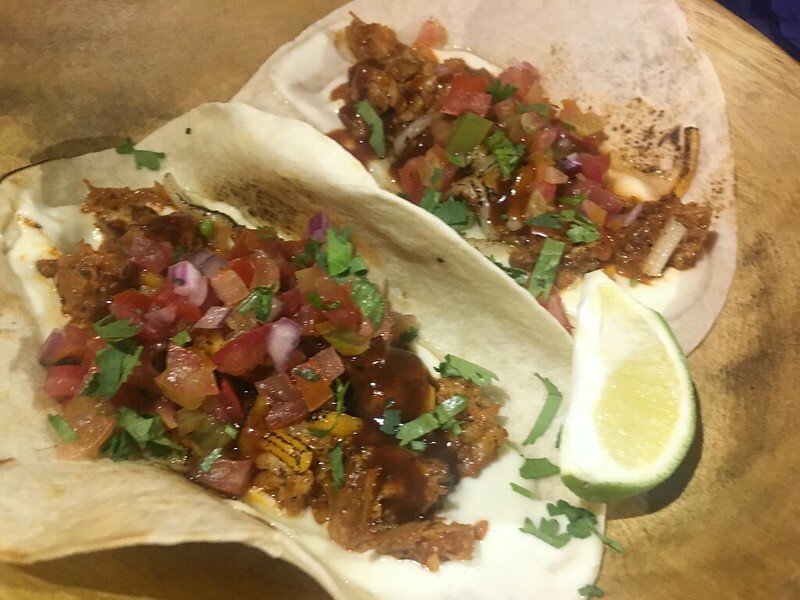 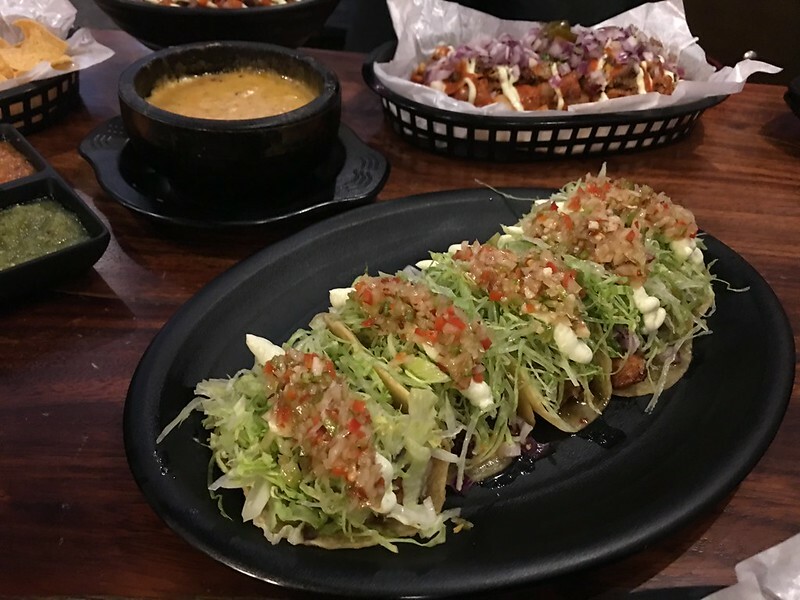 On December 4 – Taco Tuesday- get a Buy 1 Take 1 deal on all street tacos – Chiquittos, Chicharrones, Salted Egg, Shrimp, Beef Barbacoa, Baja Tuna and Venduras. 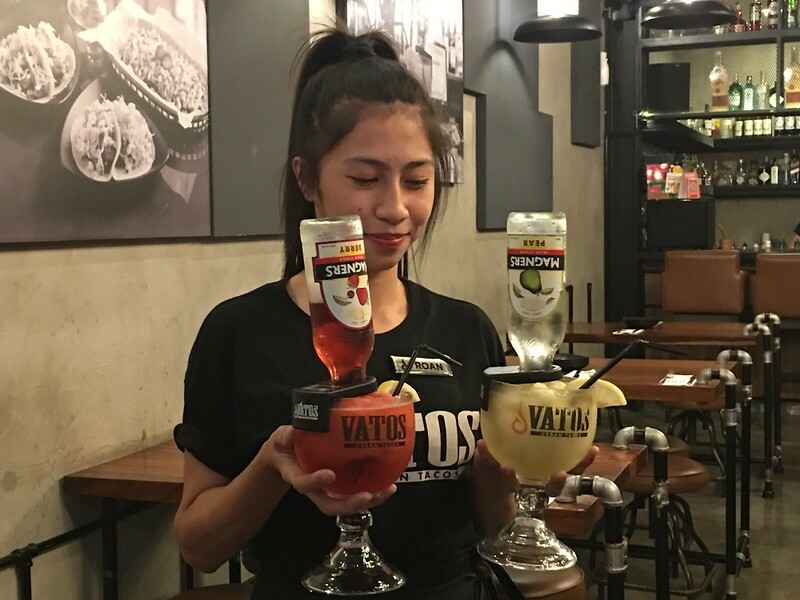 Visit Tittos’ Facebook Page to get updated on upcoming promos and events. 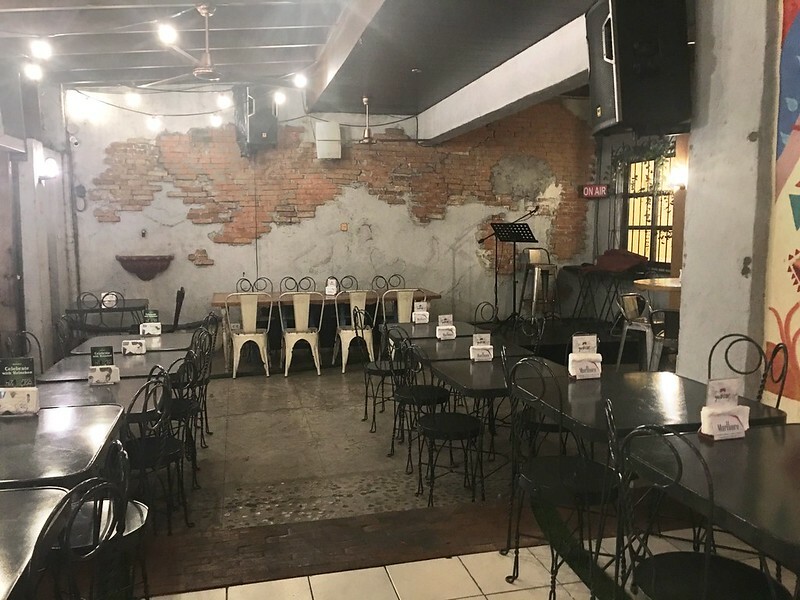 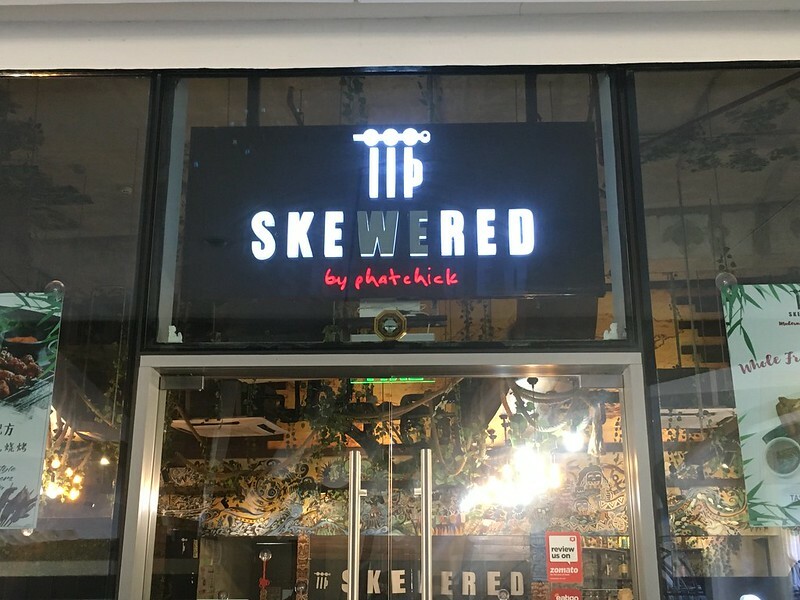 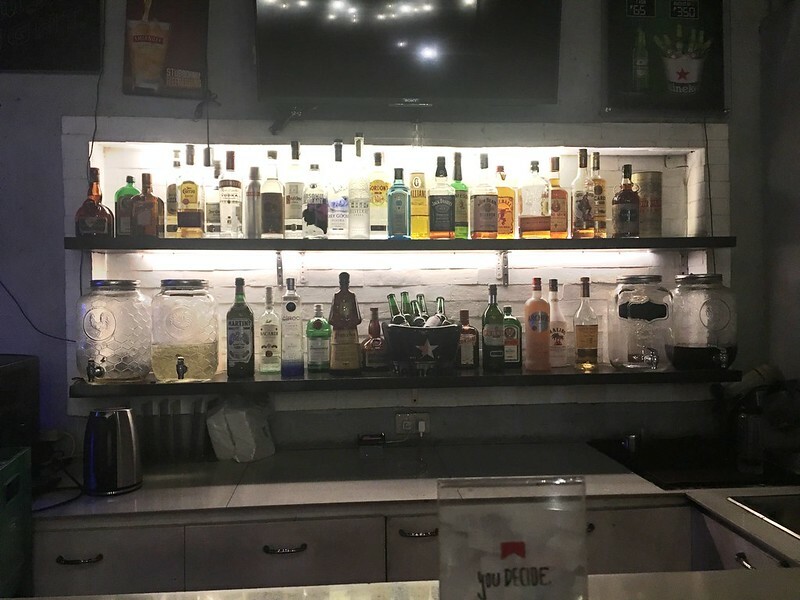 Three: It has a secret bar. 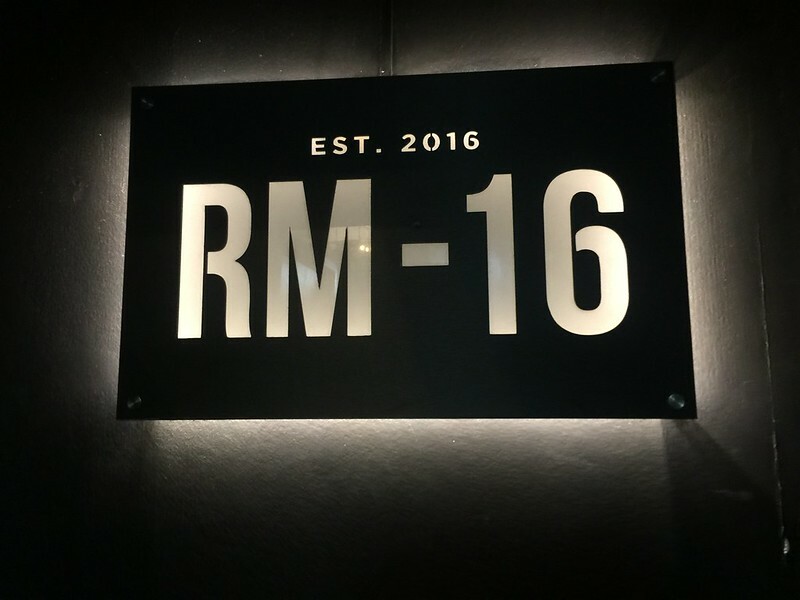 If you’ve ever been at Tittos and wondered what the “Ask for the secret” sign was all about, it’s the bread crumb that will lead you to a secret bar: Rm 16. 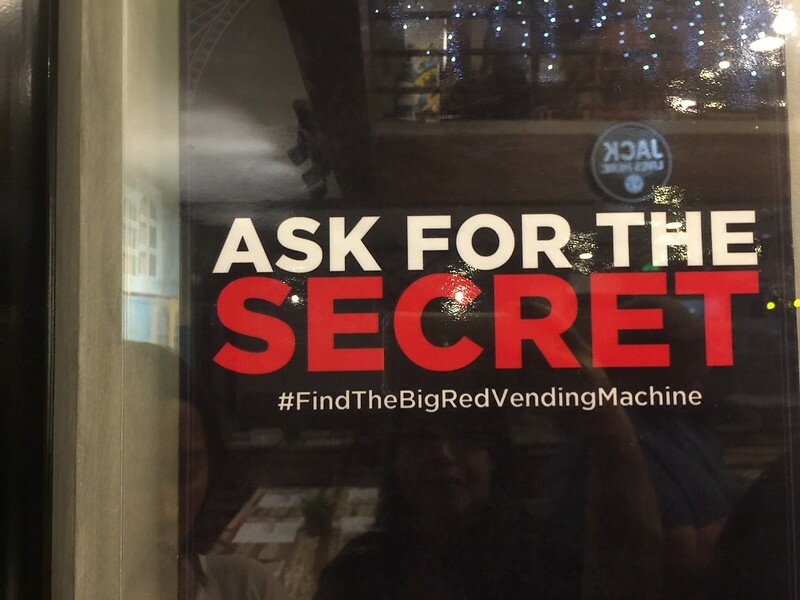 If you titos and titas ever want to disappear for a while to enjoy a drink (or two… or three…), check it out by seeking the big red vending machine, which, similar the closet to Narnia, leads you to a vastly different place: a speakeasy with subdued lighting in contrast to Tittos’ vibrant lights, and that serves cocktails and drinks with some Latin flair. 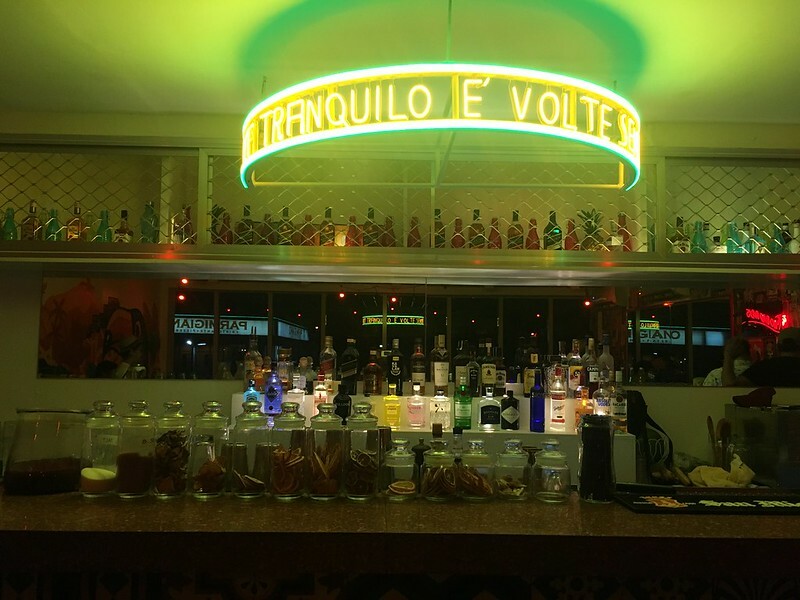 Curious about Tittos yet? 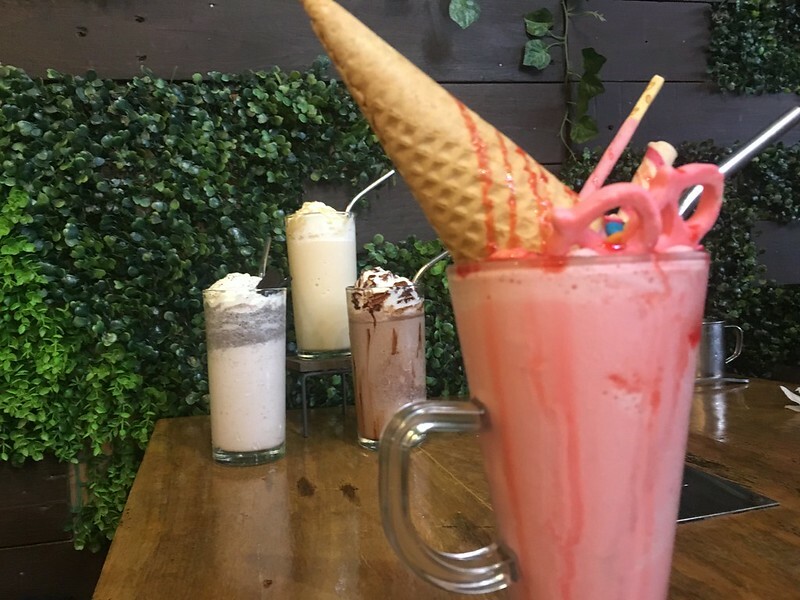 Come on over to 16 East Capitol Drive, Kapitolyo, Pasig City. 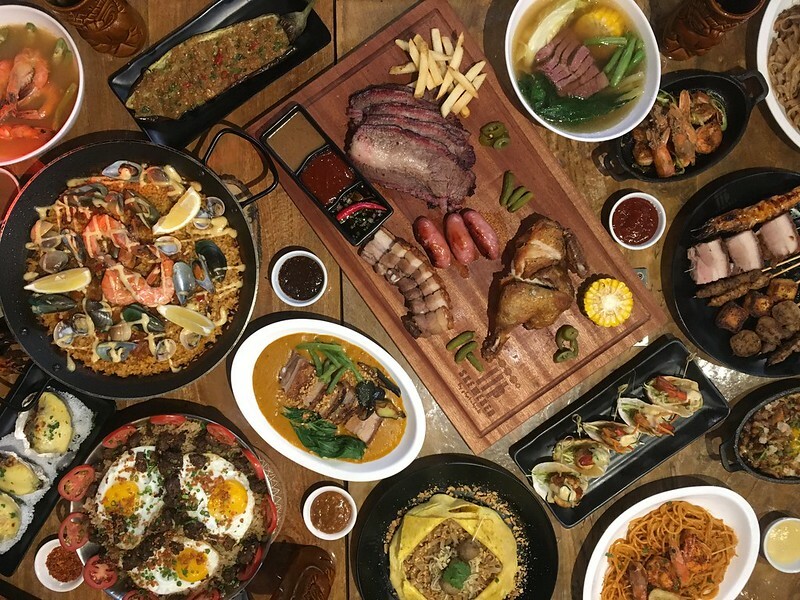 Call +63 2 5323414 for reservations. 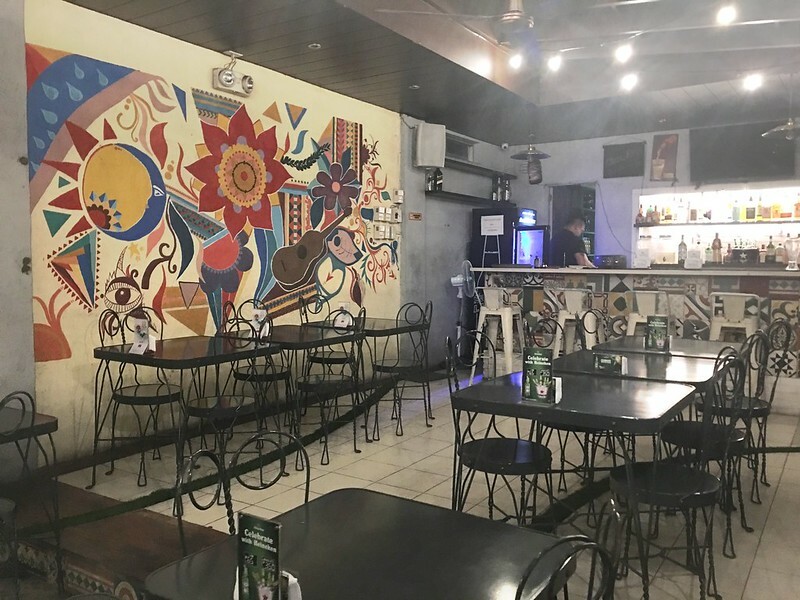 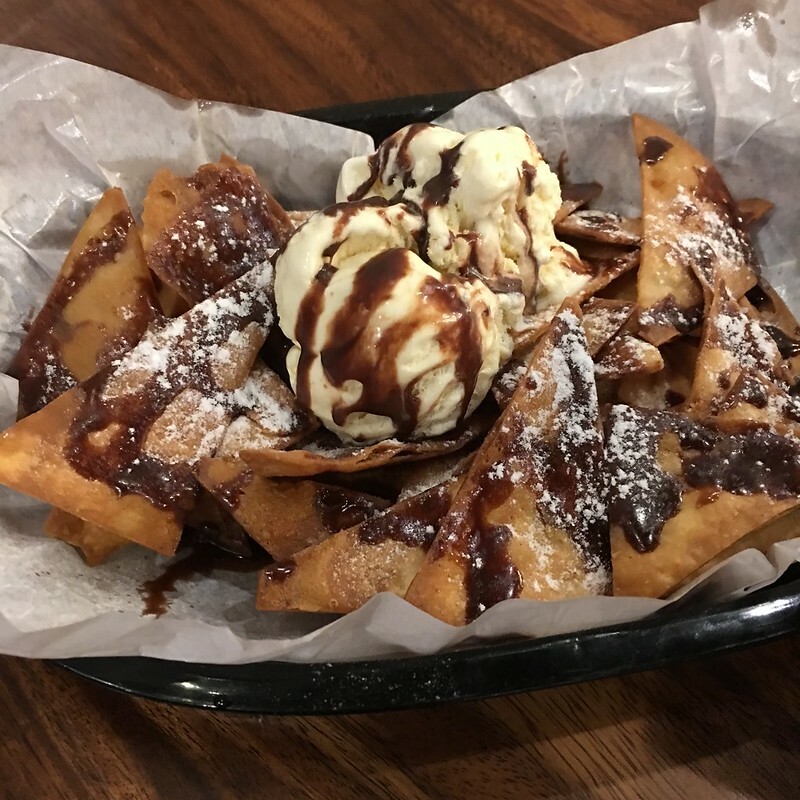 Tittos is open Mondays to Thursdays from 11am to 10pm, Fridays to Saturdays from 11am to 1am and Sundays from 10am to 10pm. 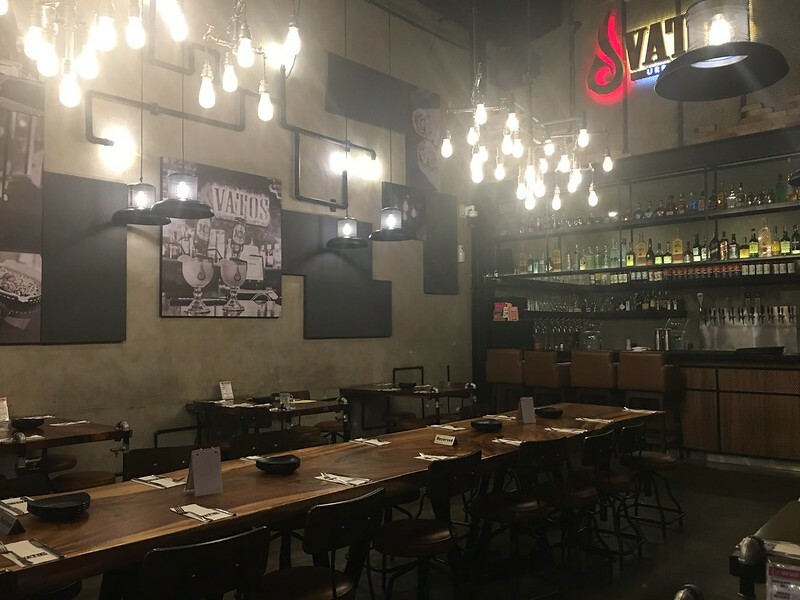 Disclosure: Together with other foodies, I was invited to attend a foodie meetup held in this restaurant. 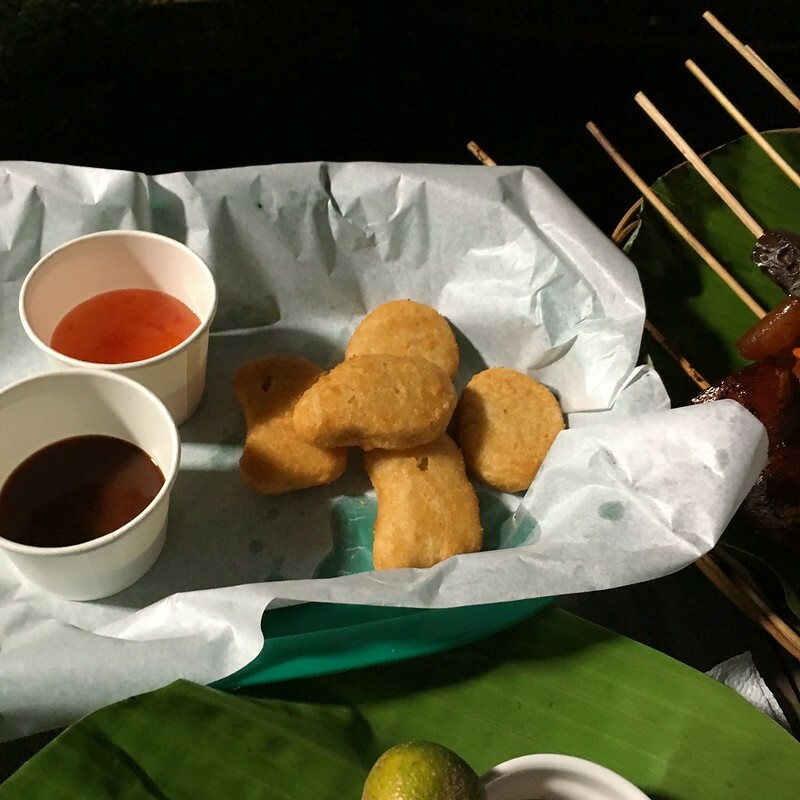 Food items mentioned here were served to allow us to sample the fare and were not paid for by the attendees, including myself.